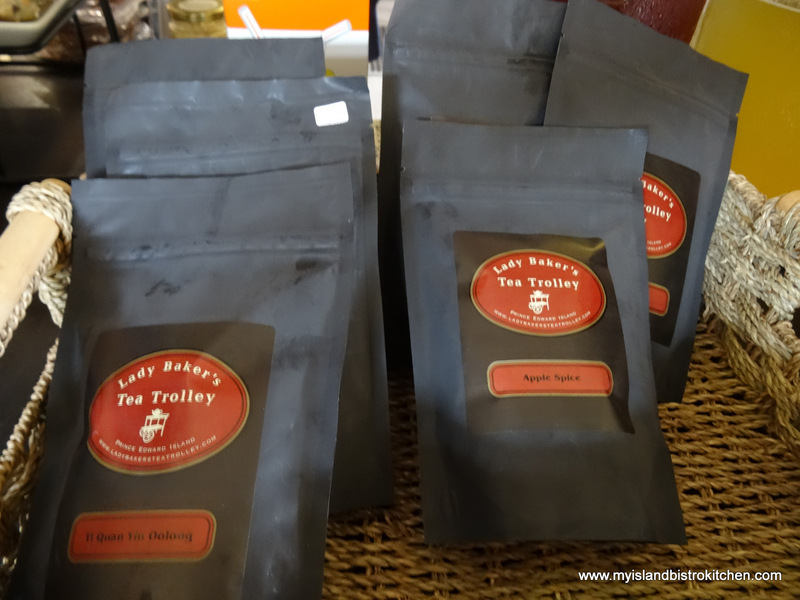 If you are a regular patron of the Charlottetown Farmers’ Market and happen to be a tea drinker, chances are you are familiar with Katherine Burnett and the Lady Baker’s Tea Trolley brand of teas and tea bar at the market. I recently sat down with Katherine for brunch at the farmers’market to learn more about her tea business. Katherine grew up on PEI but lived off Island for many years before returning in 2006. 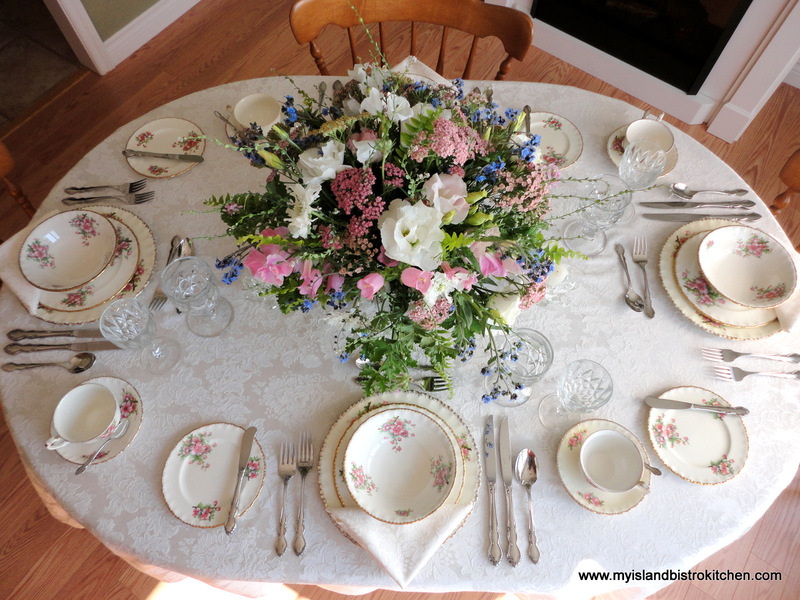 In 2001, while living in Charlotte, NC, Katherine began hosting tea parties as a ministry for the elderly. 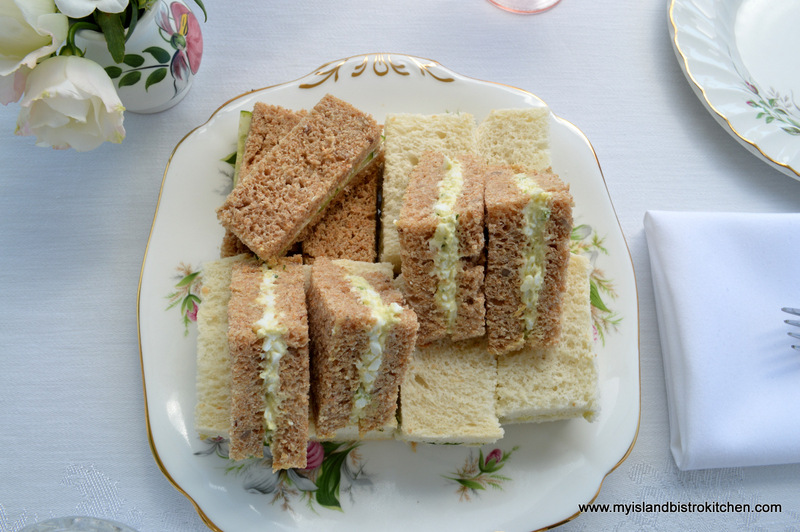 She named her afternoon tea party business “Lady Baker’s Tea Trolley” as a tribute to the memory of a friend, Irene Baker, who enjoyed the finer things in life, like afternoon tea. Interest in the tea parties grew to the point where Katherine was soon hosting afternoon teas for corporations, churches, and even the opera. As her tea party business grew so, too, did her interest and knowledge in all things tea-related. She pursued online courses in tea blending and attended specialty tea conferences and is now at level 3 (of 4) of the process to be designated a tea sommelier. Katherine is also a member of the Tea Association of Canada. In the fall of 2007, with just 16 varieties of tea and 2 tea-making machines, Katherine set up a tea bar at the popular Charlottetown Farmers’ Market. The teas come from the major tea-producing countries of India, China, Japan, Sri Lanka, South Africa, and Taiwan. The imported teas follow strict guidelines, are low in pesticides, and most come from members of the Ethical Tea Partnerships. Katherine blends some of the teas herself and now sells some 60 varieties of loose tea. 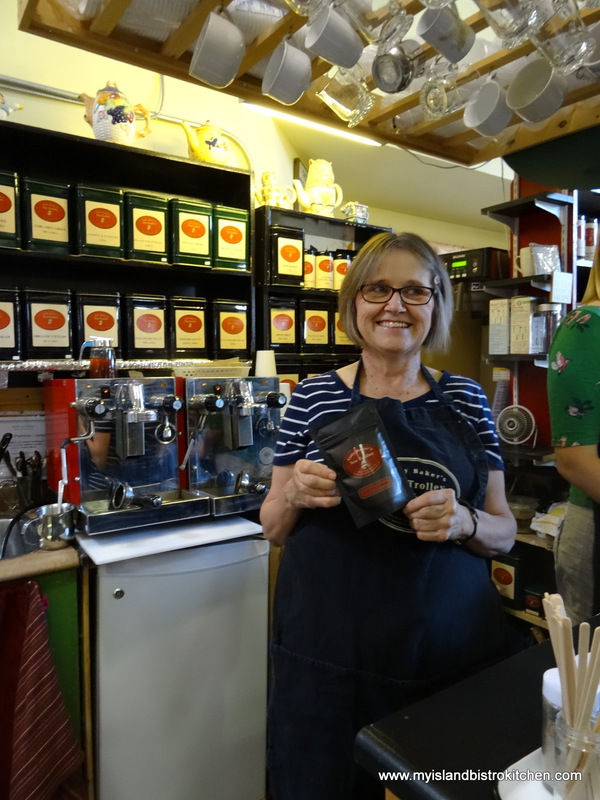 She tells me her most popular blend, which incidentally is her personal favourite, is a black tea she calls the Lady’s Slipper Blend, aptly named after PEI’s official provincial flower. Her pumpkin spice blend enjoys popularity as well with her patrons who favour it for lattes. 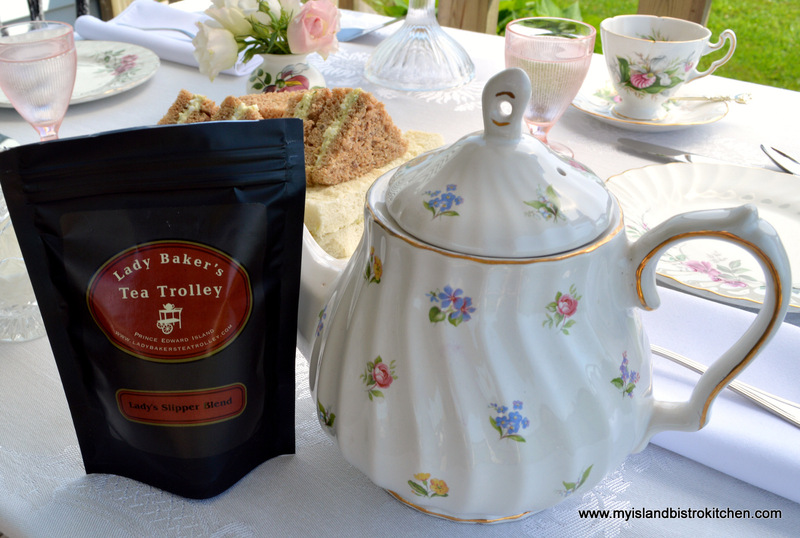 At the Lady Baker’s Tea Trolley bar at the market, look for specialty tea blends like Abegweit Lullaby to aid sleep and Pink Lady Grey which is an eye-appealing blend featuring Earl Grey tea and pink rose petals. Who knew where a small, modest personal collection of 13 china cups and saucers would lead Katherine! Since there are several options to brewing tea (e.g., tea bags, loose leaf with infuser or loose tea directly in the tea pot), I asked Katherine for her preference. She says she prefers to brew loose leaf tea in an infuser in the tea pot. Katherine also recommends that the water for the tea first be filtered and then brought to a boil. If brewing green tea, let the water sit until it drops to the proper temperature (85°) before adding and brewing the tea leaves. I asked Katherine if she sees any trends emerging in tea drinking. She says she is noticing a renewed popularity in tea drinking with specialty tea shops opening and with the wide variety of tea-brewing equipment and stylish infuser mugs readily available. As well, she notices an increased interest in green teas with information and research on its health benefits becoming more widely known. 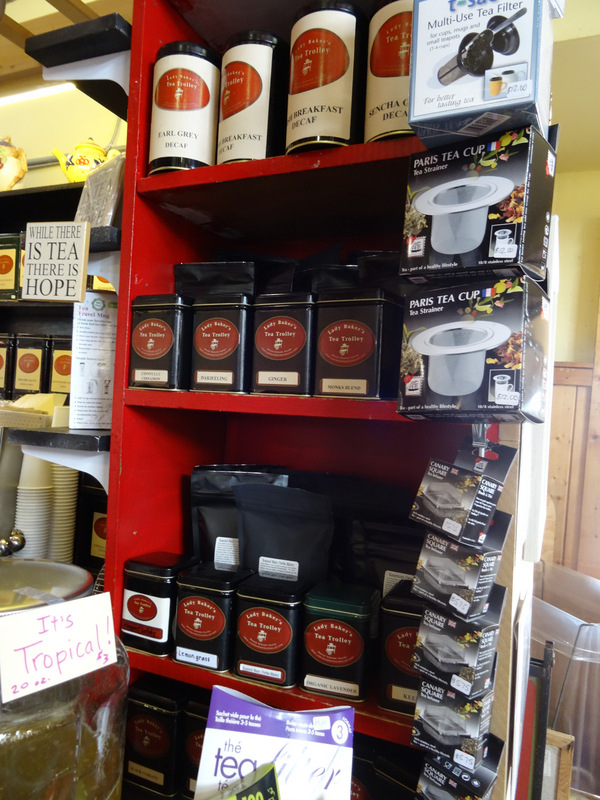 Additionally, there seems to be a new market for teas – those of high school and college age. In fact, this year Katherine prepared special tea packages to be included in the UPEI student welcome kits. 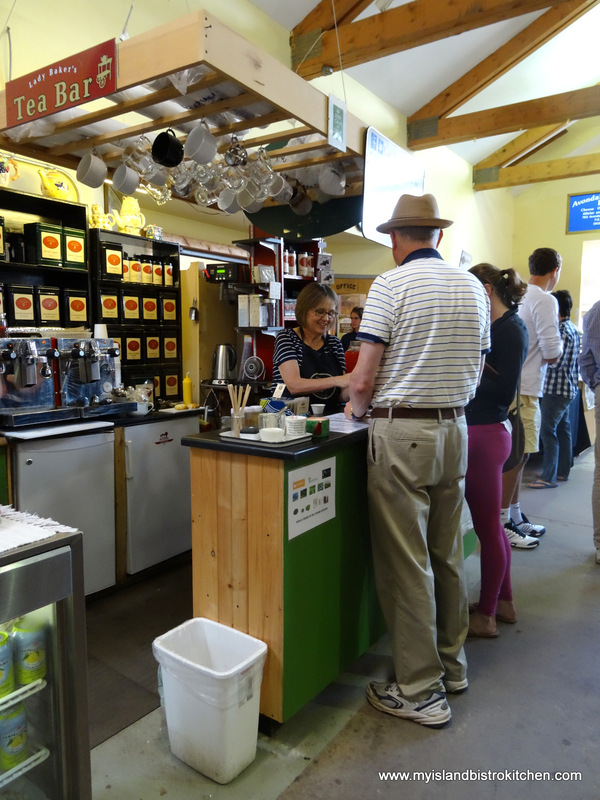 With the university being located just across the street from the farmers’ market, it’s likely some of the students will visit the Lady Baker’s Tea Trolley bar on Saturday mornings. Katherine also sees more tea being used in ways other than as a beverage. For example, Chai and Matcha are now often used in baked goods such as muffins and energy bars. In fact, Katherine sells yummy homemade tea energy bars at her booth. 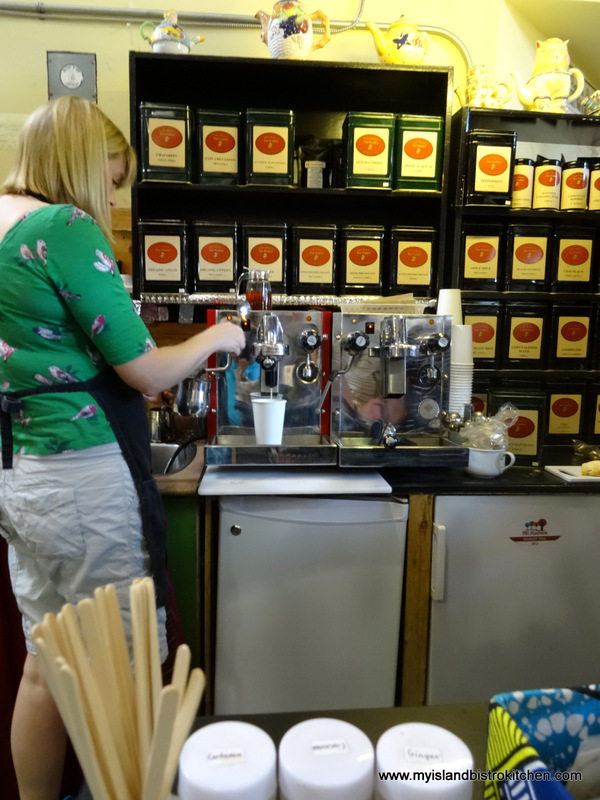 Tea lattes are also becoming very popular — ⅔ cup of a strong tea topped up with ⅓ cup of foamed milk. 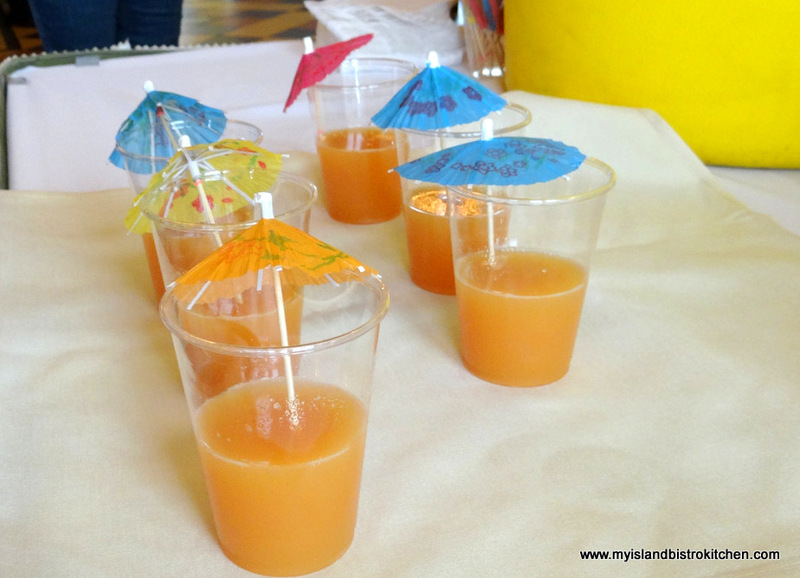 Iced teas remain popular in the hot summer months when many find the drink hydrating and refreshing. Fruit blends of green teas, such as Katherine’s Island Strawberry blend, have become very popular iced teas. 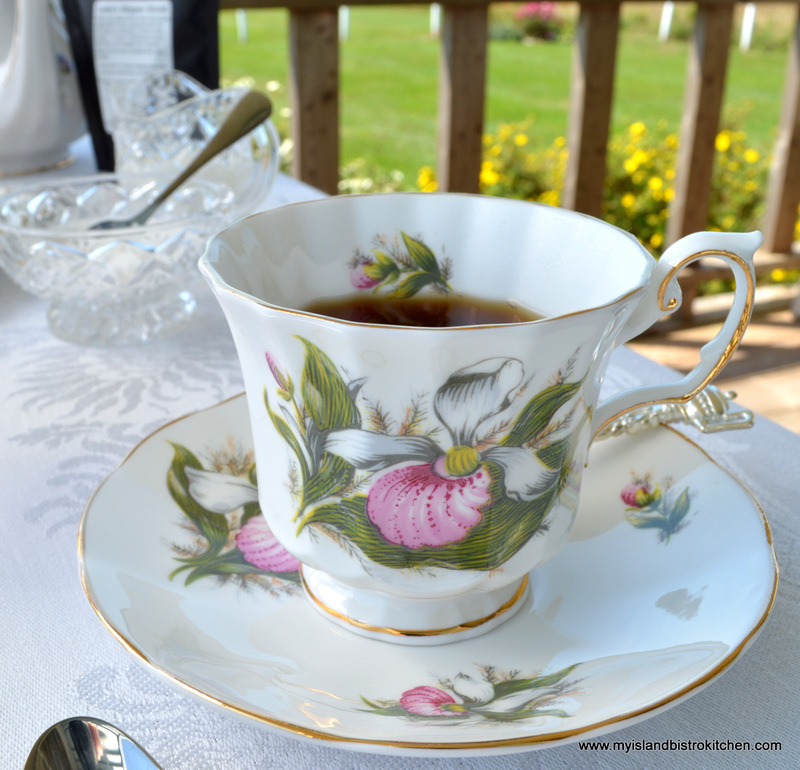 Tea, like coffee, is an enduring popular drink. It’s a beverage that is moving with the times. With its various varieties and blends along with new ways of drinking tea and using it in baking, it’s proof of tradition blending successfully with modern trends. Now, it’s time for tea! 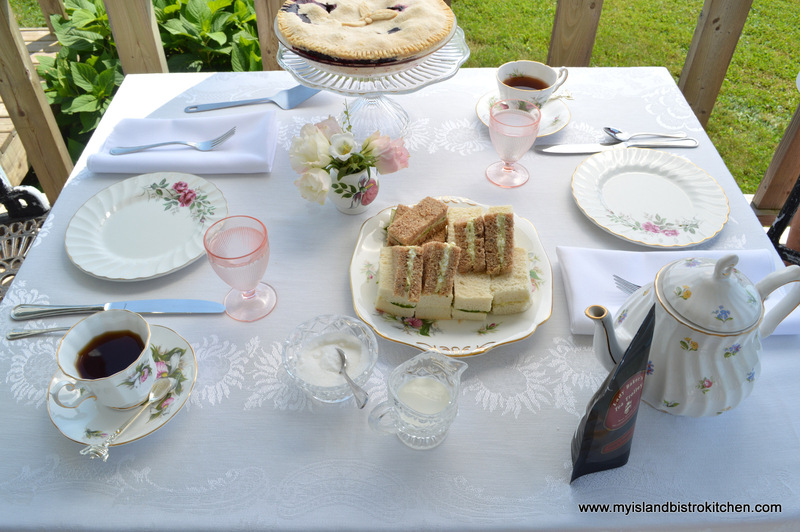 I decided to try the Lady’s Slipper tea blend for a late summer afternoon tea. This is a lovely, mellow tea blend with hints of vanilla. 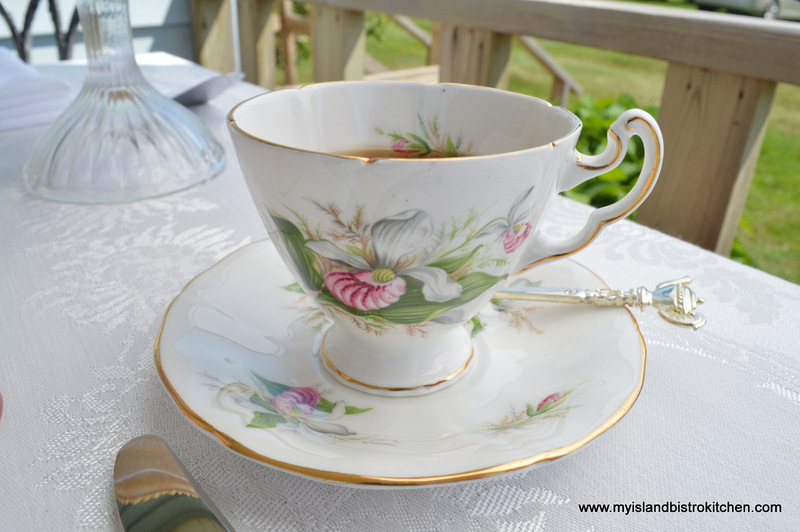 I have some pieces of Lady’s Slipper china so it seemed only fitting to feature them with this blend of tea. 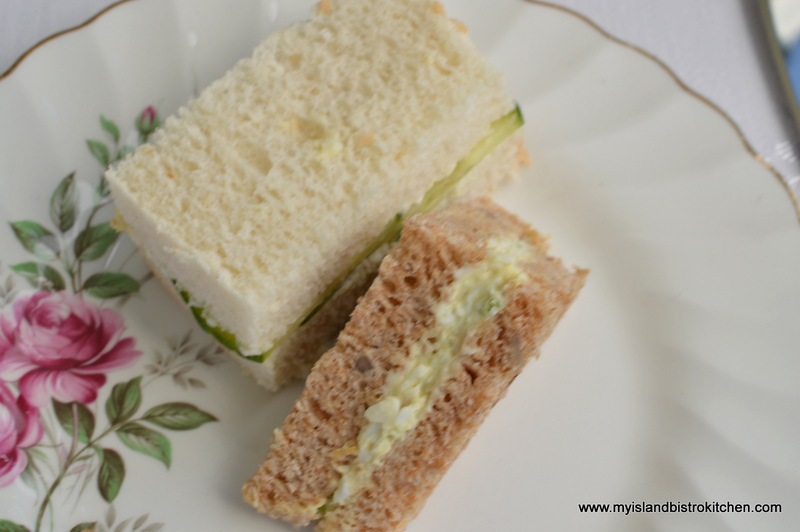 The quintessential tea time sandwiches of egg salad and cucumber were served on my Lady Slipper plate. 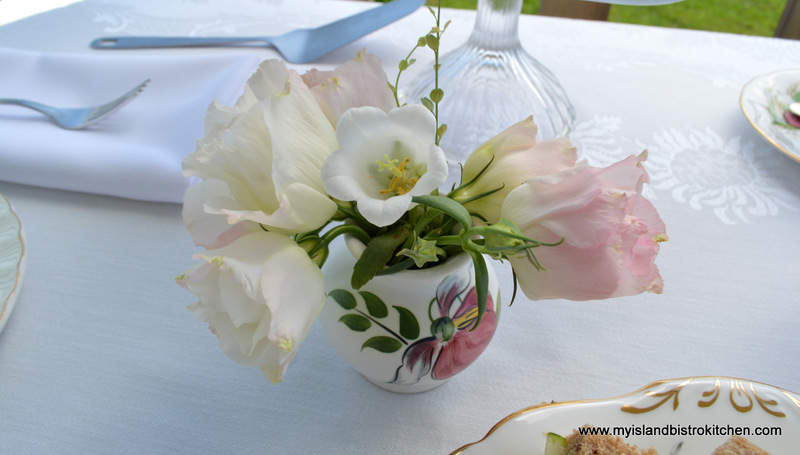 I used two different styles of Lady’s Slipper china cups and saucers. 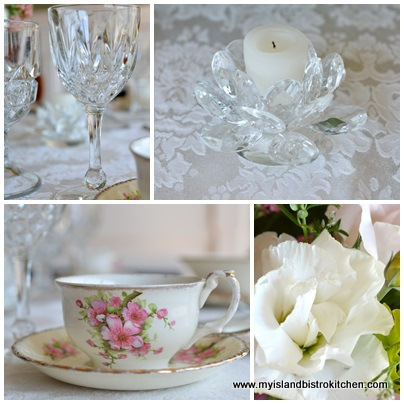 The great thing about afternoon tea is that several different pieces of china can be blended and used with success. Not everything has to match perfectly on the table. It just needs to blend. 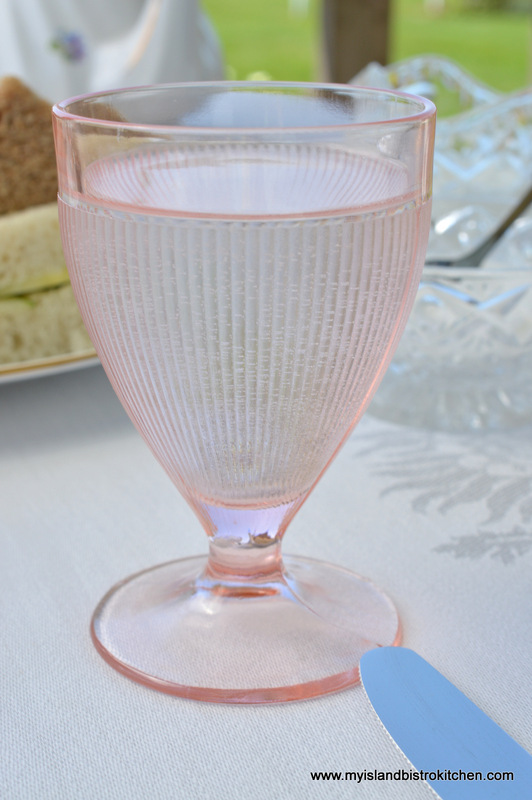 These dainty little pink glasses blend well with the china and are the perfect size for an afternoon tea table. The little pottery Lady’s Slipper vase in the photo below was a gift from an elementary school teacher. We had gone on an end of year school outing to a local theme park which had a small gift shop in a flying saucer (readers on PEI will likely guess which theme park I’m referring to). The teacher told us each to pick out something we wanted and it was her gift to us. Even as a small child, I liked pretty things and opted for a vase instead of a toy! I won’t tell you how many years ago that was but let’s just say it wasn’t yesterday! 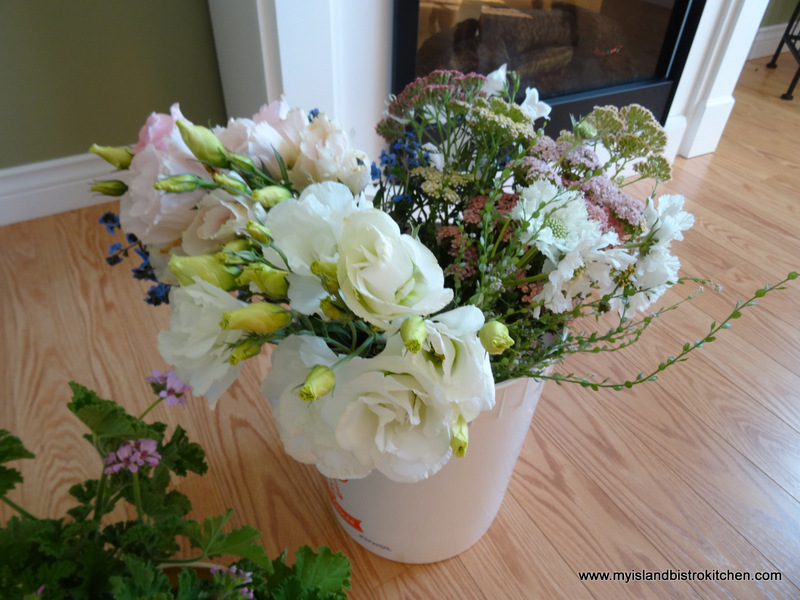 The lovely flowers in the vase are from Island Meadow Farms in York, PEI. 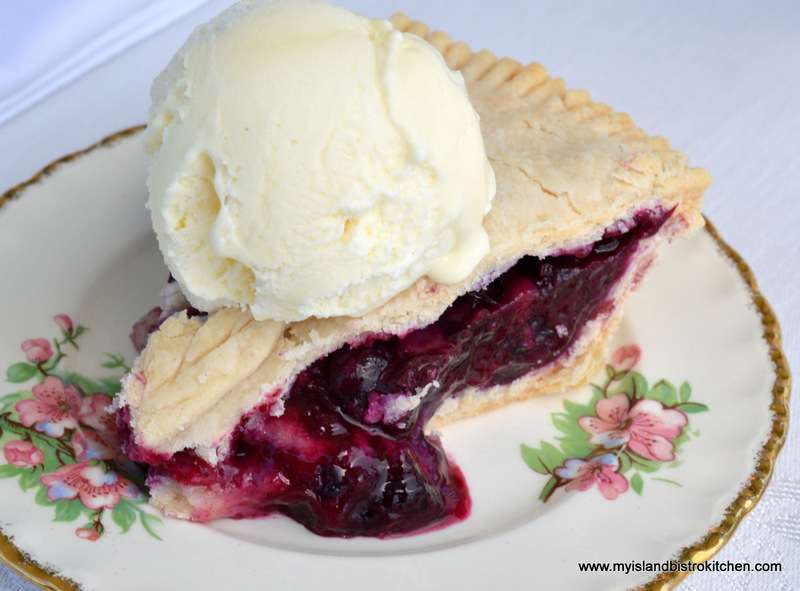 Fresh blueberry pie and vanilla ice cream for dessert! 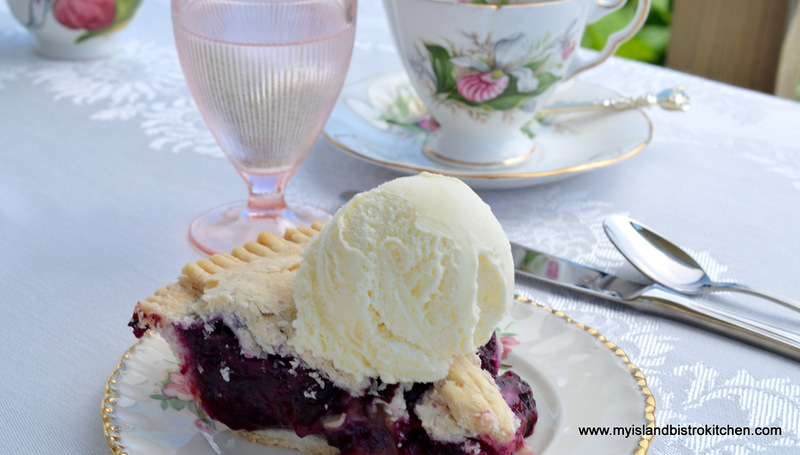 The blueberries for the pie came from Murray’s U-pick in North Tryon. 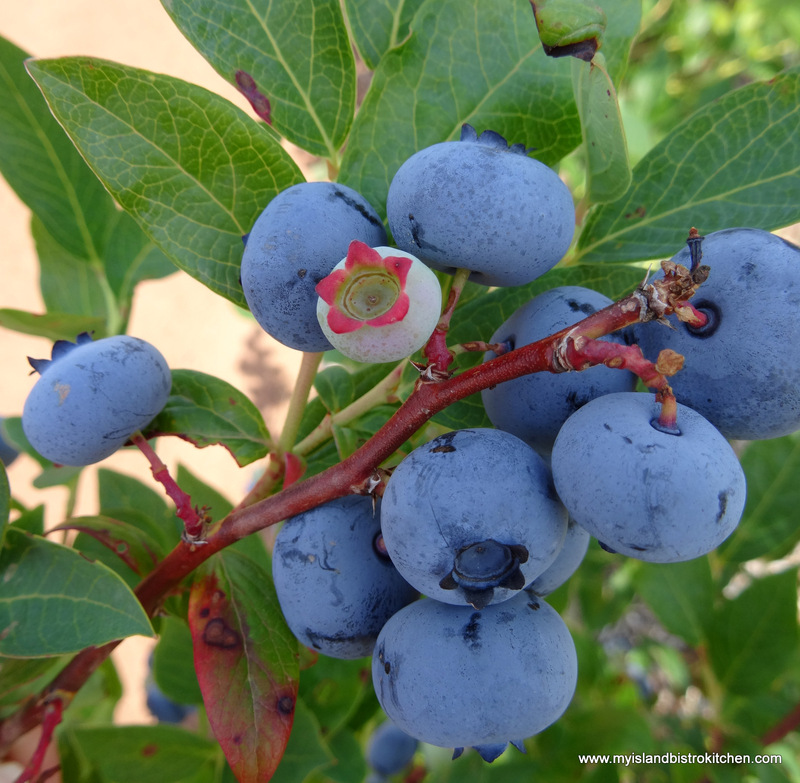 They grow wonderful high bush blueberries. I hope you have enjoyed meeting the lady behind Lady Baker’s Tea Trolley and dropping by for a spot of her Lady’s Slipper tea blend. 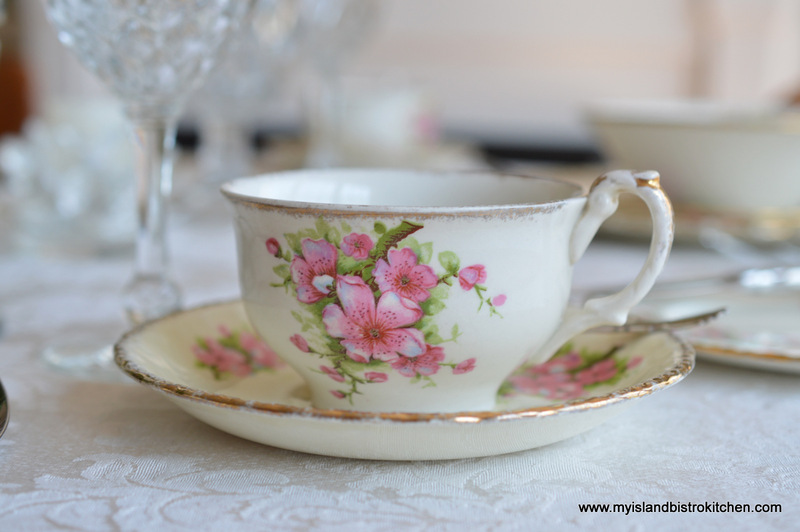 I will be joining Sandi at Rose Chintz Cottage for Tea Time Tuesday this week. 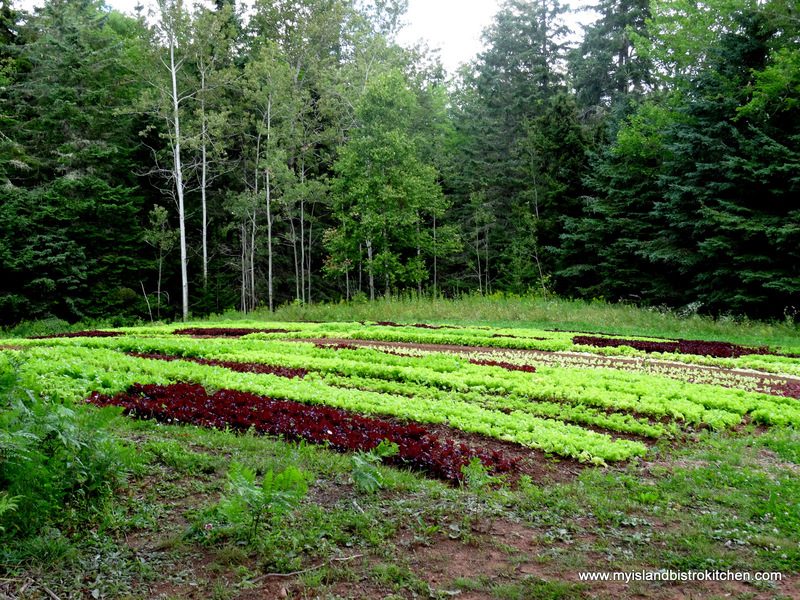 This being national organic week in Canada, I thought it was timely to pay a visit to a farmer who grows vegetables the natural way without chemicals. 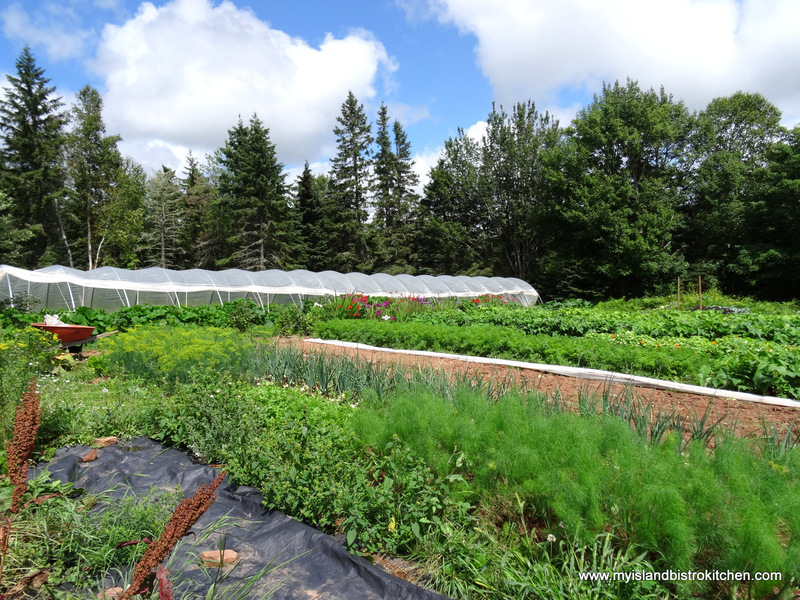 So, our visit today takes us to Just A Little Farm on the Green Road, near Bonshaw, PEI, where we meet farmer Jessica Vos. When asked why she chose life as a farmer, Jessica explains that she grew up on a farm, worked in community gardens while in university, owned a landscaping business in Western Canada, is genuinely interested in food, and is happiest when outside working in the soil. Jessica has a degree in Human Ecology with a minor in nutrition and she is currently studying holistic nutrition. 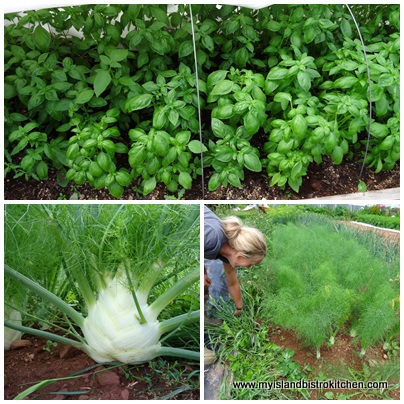 It’s amazing how many varieties of vegetables and herbs Jessica grows. It would be a shorter list if you ask her what she doesn’t grow than what she does! 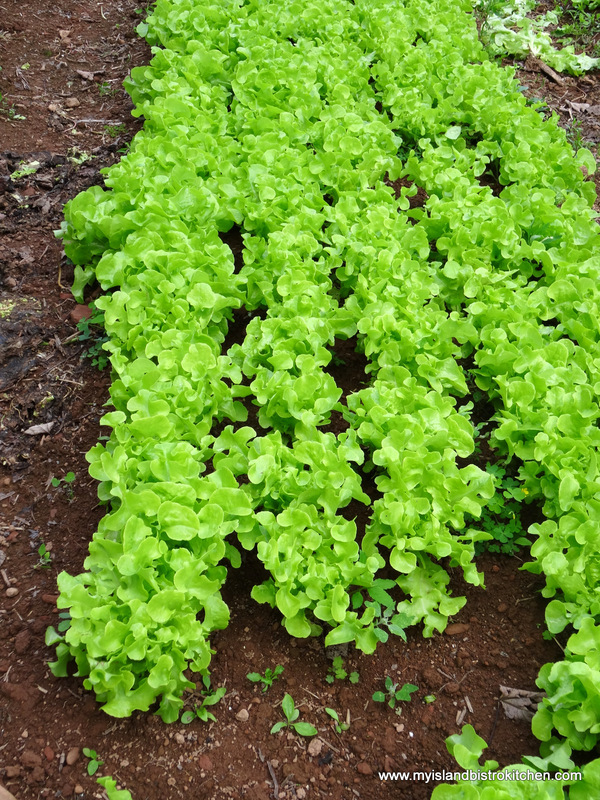 In particular, Jessica grows a lot of lettuce and, by a lot, I mean a small field! 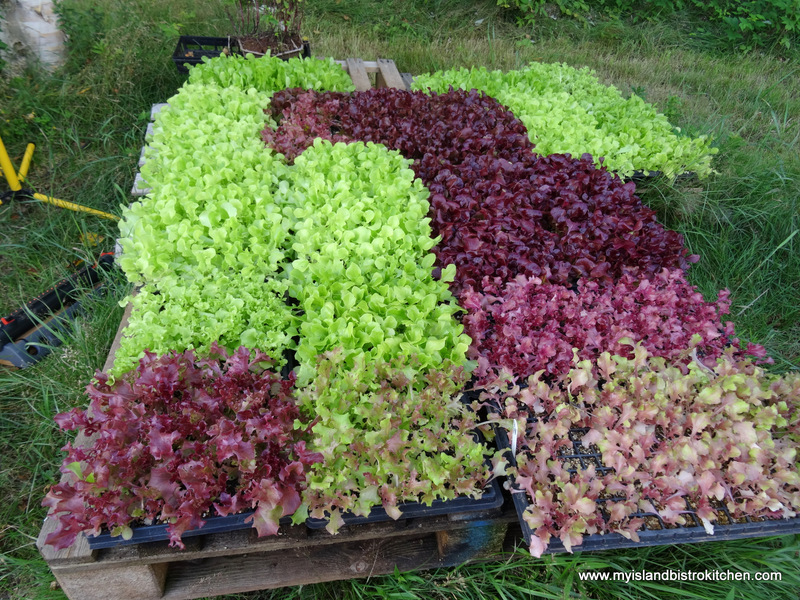 All the lettuce plants are started in Jessica’s small greenhouse and then transplanted. 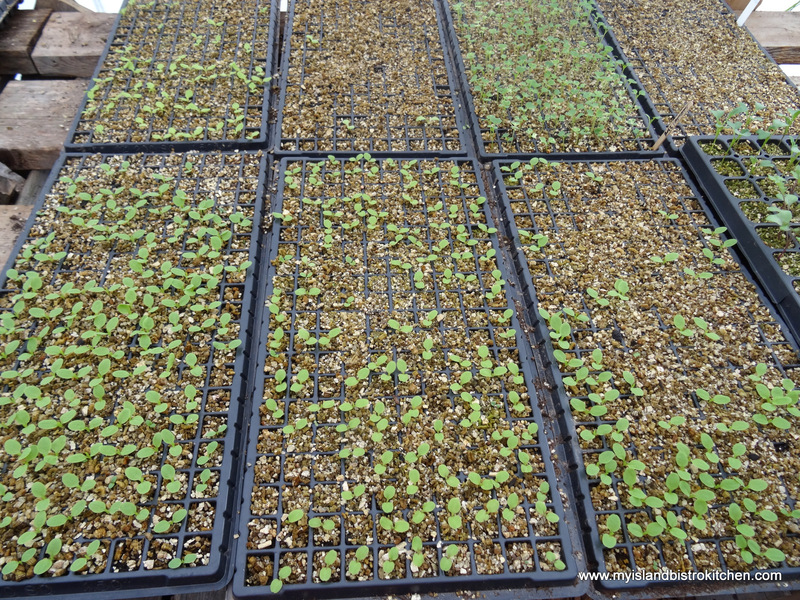 Throughout the growing season, she has an ongoing planting cycle of seedling plants one week and transplanting the next. 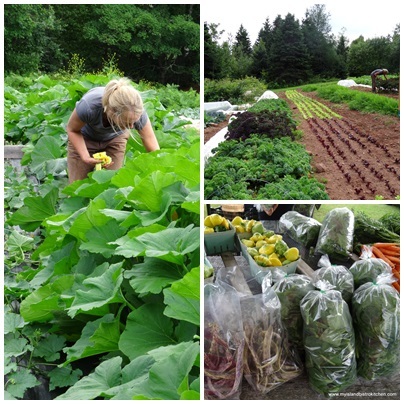 Jessica grows 5-6 varieties that have proven successful in PEI’s climate and she has fresh lettuce available until November. How I wish we had access to this on PEI all winter!!! Because she does not use any chemicals, I asked Jessica how she controls for weeds. She says she uses the old-fashioned method of weeding by hand and hoe. The other method she has found success with is planting the vegetables close to each other to suffocate the weeds. 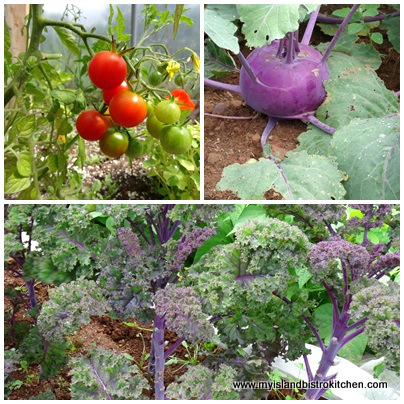 There are challenges to any kind of farming, especially in the control of pests that also find the produce tasty. In particular, the cucumber beetle, cabbage moth, and slugs pose problems. 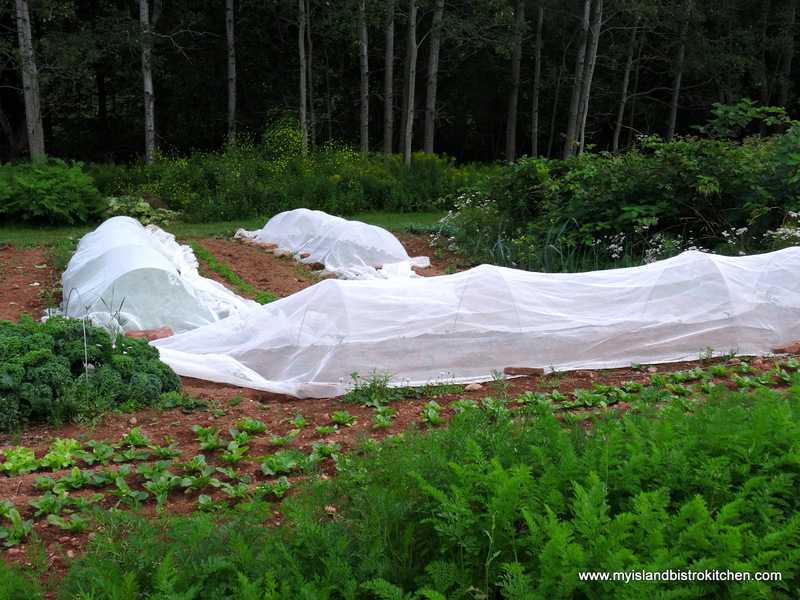 Jessica has had success using netting to cover vegetables most often attacked by the pests. 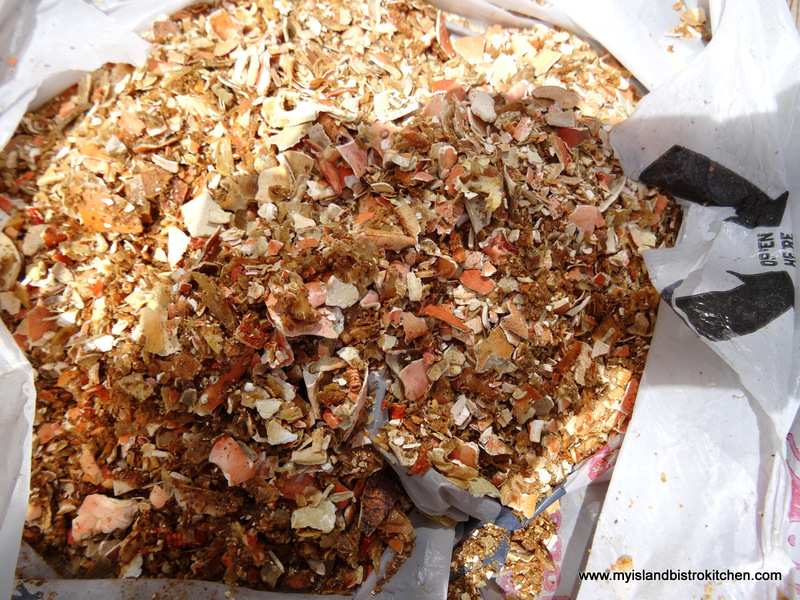 This year, she is also using crushed up crab shell meal as a way to control for slugs. 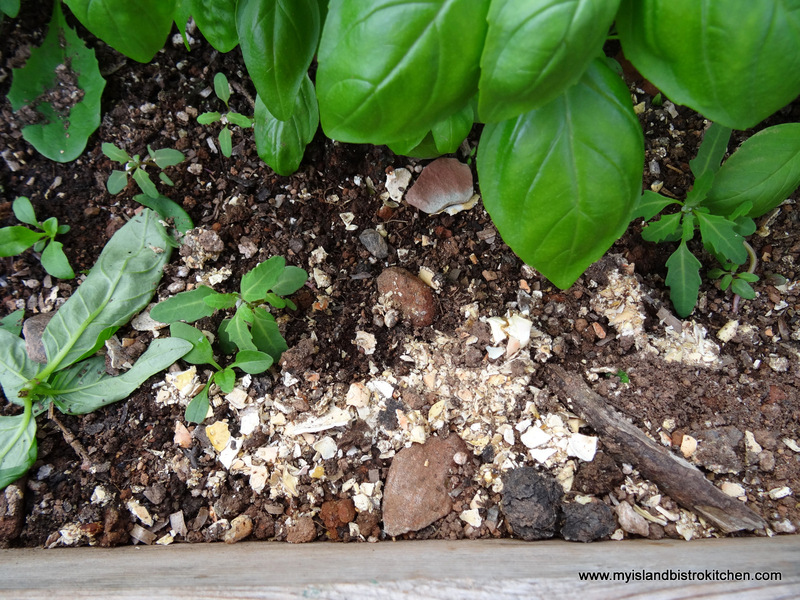 Placed in proximity to the plants slugs like to attack (such as basil, for example), the rough shells are a deterrent for slugs which don’t find them very comfortable to crawl over. Despite the challenges which Jessica jovially refers to as “part of the fun”, there are also sources of satisfaction she finds in her farming. 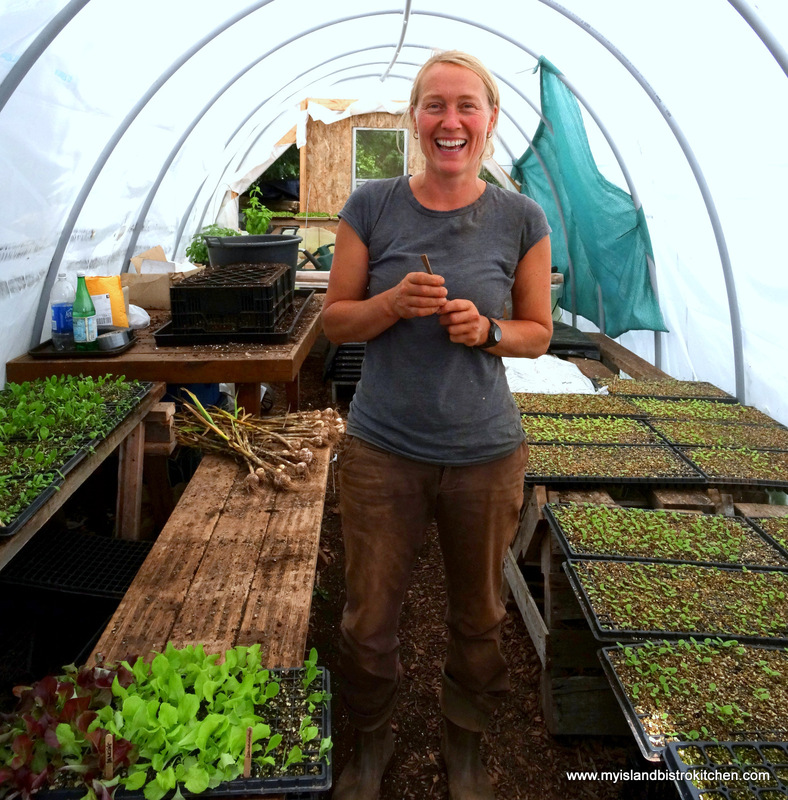 As she says, when her produce grows well and her customers are happy, Jessica is happy knowing she has produced and supplied them with chemical-free, healthy and nutritious produce. Look at these gorgeous, healthy basil plants! I can attest they made some mighty fine basil pesto! Love the dragon tongue beans on the right in the photo below! A dragon tongue bean, anyone? All of Jessica’s produce is hand-washed before leaving the farm. Her new cooler storage unit is to the right in the photo below. 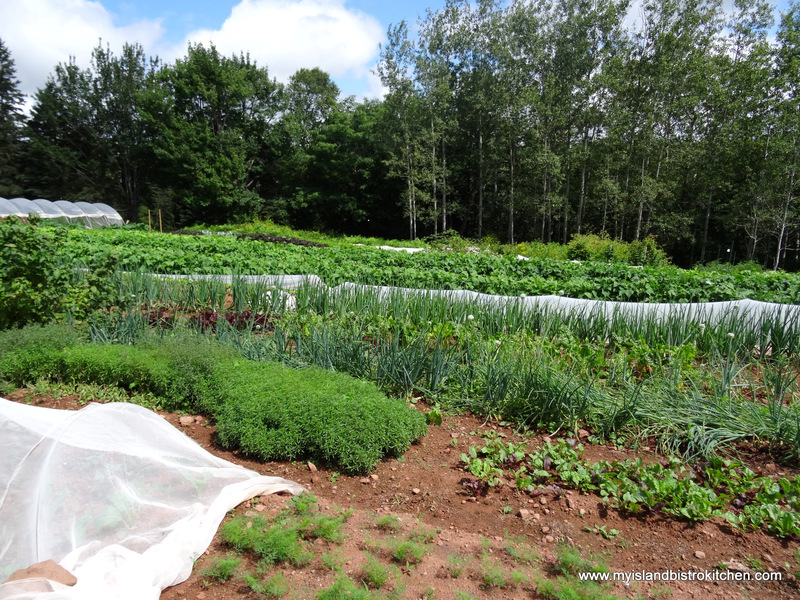 Throughout the growing season, you can find Jessica’s produce in nearby local stores like Gasses General Store in New Haven and Harvey’s in Crapaud. 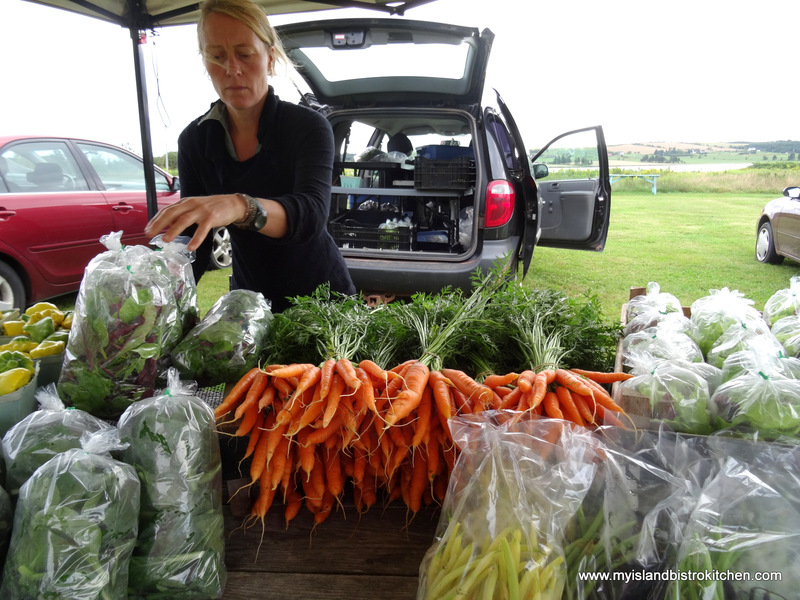 Every Saturday morning in July and August, Jessica can be found direct-marketing her produce at the small farmers’ market in the seaside village of Victoria-by-the-Sea. 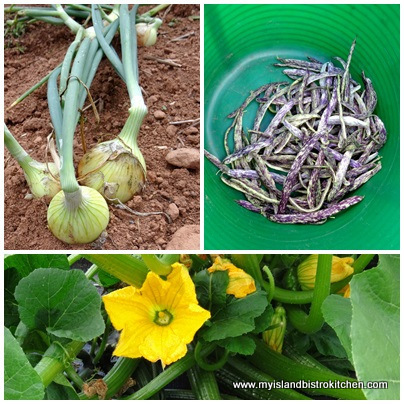 She also supplies several local restaurants with fresh produce as well. 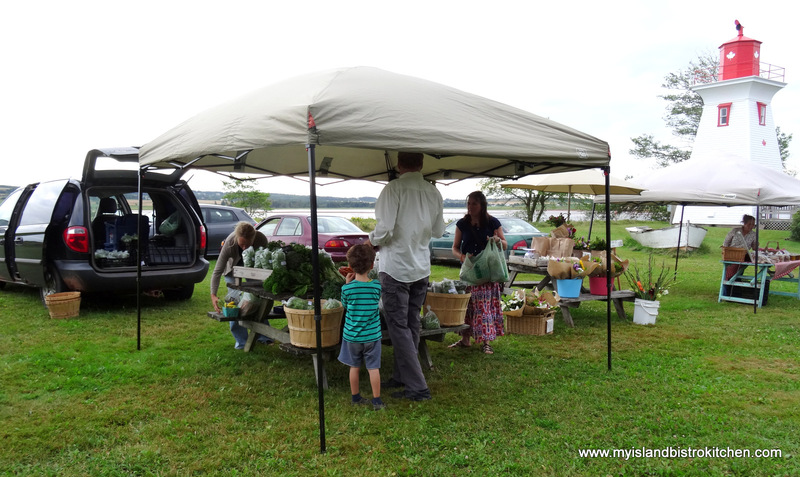 Like many organic farmers, Jessica also sells her produce through Community Shared Agriculture Boxes (CSA Boxes). 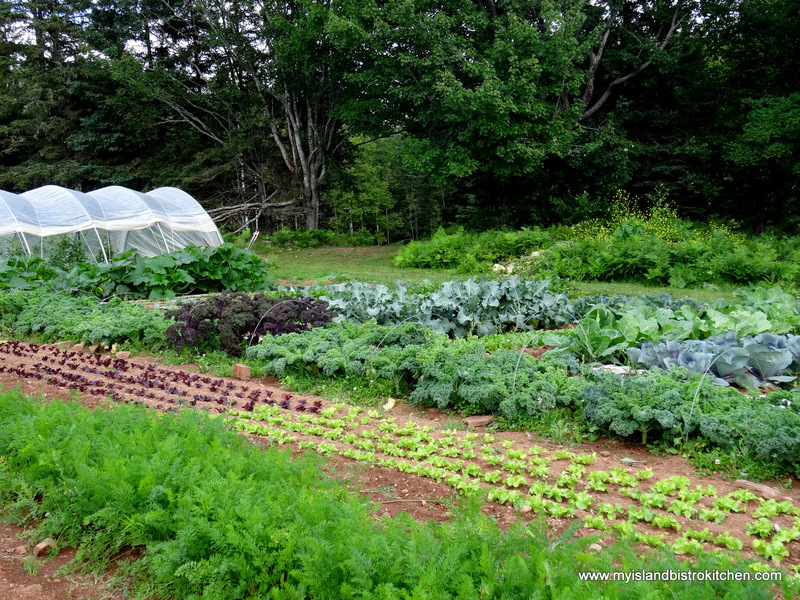 This is where individuals (known as CSA members and sometimes referred to as shareholders) buy shares in her farm – i.e., at the beginning of the season, they sign a contract with Jessica and pay a certain sum of money upfront. In return, Jessica commits to do the best job she can to provide them with high-quality vegetables. 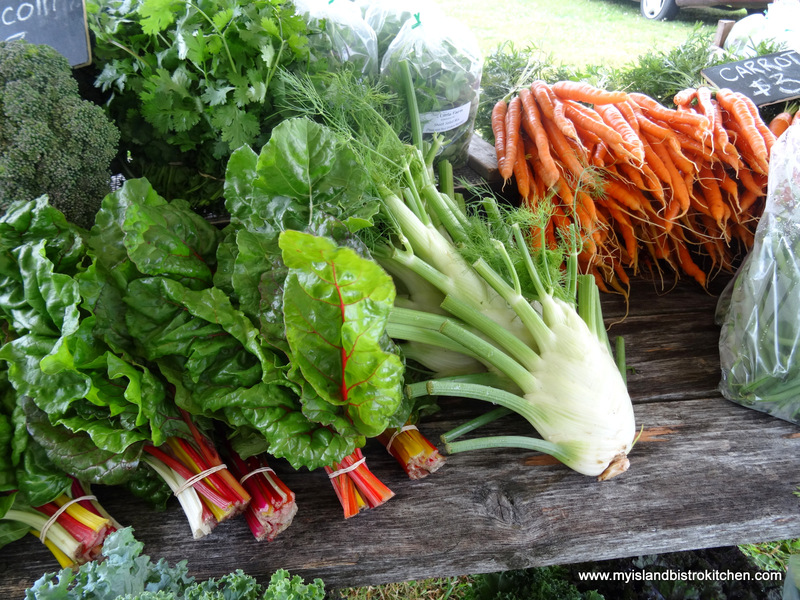 Then, once harvest season begins, CSA members get a regular share of the vegetables from the farm as they are available. 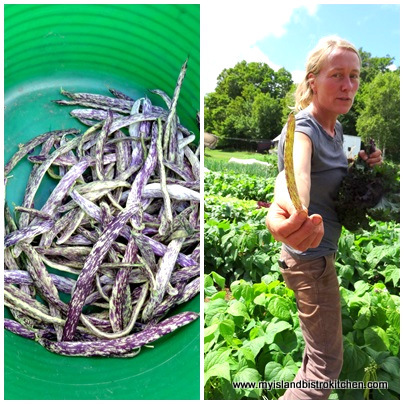 Currently, Jessica has about 15 CSA members who either receive a share of veggies weekly or bi-weekly. Jessica first tested the CSA method in the fall of 2013 and found a demand for it so this year, once a week, she fills her share boxes with whatever produce and herbs are currently available and heads to Victoria-by-the-Sea where her CSA members meet her to pick up their supply of fresh farm produce. Earlier, I shared a recipe for Basil Pesto using fresh basil from Just A Little Farm. 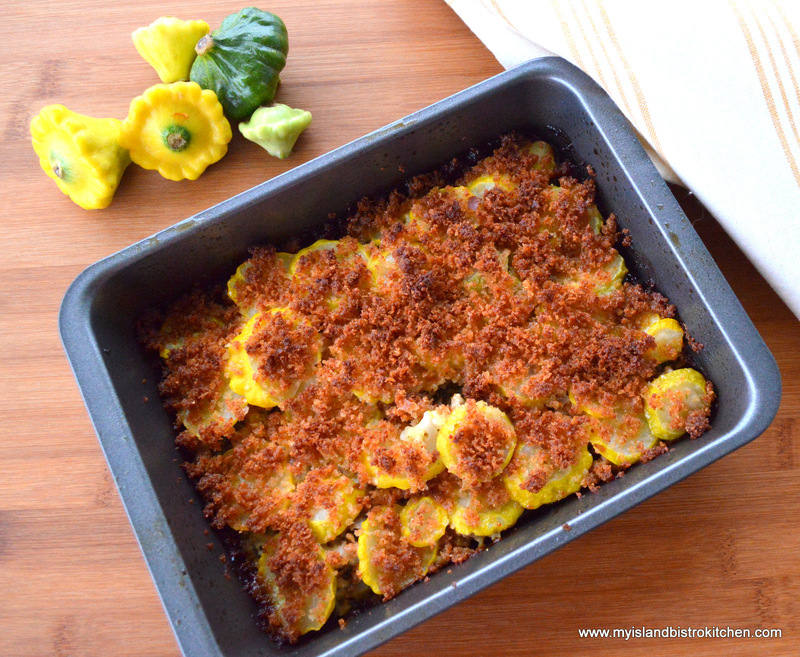 Today, I am featuring my recipe using pattypan squash from Jessica’s farm. 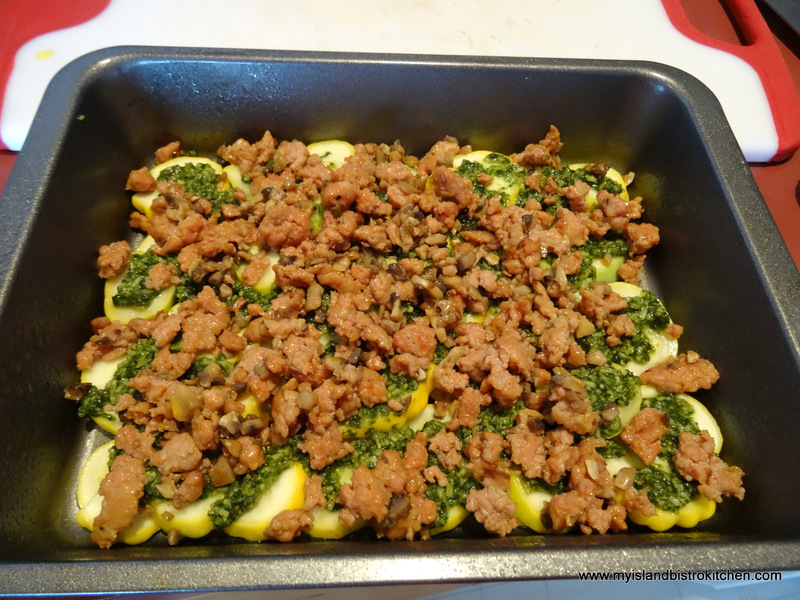 This is a tasty side dish that combines pork sausage, mushrooms, basil pesto, and cheese with the pattypan squash. Heat oil in frying pan. 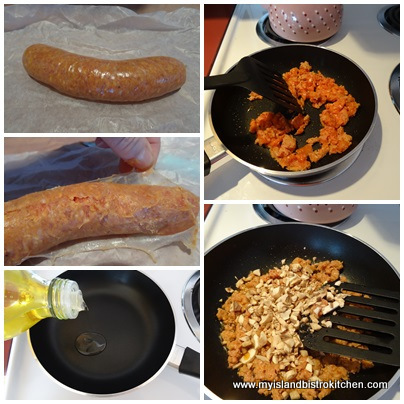 Remove sausage from casing and discard casing. Crumble sausage into frying pan and scramble fry over medium low heat for about 5 minutes. Add chopped mushrooms. Cook for 3-4 minutes. Slice pattypans about ⅛” thick . Toss in a bowl with apx. 2 tsp olive oil. 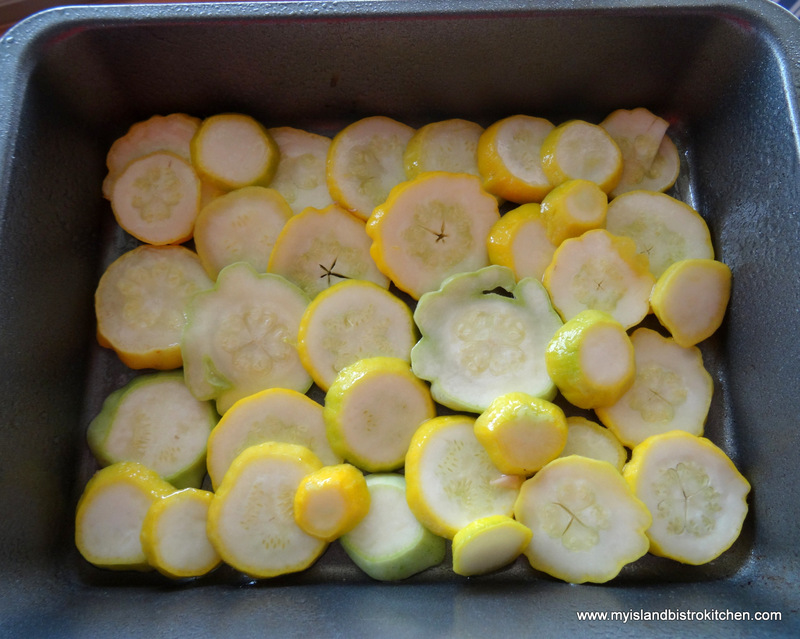 In greased 8½“ x 6½“ pan, lay a layer of pattypan slices, overlapping slightly to cover bottom of pan. 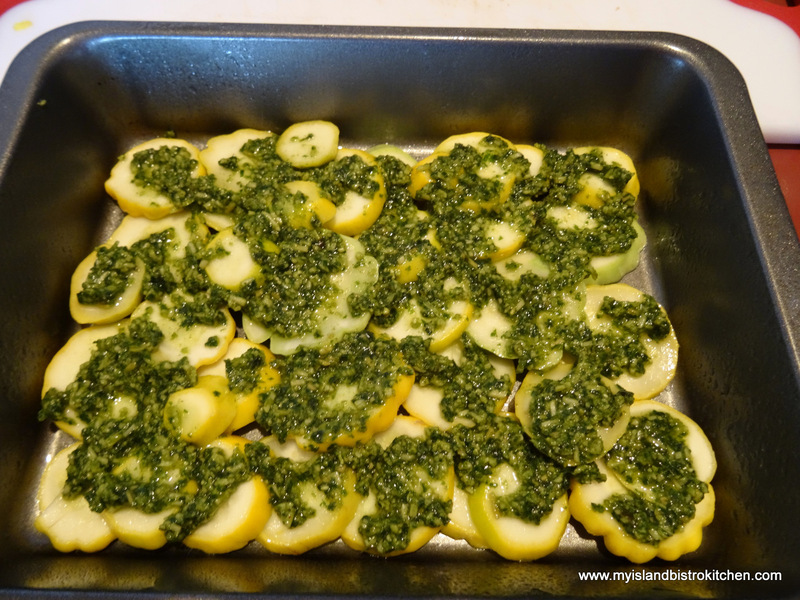 Loosely dob about 2 tbsp basil pesto over the squash. 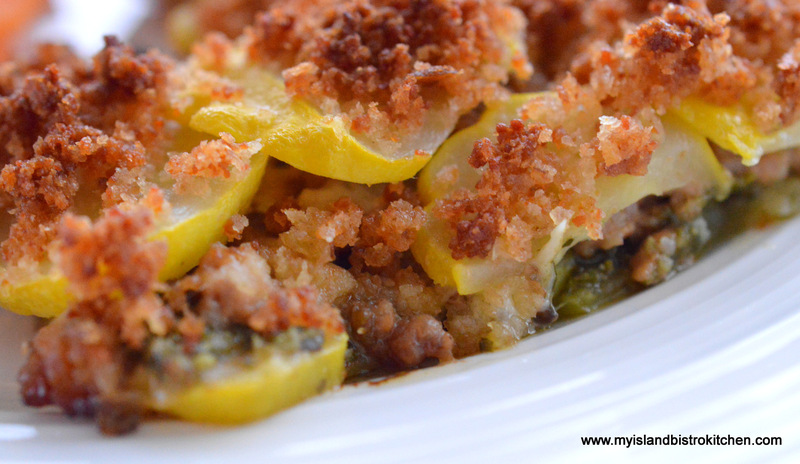 Spread the sausage and mushroom mixture over the squash. Sprinkle with Mozzarella cheese. 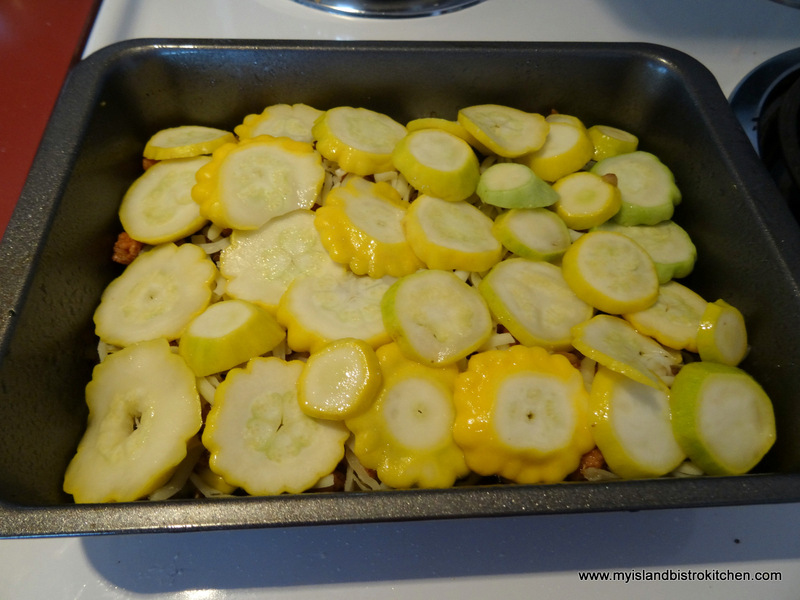 Add another layer of squash, again, overlapping the slices to cover casserole. 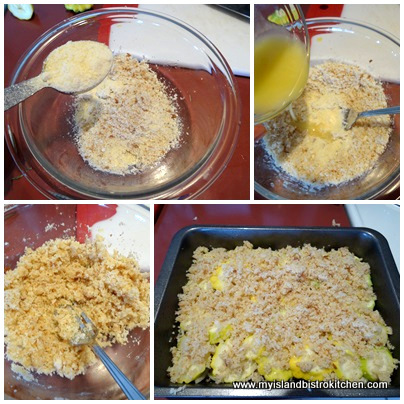 In a small bowl, combine the bread crumbs, Parmesan cheese, and melted butter. Stir with a fork to mix. Sprinkle over squash. 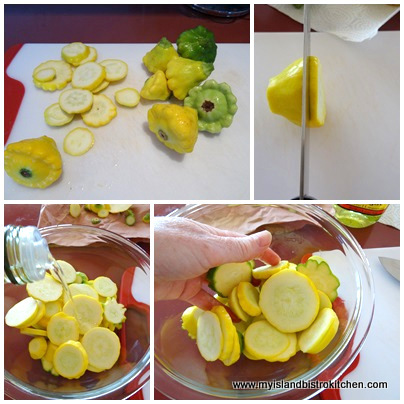 Bake for approximately 35-40 minutes, until squash is fork-tender when tested. 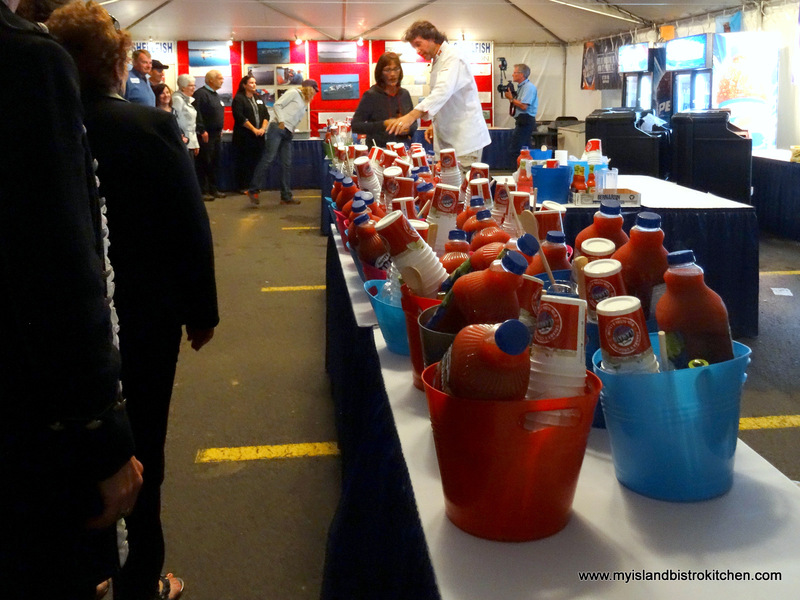 The third weekend in September signals the Prince Edward Island International Shellfish Festival. 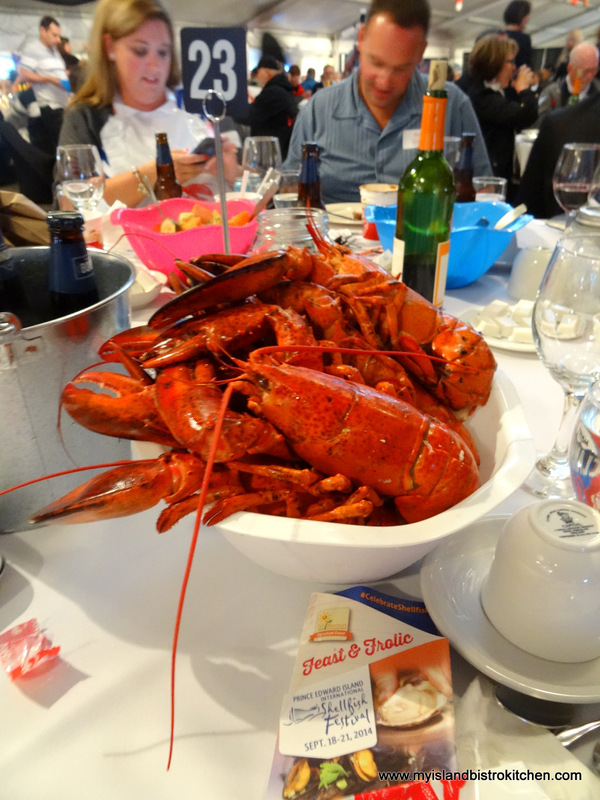 Seafood lovers from all over the world converge on Charlottetown for a weekend full of everything related to seafood, lots of great PEI food and entertainment. Now in its 19th year, this Festival continues to grow in popularity each year. 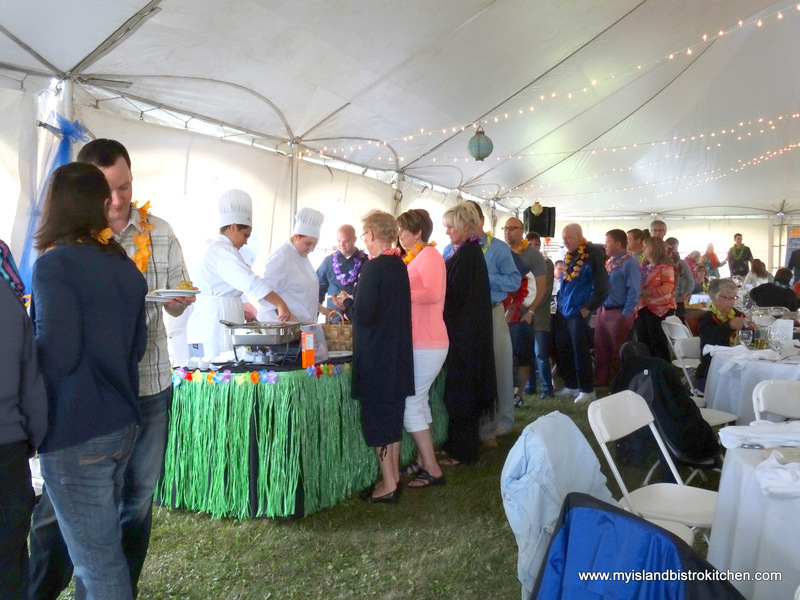 This Festival was the idea of local restaurateur, Liam Dolan, who saw it as a way to extend the PEI tourism season into the late summer. The weekend kicked off on Thursday evening with a grand feast and frolic dinner hosted by celebrity chef, Michael Smith. 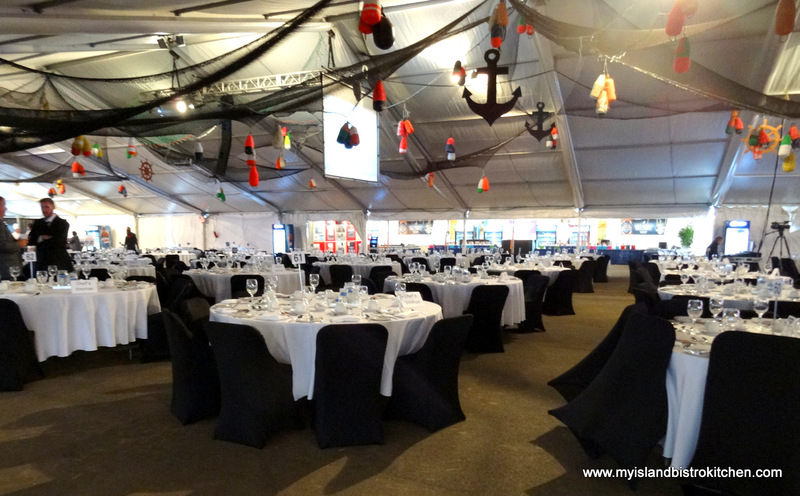 This dinner was held in a gigantic tent on the Charlottetown Event Grounds and this annual event always sells out early. 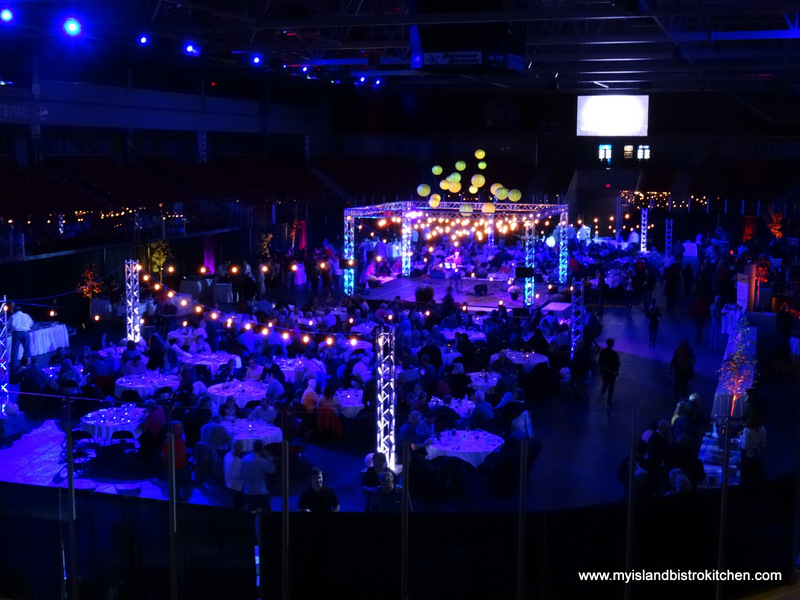 Some 500 people attended this year’s dinner which was beach themed. 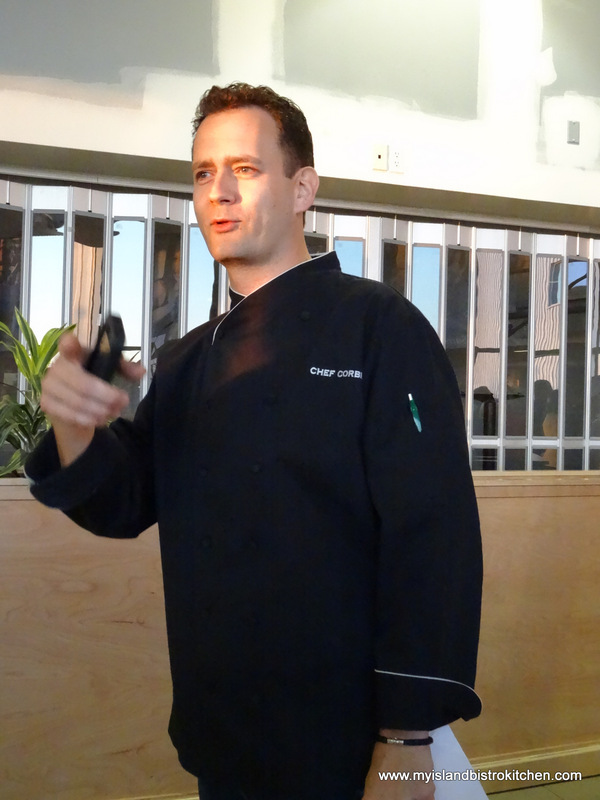 The four-hour evening began with a meet and greet with Chef Smith — lots of autographs and photo opps. 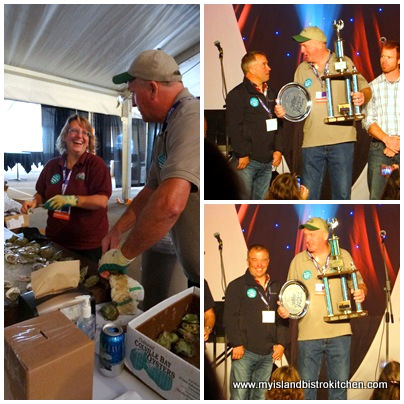 The competition for the best oyster grower on the Island was also underway during the reception hour where there were lots of opportunities to watch oyster shucking and taste all the different PEI oysters. 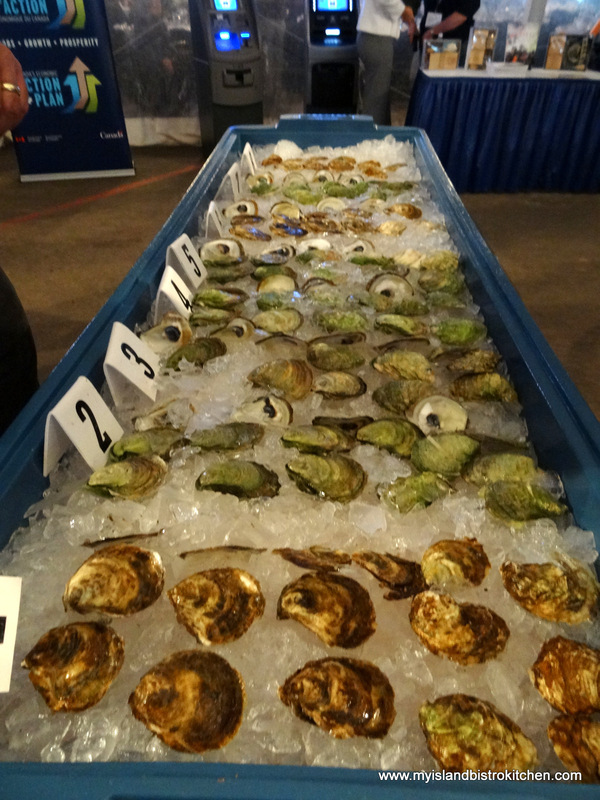 Some of the oyster competitors for the Oyster Grower of the Year Award. 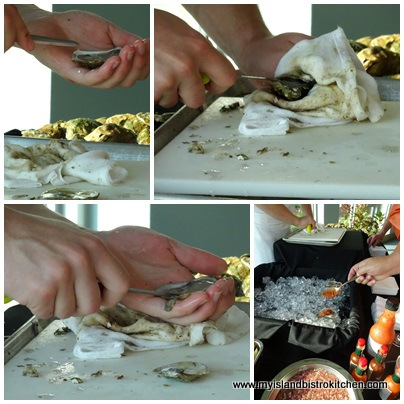 The oysters were formally being judged by a panel but guests also had the opportunity to vote for the peoples’ choice. 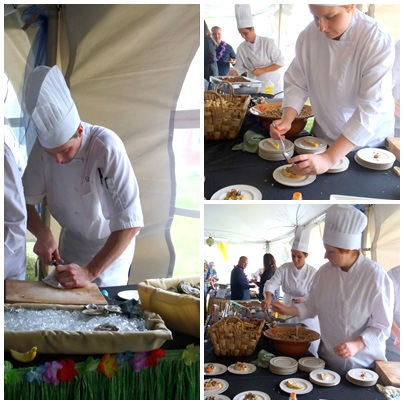 This year, both honours went to Colville Bay Oysters of Souris, PEI. 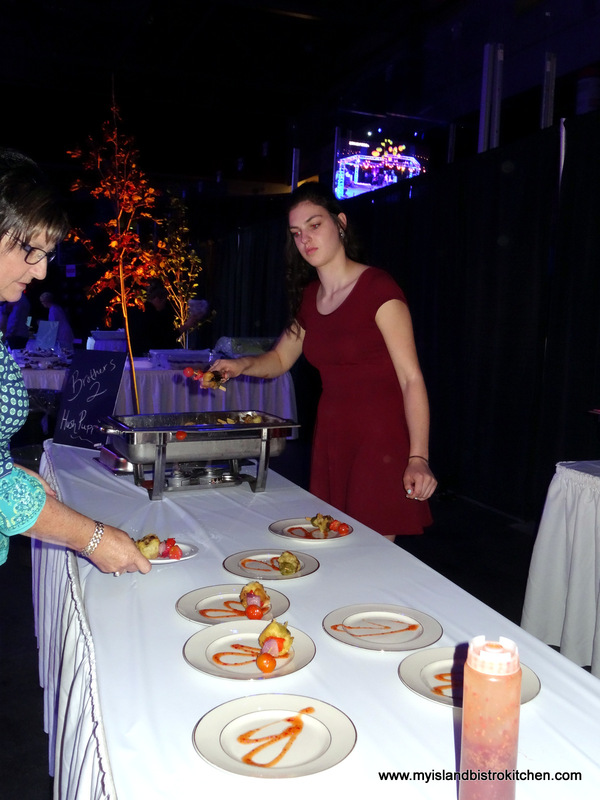 Lots of hors d’oeuvres were served by waiters who continuously circulated amongst the crowd with trays of tasty appetizers. 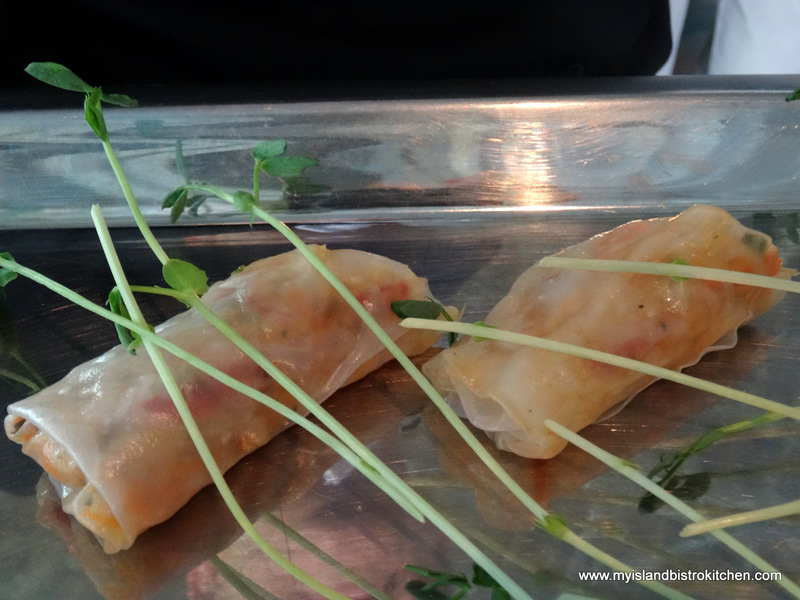 These Island Blue Mussel Spring Rolls were divine! 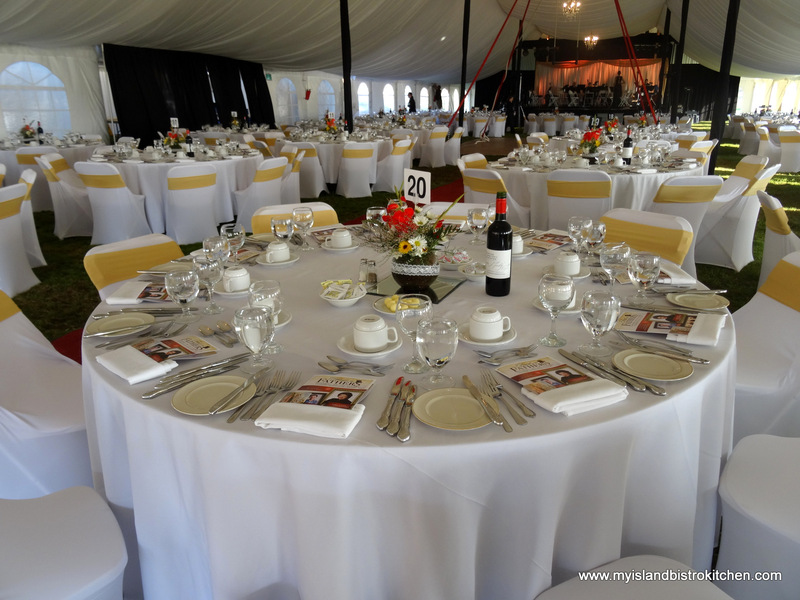 Now, when you walk into a large tent and see beautifully set tables with a black and white theme, you’d probably think you’re going to a formal sit down dinner with a plated meal. 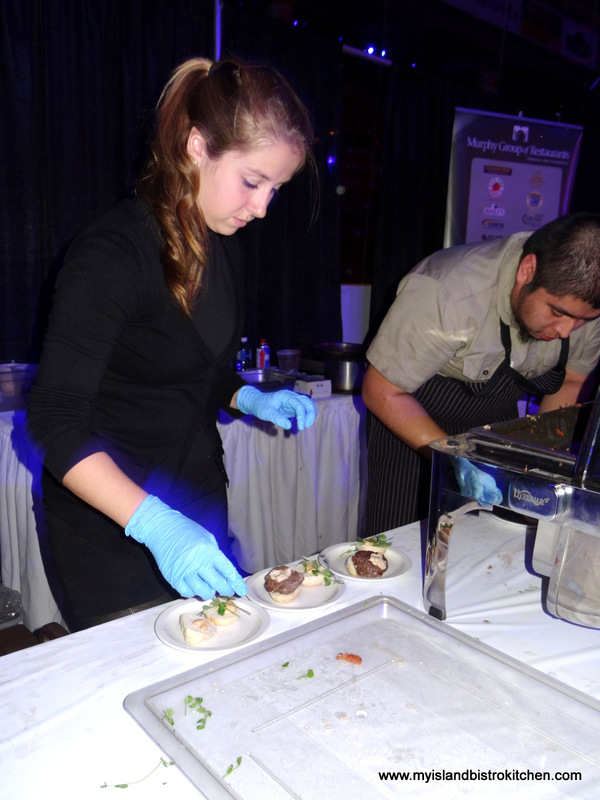 Well you are, well…sort of…..but you may be doing the plating and serving! 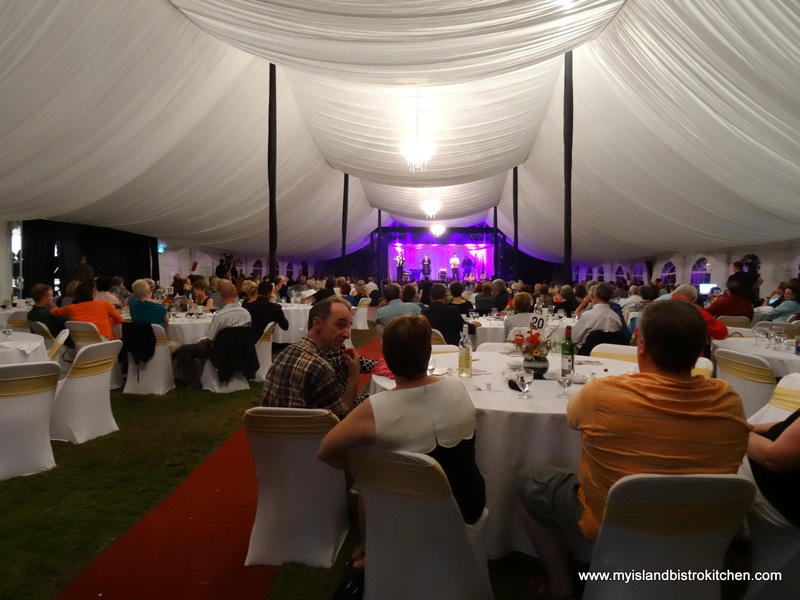 You see, this event is an interactive dinner and every guest participates in some event at some point during the evening. A Maitre’D was selected from each table and was presented with a package of information, including roles to be assigned to table guests. 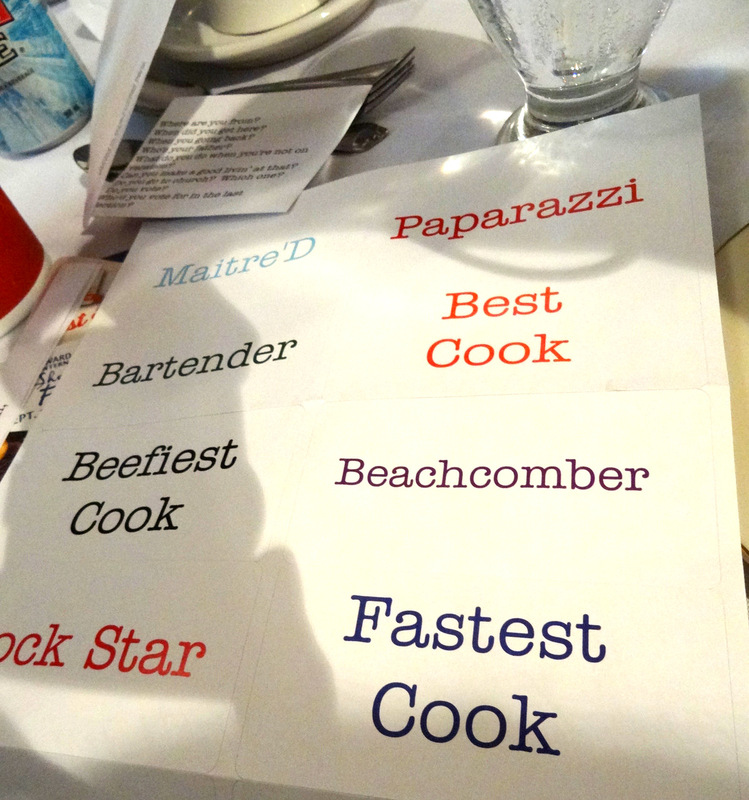 Yes, each table had a bartender, a member of the paparazzi, beefiest cook, best cook, fastest cook, a beachcomber, and a rock star. Guests really embraced the concept and soon every one was fully engaged in the fun. 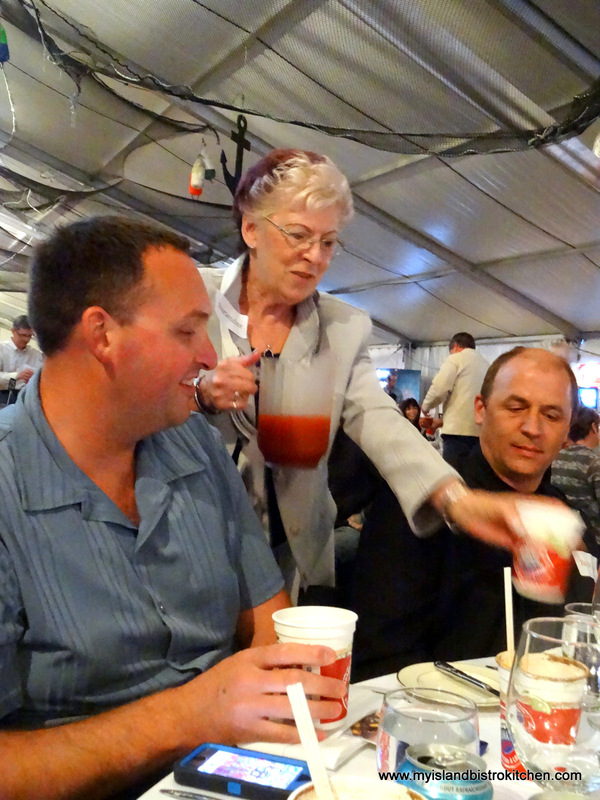 First, Chef Michael took the bartenders from each table aside to explain how to make Caesars. 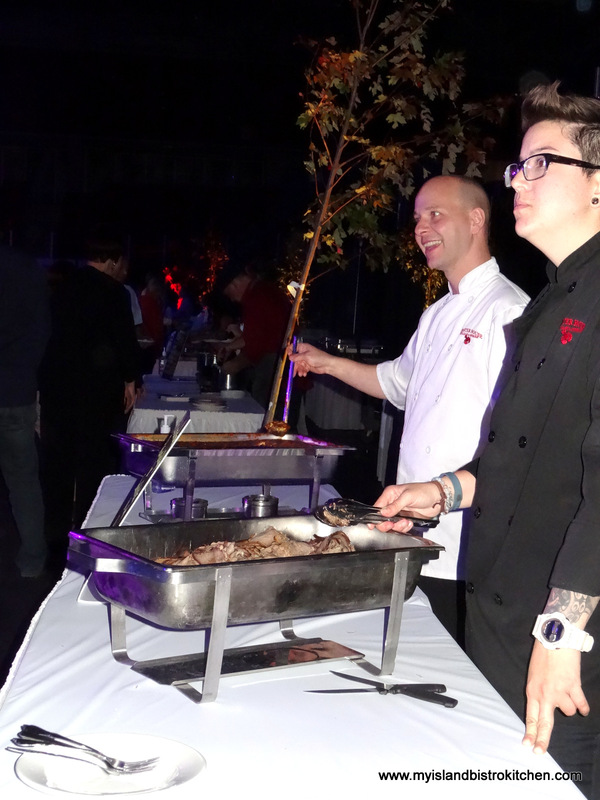 Each bartender collected a kit of supplies and returned to their tables to make the Caesars tableside and then serve them to their tablemates. Biscuits were on the table to accompany the chowder course but….no butter! That’s because, the fastest cook at each table had to actually make the butter. Lots and lots of shaking of a Mason jar full of milk and, voilà, freshly-made butter for the biscuits! 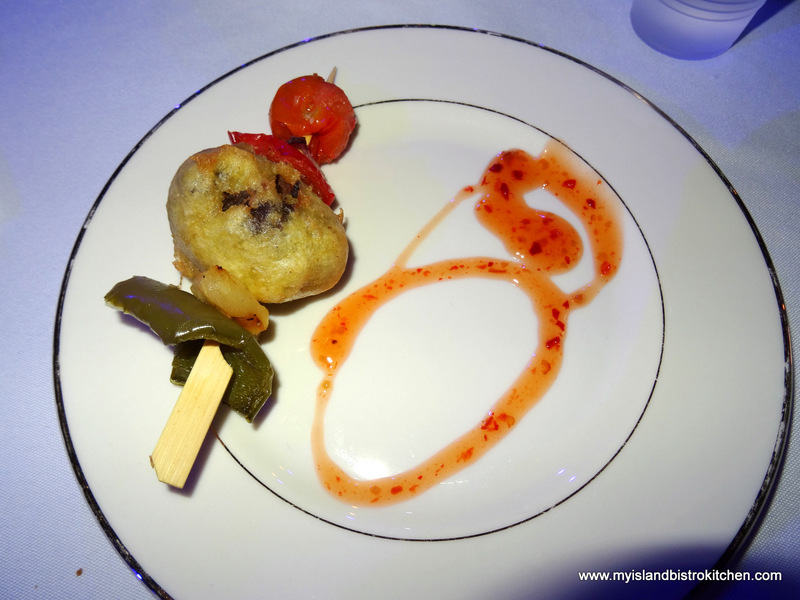 Yup, you really did need to work for your dinner at this event! 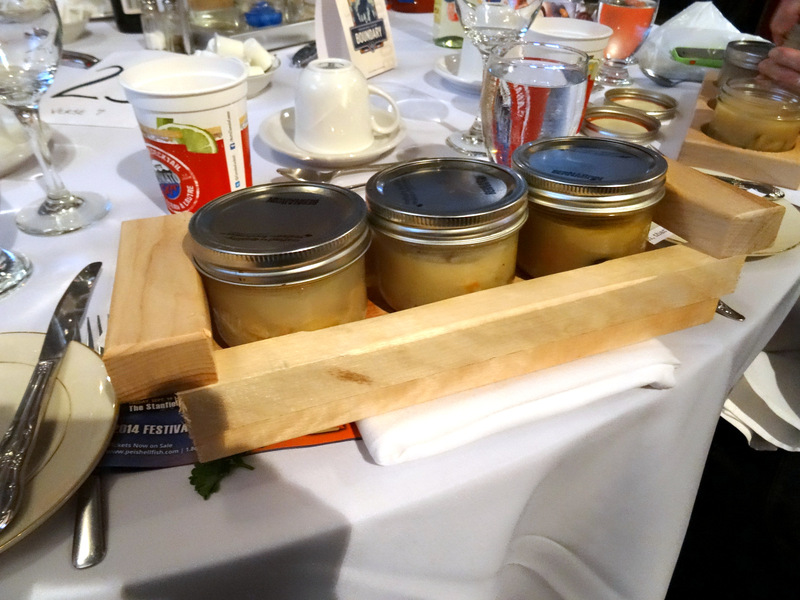 Next came three versions of chowder – one cold and two hot, served in glass jars and presented in these cool wooden trays. Chef Michael then took all the “beachcombers” off to an onsite man-made beach to go combing for hidden beer caps. Once they found beer caps, they were each presented with a bucket of beer to bring back to their tables. Then, we sent our table’s “Beefiest Cook” off with Chef Michael and back our cook came with a tray of slow roast striploin which he carved tableside and served to each guest at the table. 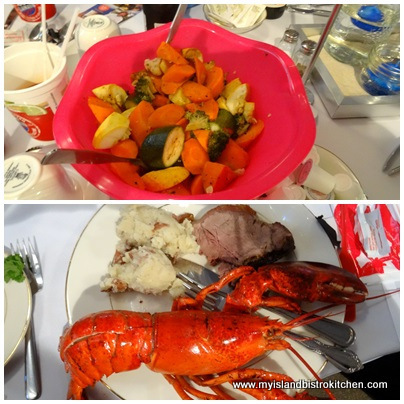 Wait staff delivered large bowls of PEI lobster to each table along with bowls of garden-fresh vegetables and brown butter mashed PEI potatoes. 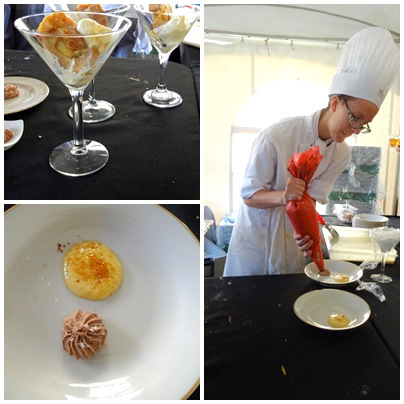 Our “Best Cook” assignee joined Chef Michael at the back of the tent to learn how to plate food. 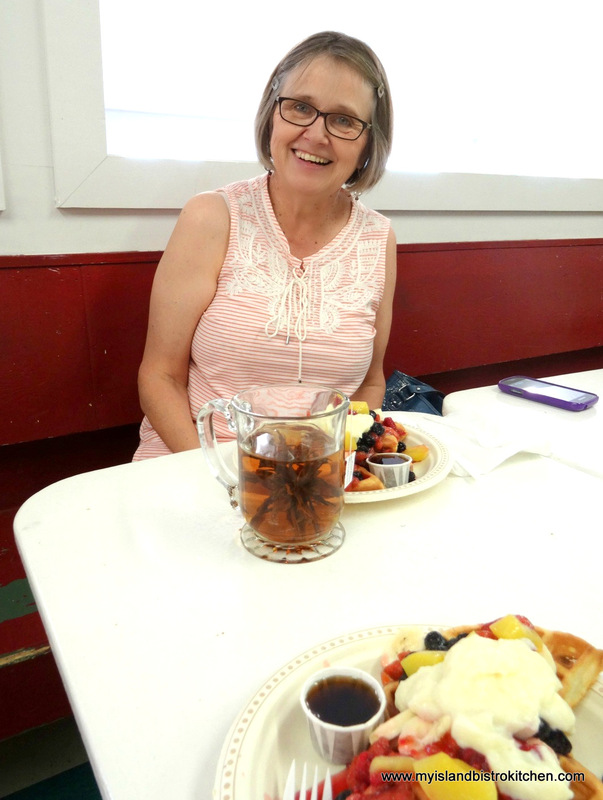 He returned to the table with the makings for a summer berry shortcake – cowberry ice cream, fruit compotes, and biscuits. Then our “Best Cook” wowed us with his plating skills! 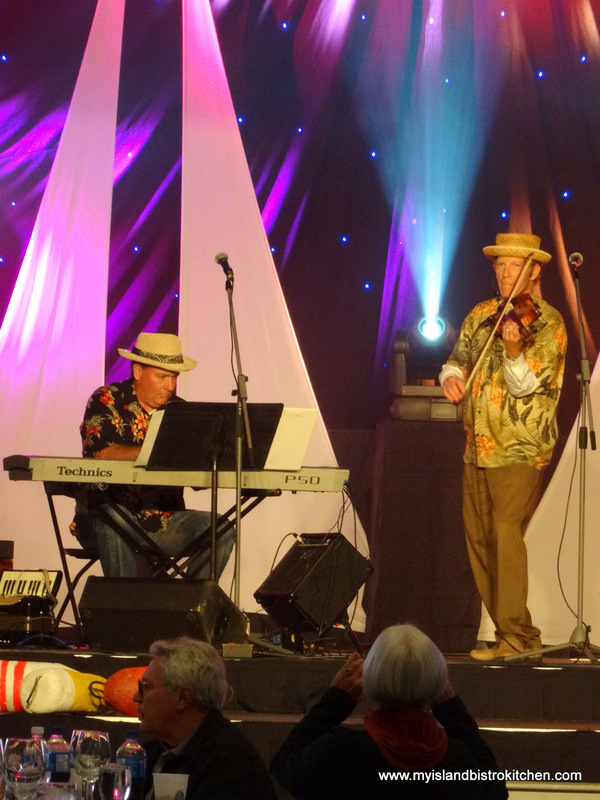 Meanwhile, our “Rock Star” assignee was responsible for coaching us on our singing skills so we could sing the theme song, “A Day on a PEI Beach” at the end of the evening. 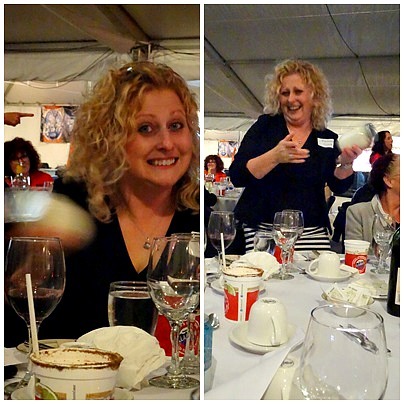 Yours truly was the “Paparazzi” for our table. 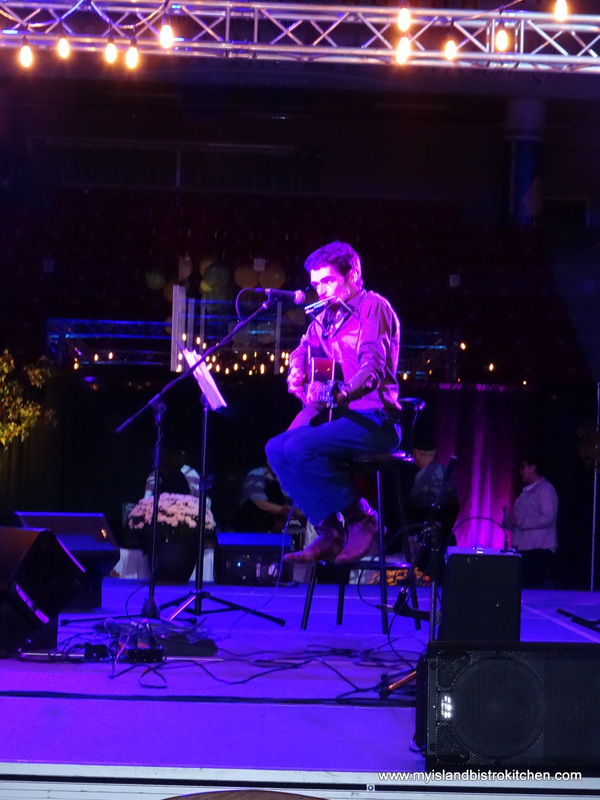 While each table actually provided their own entertainment with all their assigned tasks, lively musical entertainment throughout the evening was provided by Mark Haines and Brad Fremlin. 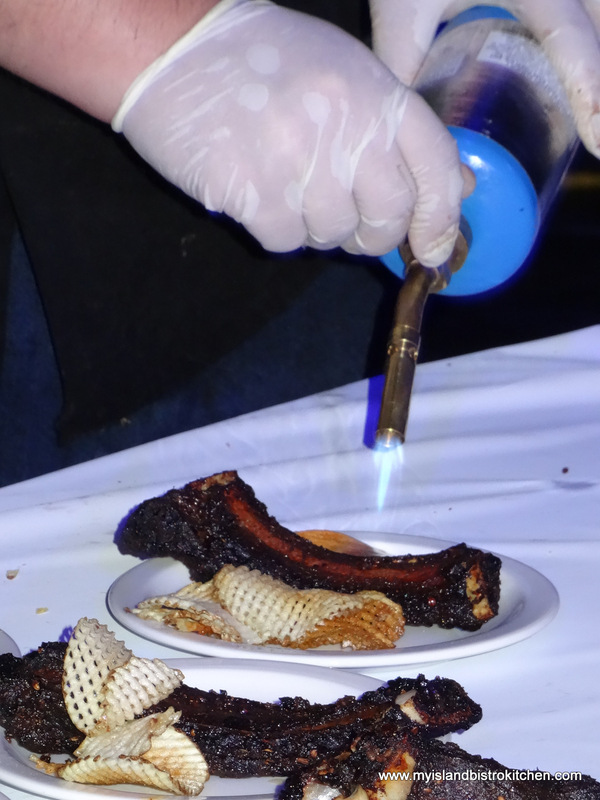 This was a very unique way to serve dinner and it sure got people involved and interacting with others at their table. It kept the evening lively and moving along. Executing this kind of adventure for some 500 guests at a location where the only kitchen is a mobile one and where literally everything had to be brought in — food, equipment, tables, chairs, linens, dishes, etc. — is no small task. The sheer planning for this event would have been a monumental undertaking. 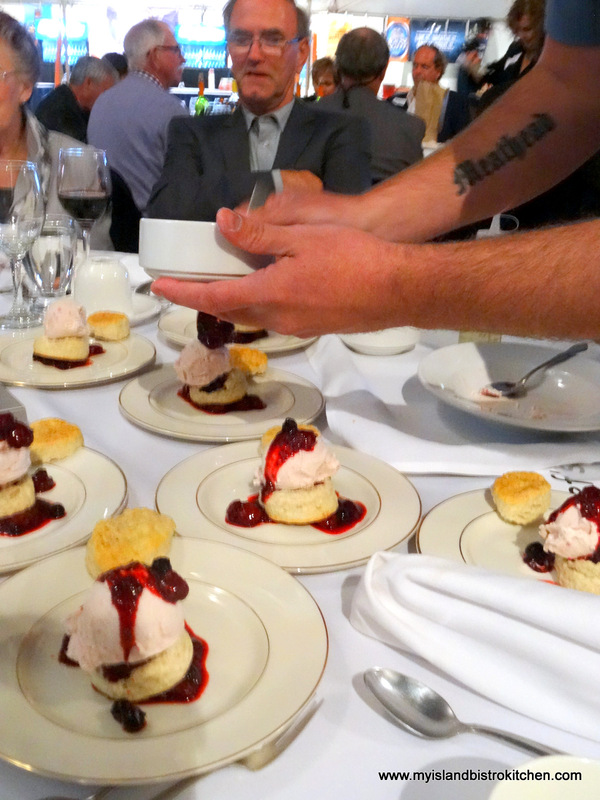 Kudos go to Chef Michael Smith and the large team of chefs, waiters, hospitality and support staff from the Culinary Institute of Canada, and others for a phenomenal event. If you ever have the opportunity to go to this annual dinner, I highly recommend it — but, fair warning, it will be full of hijinks and hilarity and come prepared to be an active participant, not just a spectator! 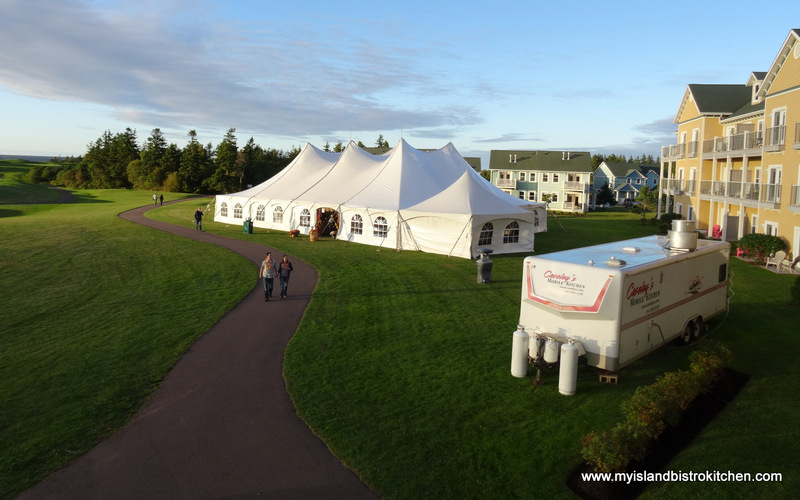 If you’re in PEI in the month of September and see huge white tents with mobile kitchens nearby along with chefs bustling about, chances are there’s a Fall Flavours Festival event happening. 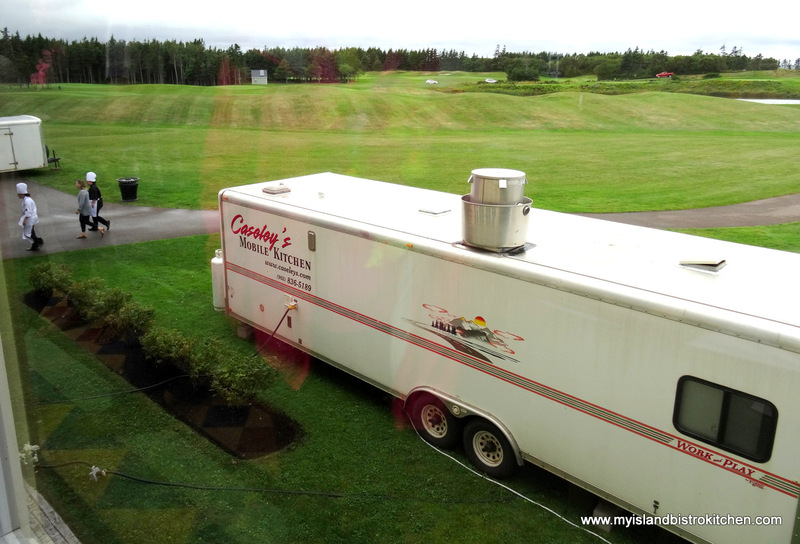 On Sunday, September 14, 2014, I traveled to the Rodd Crowbush Golf and Beach Resort in Morell, PEI. That’s where the sold-out Fall Flavors signature event, “Lamb Luau” hosted by celebrity chef, Chuck Hughes, was being held. 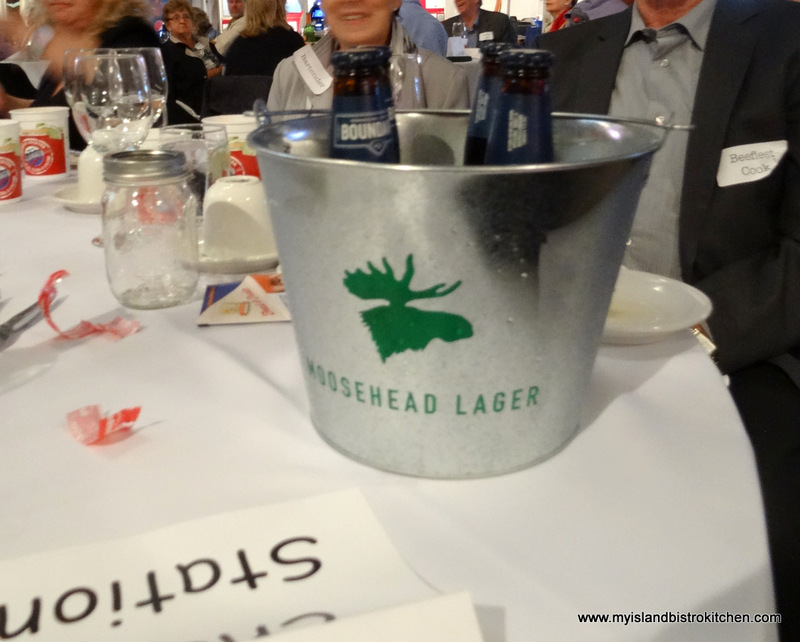 This event was a partnership of Island East Tourism Group and the Rodd Crowbush Resort. 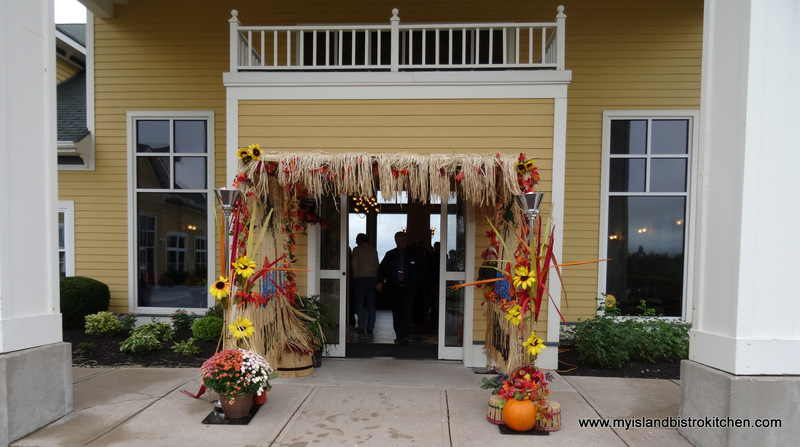 The main entrance to the hotel was decorated for fall. 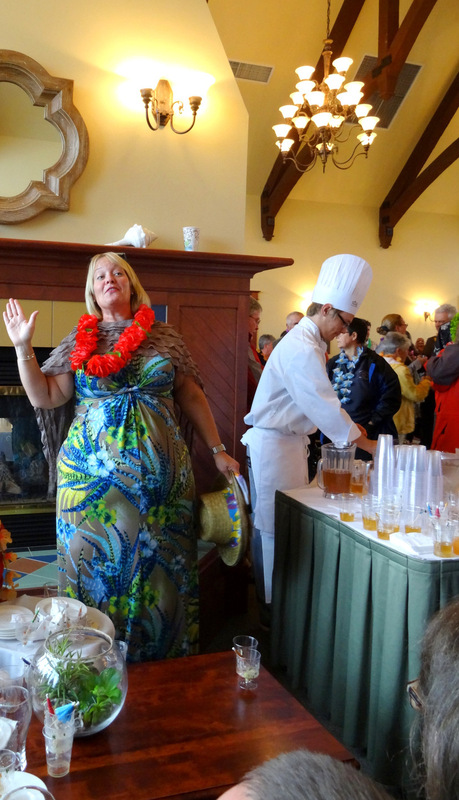 Guests were greeted inside the hotel’s reception area and each presented with a lei and a Strait Shine® signature drink. Rum Mai Tai Punch with Myriad View Shine, anyone? (yes, the legal kind!). 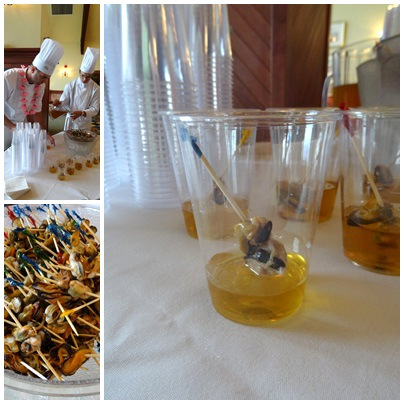 Guests then circulated throughout the Resort’s lobby, visiting four canape stations. Ever tried a pickled mussel? 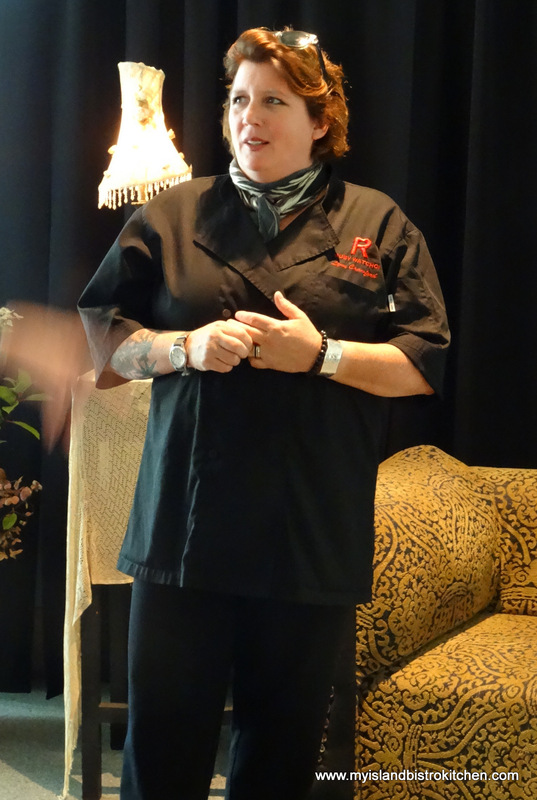 Kerri Wynne MacLeod (pictured below), who co-hosted the event along with Patrick Ledwell, signalled when it was time for guests to make their way to the large tent on the Resort’s grounds where the main event was taking place. 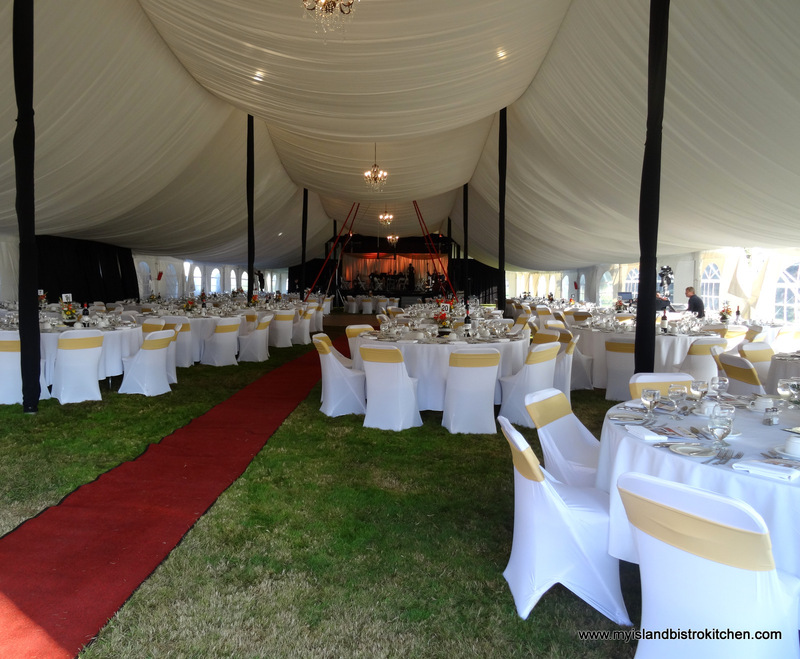 Guests were seated at round tables in the centre of the tent with food stations set up around the outside edges of the tent. 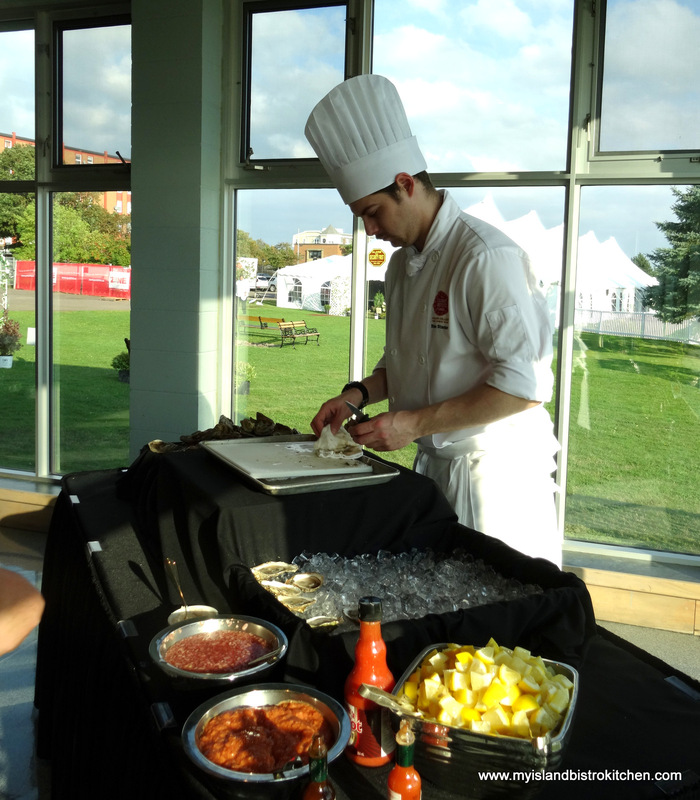 Food stations were themed. 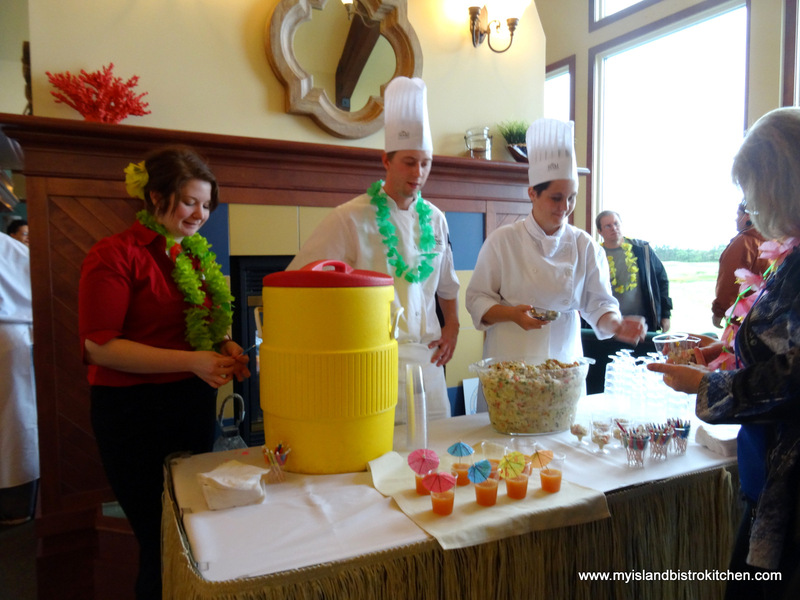 There was a seafood station, carving station, hot station, salad and vegetable station, potato station, and dessert station and each station was color-coded (yes, the colors of leis that guests selected mattered!). For the first “go” at the buffet, guests were directed to go to the station that had a colored ribbon that matched the color of their lei so that not everyone converged on the same station at the same time and so that everyone could quickly be served food without long delay of waiting as tables were individually called to start. 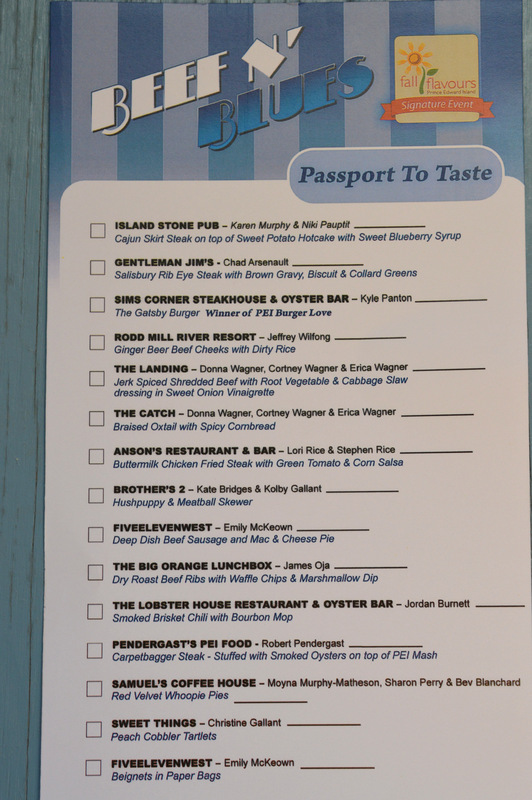 After the first “go-round”, guests were free to choose the food stations at their leisure in any order they so chose. 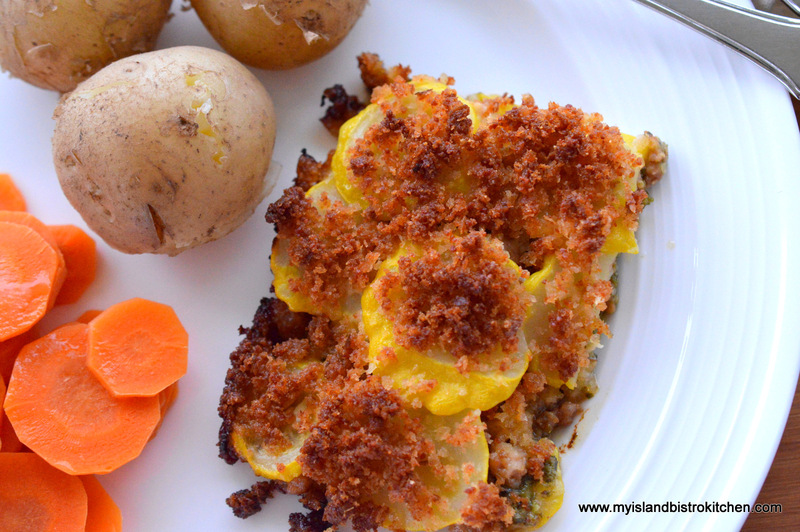 A good PEI food event will feature Island spuds, of course! 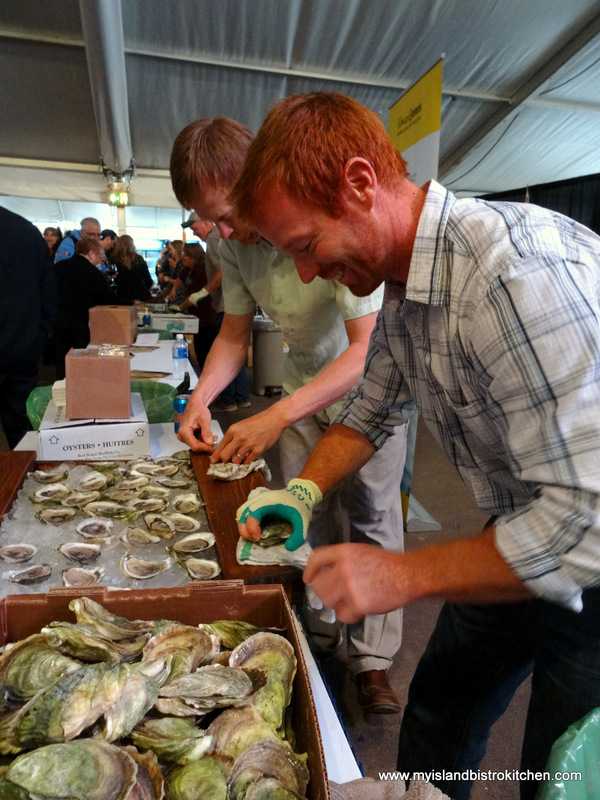 What would a PEI food event be without some oyster shucking! 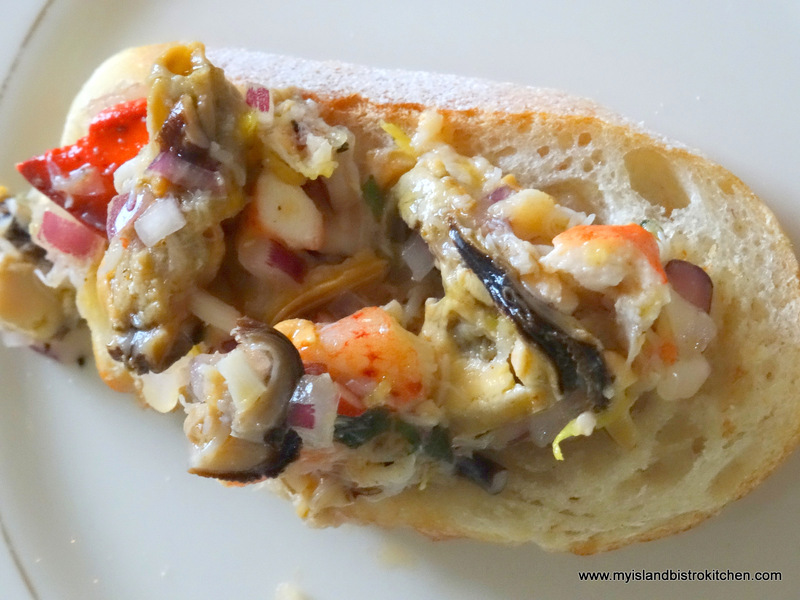 Take a look at this yummy lobster and mussel bruschetta. 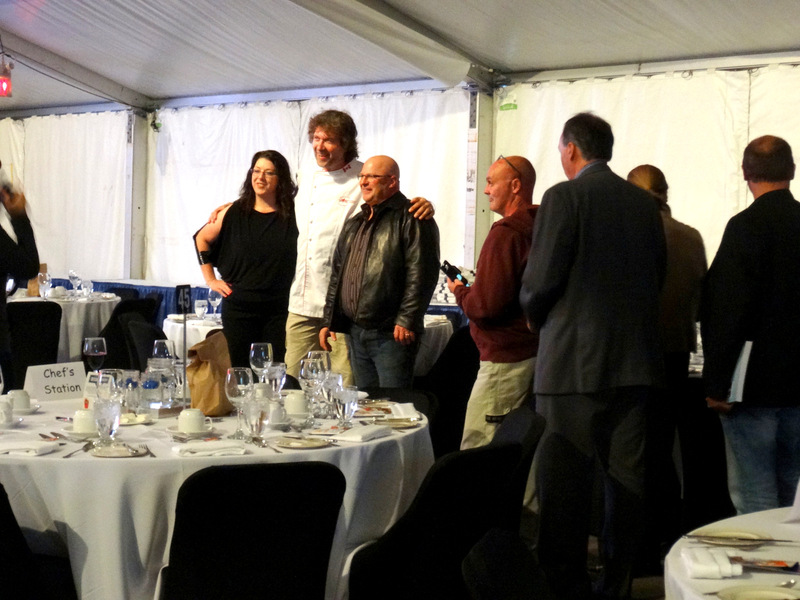 This being a signature event of the PEI Fall Flavours Festival, a Food Network celebrity chef was in attendance. 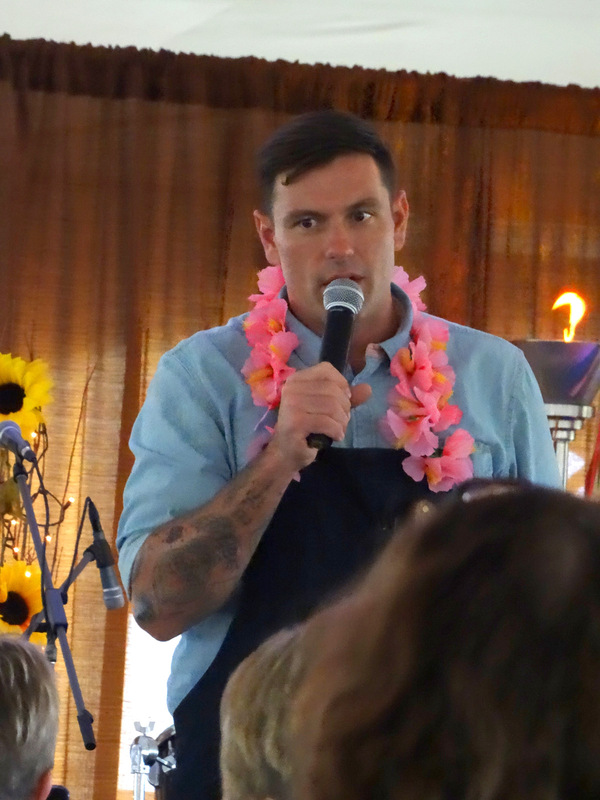 Chef Chuck Hughes circulated throughout the evening, posing for photographs and signing copies of his cookbooks which were also on sale during the event. Musical entertainment was provided by Dylan Menzie and Band followed by a presentation of the Down East Dancers and a limbo demonstration. Some desserts to finish off the evening — Whiskey ice cream proved popular as did the chocolate mousse and pumpkin crème brulée. Fall Flavours events, such as this one, are a great way to become acquainted with the many fine foods grown or produced on PEI. It’s also a chance to try foods you may not have tried before or maybe some familiar foods but prepared in a new or different way. 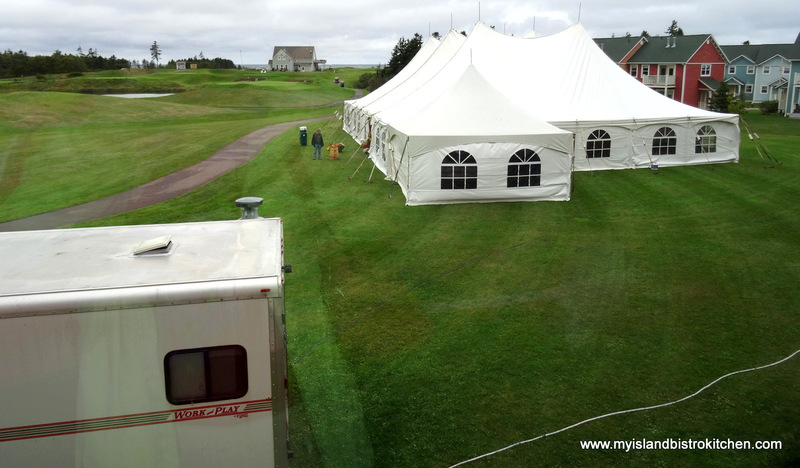 Rodd Crowbush Resort provided a stunning location for this event overlooking the famous Links at Crowbush Cove. 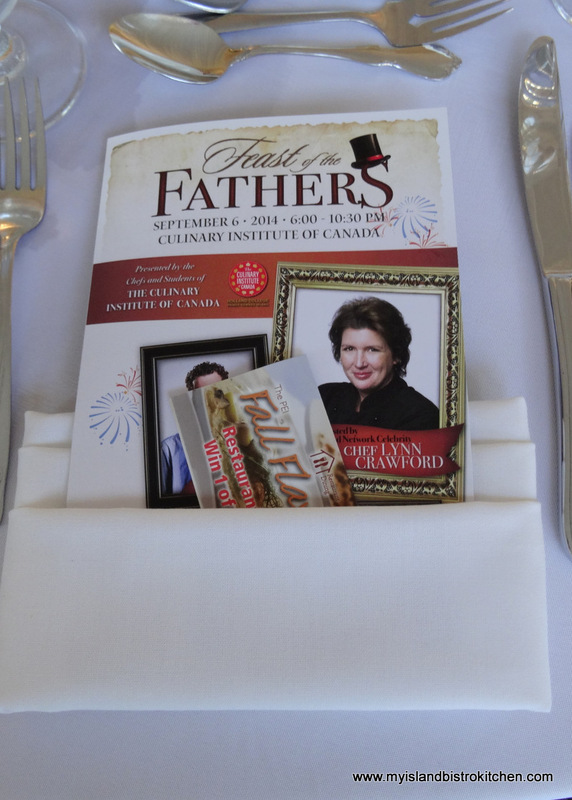 Penguin Canada has offered me the opportunity to conduct a review of Chef Michael Smith’s latest cookbook, Family Meals. 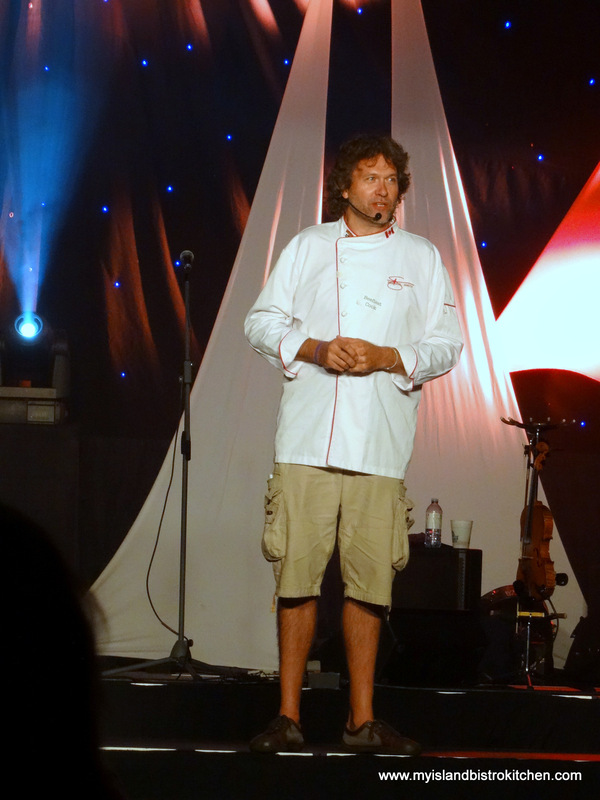 Michael Smith is a celebrity chef and Food Network Canada star who makes his home in Prince Edward Island on Canada’s East Coast. Known for his love and promotion of fresh, local ingredients, this is Smith’s 7th published cookbook. The book is clearly influenced by Smith’s cooking for his own family in his home kitchen as the book contains many photos of his family in the kitchen and around the dining table. 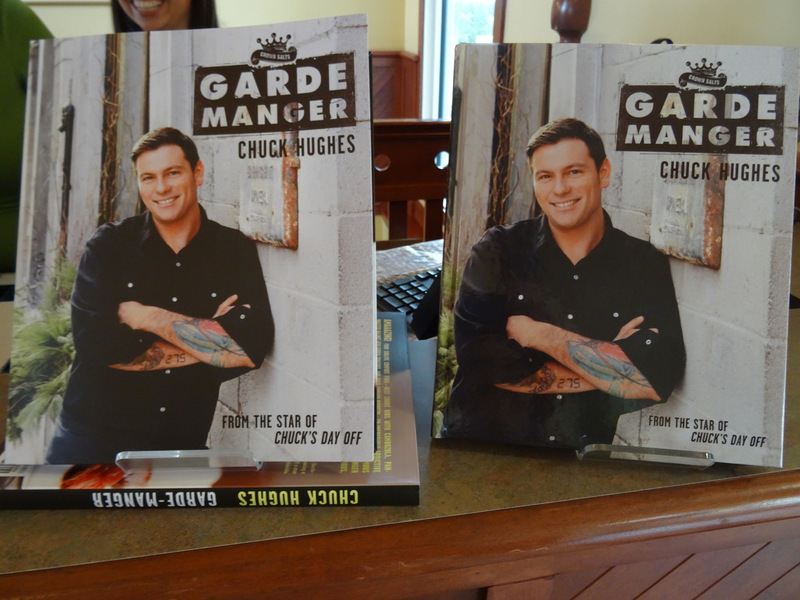 The focus of his book is to get the entire family cooking and eating together. The book features 100 recipes that range from smoothies to sandwiches, snacks like kale chips, salads, soups, side dishes, and maritime mussel chowder, to old world chicken cacciatore and flaming banana splits. The book is well organized and categorized with chapters on breakfast and brunch; lunchbox and snacks; simple salads; soups, stews & casseroles; slow cookers & pressure cookers; family meals in minutes; meatless Mondays; vegetables & whole grains, and sweets and treats. One chapter is dedicated to slow cooker meals to encourage families to plan ahead and prepare meals in advance of arriving home hungry at mealtime with no idea what to put on the table quickly. And, yes, you’ll even find some lentil recipes, too, from the lentil hunter. Smith has also included tips in the book on, for example, ways for families to cook together, plan meals, organize the kitchen, and prepare lunchbox contents. While the book has a broad range of recipes, some do call for ingredients that may be less familiar or accessible for some – e.g., wasabi peas, edamame, nori seaweed, miso paste. Several of Smith’s recipes veer toward the spicy category as he makes liberal use of lots of spices and garlic for flavouring many dishes. There are several innovative recipes in the book to encourage families to try new foods, or familiar foods in new ways, to add variety to their meals. However, that would be contingent upon how adventuresome family members are to try new or different foods. That said, the book does contain some more well-known, traditional family-style recipes like beef stew, spaghetti and meatballs, and baked beans. 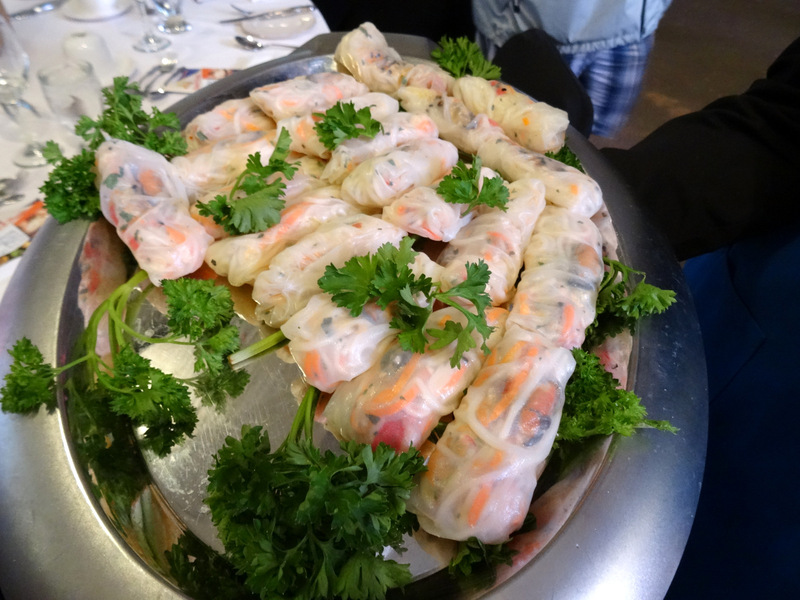 Smith also includes recipes that cross various cuisines – for example, there are Asian, Italian, Kenyan, and Greek-inspired recipes which would help to introduce children to foods and dishes from other countries and cultures. The recipes are well laid out with instructions using the ingredients in the order in which they are listed. I found the instructions complete and easy to follow; however, in my opinion, some familiarity with cooking would be beneficial when making recipes from the book as novice cooks could find some challenging. What I like most about this book is the full page color photo that accompanies each recipe. As we all know, we eat first with our eyes. If I see a color photo of an appetizing dish, I am more likely to be motivated to make it. This book scores high marks for the beautifully-executed photography. The photos are simplistic, clean, and are not overdone with props and excessive styling. The focus is on the food as it should be. Quality photos give the cook a point of reference of what he or she is aiming for and what his or her version of a recipe should look like. The book itself is beautiful, printed on high quality paper giving it a distinctively professional look and feel. Weighing in at some 3 pounds, though, this is not a cookbook you would balance in one hand while stirring a pot with the other! However, it is a lovely collector’s book for anyone with a cookbook collection and is in keeping with the size and style of Smith’s earlier published cookbooks. It’s one thing to leaf through a cookbook filled with photos of appetizing-looking dishes but the real test comes when you make some recipes out of the book. I selected three: Nutty Seedy Granola (p. 4), Granola Muffins (p. 51), and A Pan of Pork Chops with Marmalade Mustard Pan Sauce (p. 167). 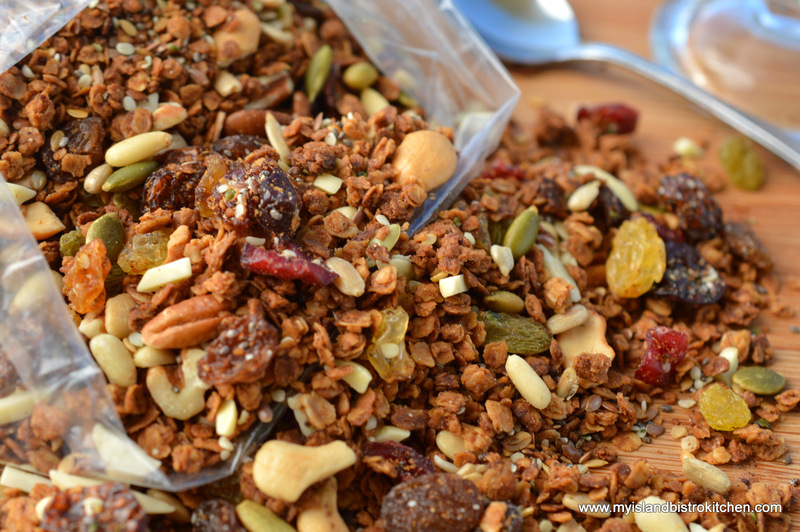 Beyond a doubt, this is the best granola I have ever had! 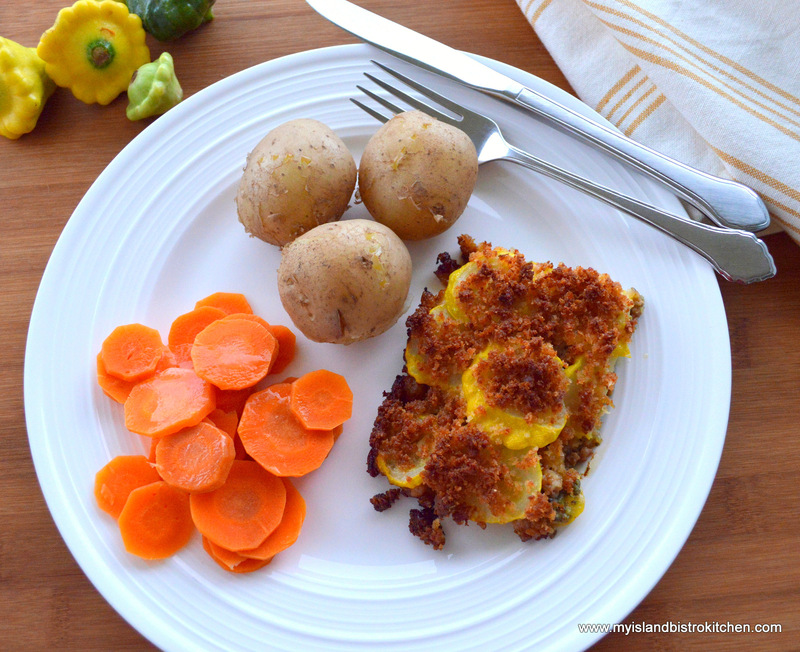 It was easy to make and I chose to include many of the different suggested ingredients Smith gave for the content and I think that’s what made it so darn tasty. My version (photo above) turned out very similar to the one in the book’s photograph. Because I had made the granola, I chose to then make the granola muffin recipe. 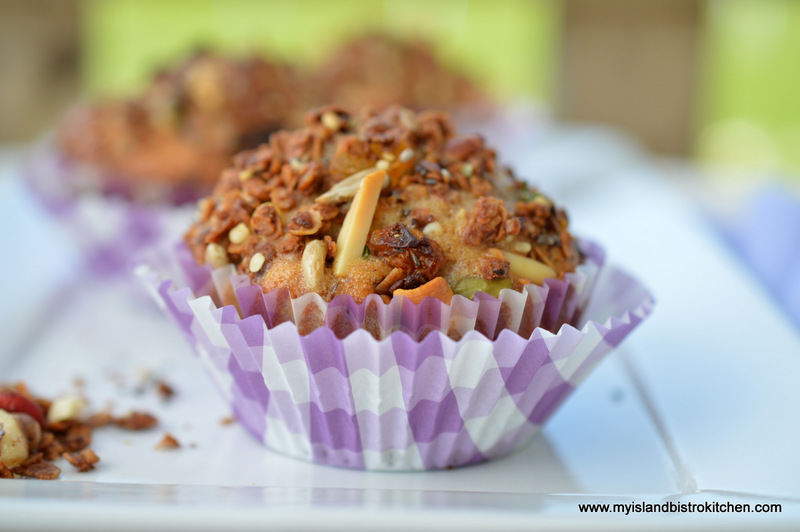 These muffins are, in a word, yummy! 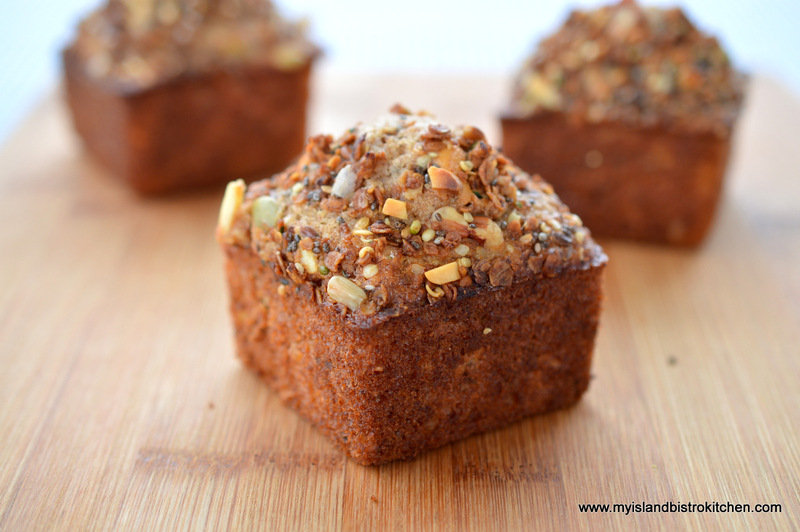 With some granola in the muffins themselves and then some on top of the muffins, these are a real treat. They also freeze well. I made half the recipe the first time, liked them so much that I turned around and made the full batch. 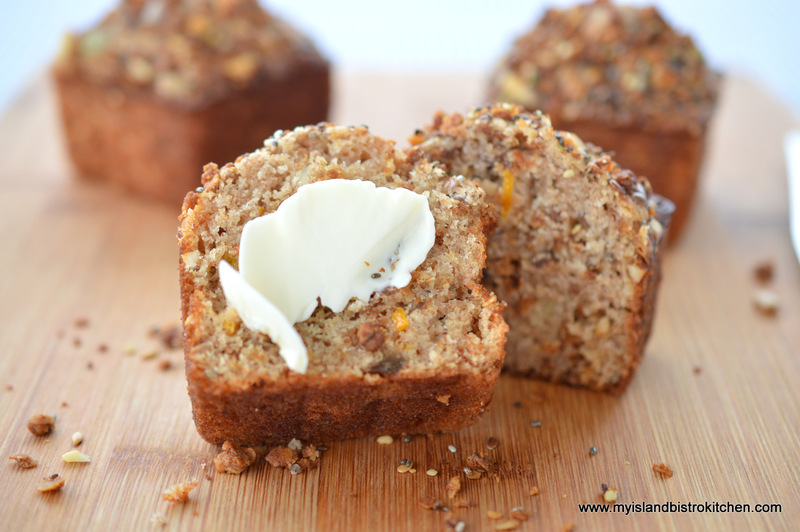 This recipe will now become part of my go-to muffin recipe collection. My muffins (see 3 photos above) very closely resembled the ones pictured in the cookbook. 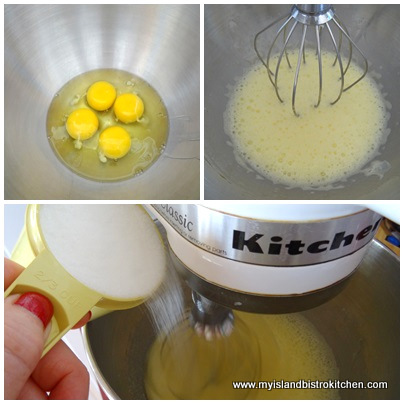 I found this recipe easy to make and it uses common ingredients I already had in the kitchen. 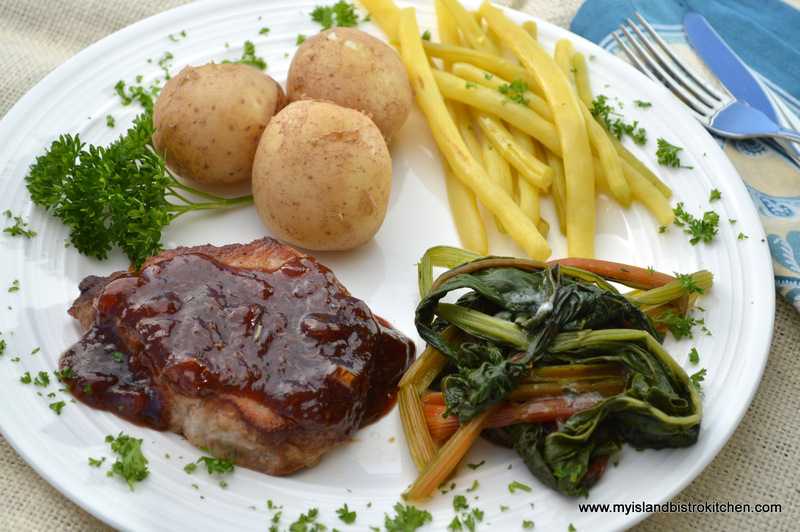 This is a very tasty way to present pork chops and I would definitely make the recipe again. My version (in above photo) of the sauce turned out a little darker than the photo in the book, probably because I used my own peach marmalade which was deep in color to begin with. 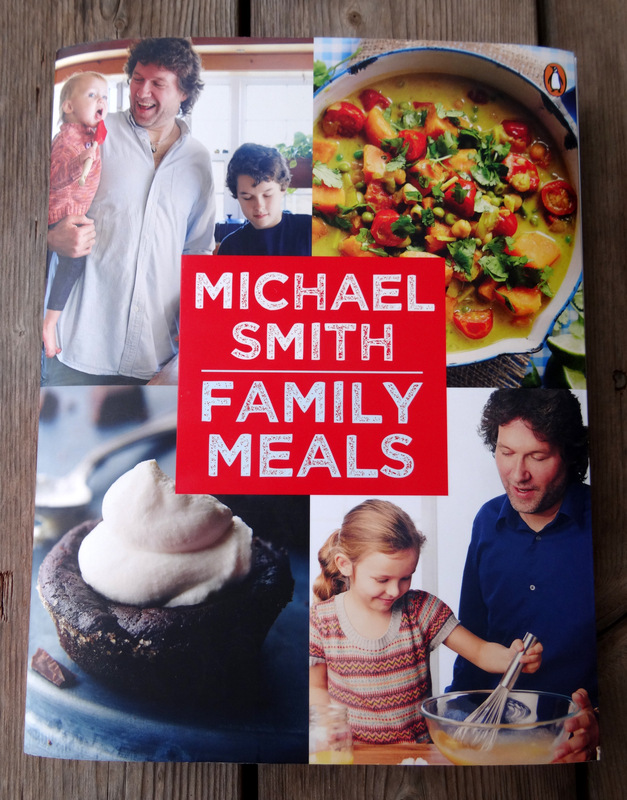 This book portrays the laid-back personality of Chef Michael Smith and his casual approach to cooking – look for phrases like “a splash or two of …”, “handfuls of fresh herbs”, “toss/stir the works together”, “a bottle of big beefy red wine” throughout the book. 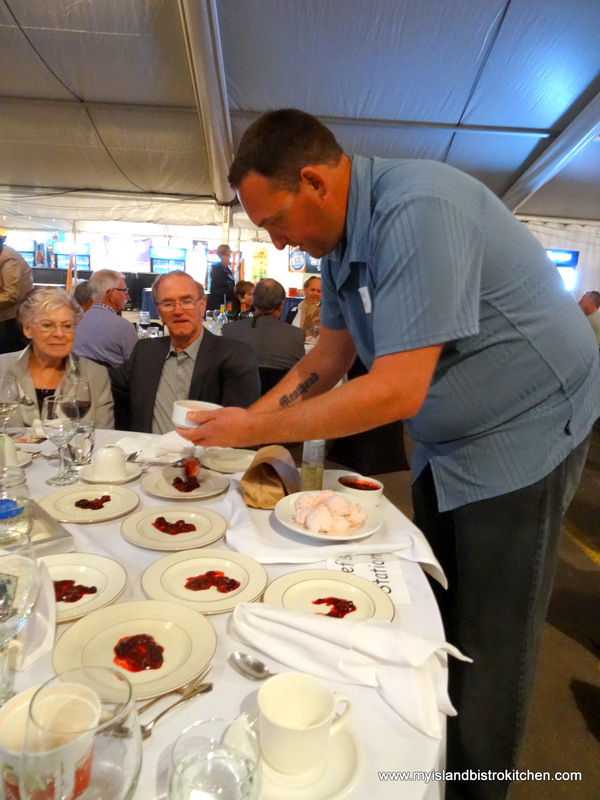 It shows his chatty, conversational style that those who follow Smith know is his style of cooking whether on television or in front of a live audience at events such as the Prince Edward Island International Shellfish Festival which he hosts each year. 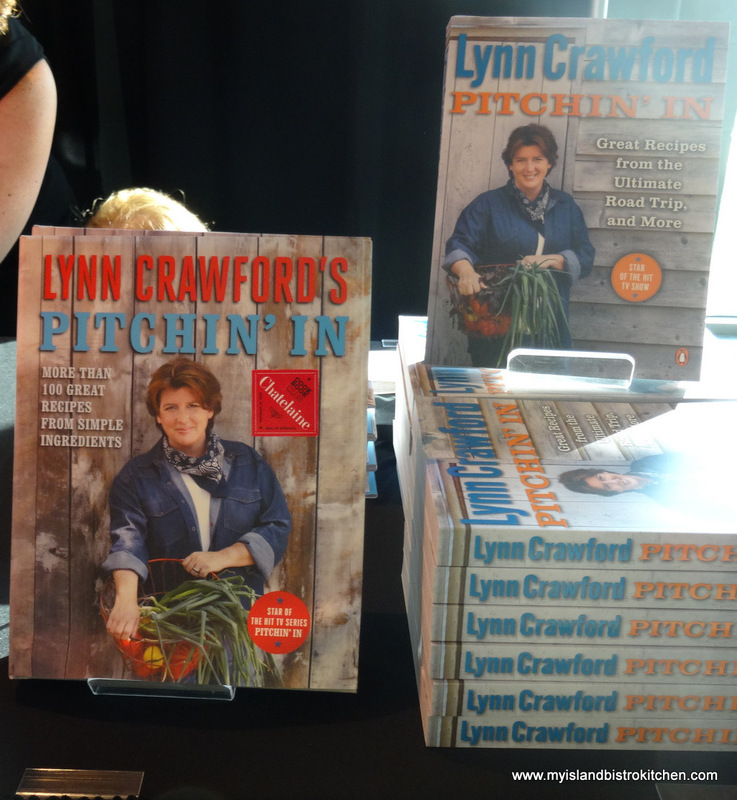 In my view, this book would be most suitable for individuals who have some familiarity with cooking, home chefs who are adventuresome in meal preparation, families willing to try some, perhaps, less common or less traditional ingredients and, of course, for fans of Chef Michael Smith. I received a copy of the Family Meals cookbook for review from Penguin Canada. I received no compensation for this review and was under no obligation to provide a positive review. The opinions are my own. 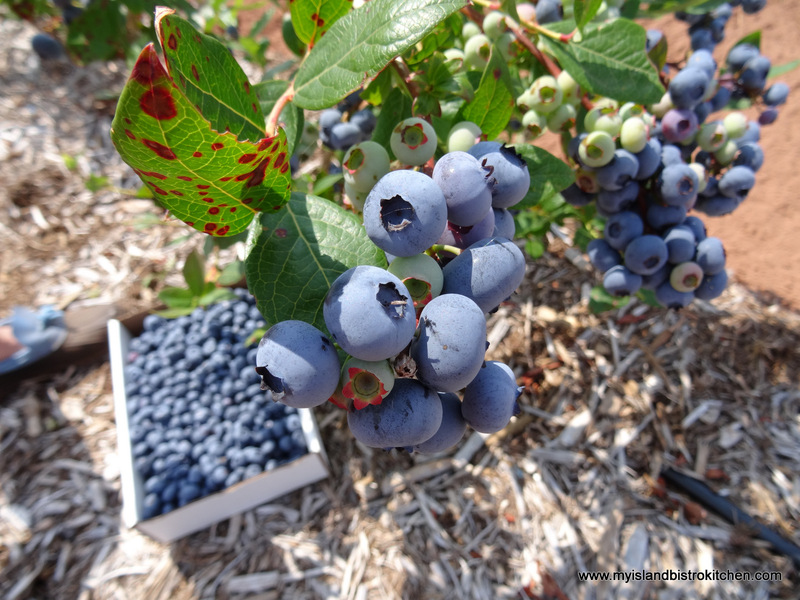 Blueberries are still in season on PEI as I write this posting. In fact, on the news last week, it was reported that there is an over-abundance of blueberries this year — is there such a thing as too many blueberries???? 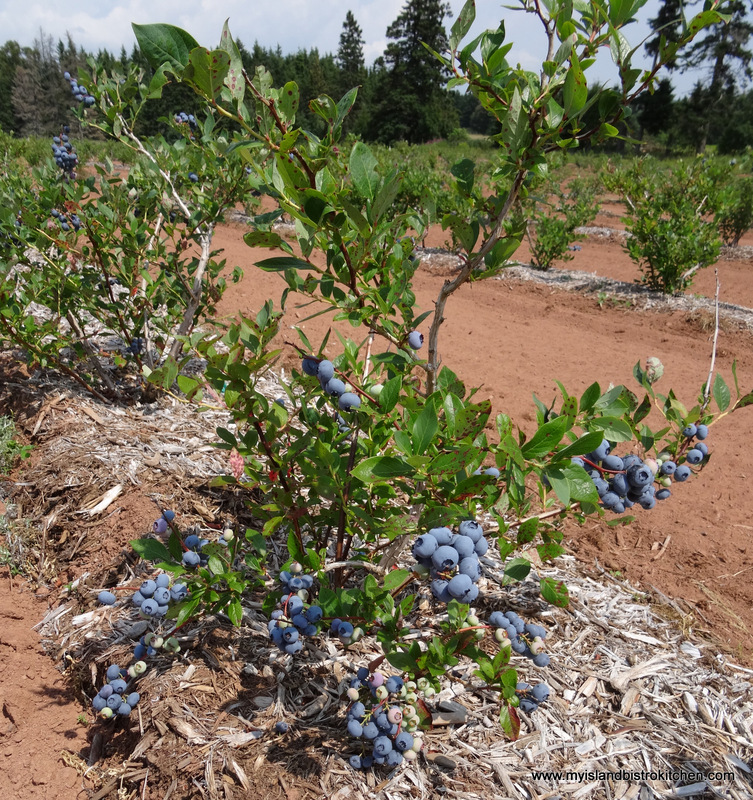 I love blueberries and, this year, we have been very fortunate in that the Murray family has a large field of U-pick high-bush blueberries in North Tryon, PEI. Suffice it to say, I’ve had a steady diet of blueberries for the past several weeks from their U-pick where they grow several varieties. I have also frozen a good many to have for winter use in my baking. 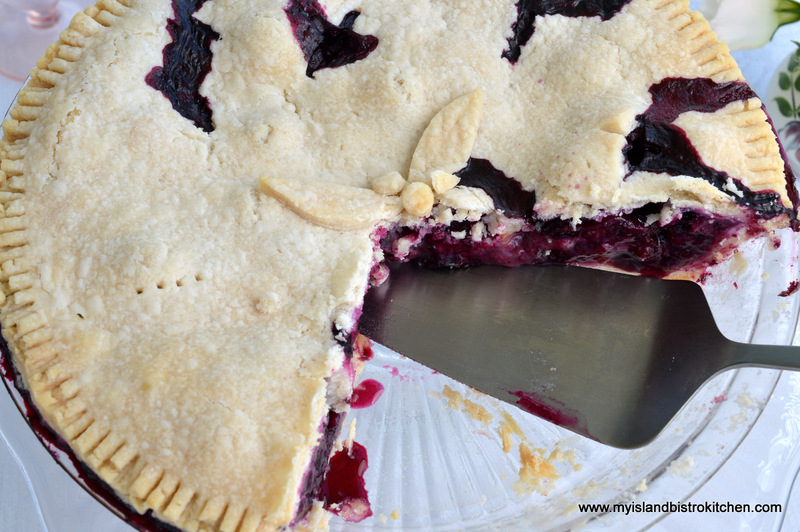 High bush blueberries are very easy and quick to pick. 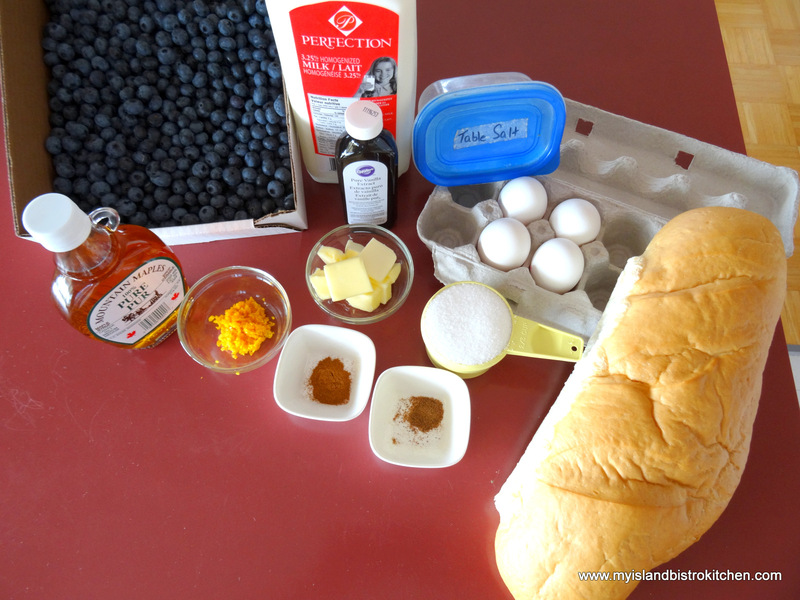 Earlier I shared my recipe for blueberry muffins. 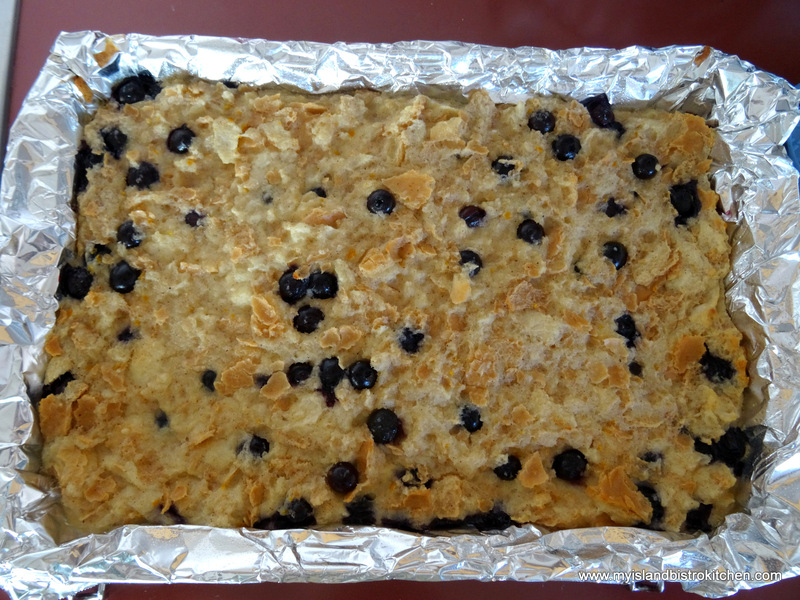 Today, I am sharing my recipe for blueberry bread pudding, an old-fashioned comfort food. This pudding is so tasty, it is hard to believe it is made with little else but bread, milk, and eggs! 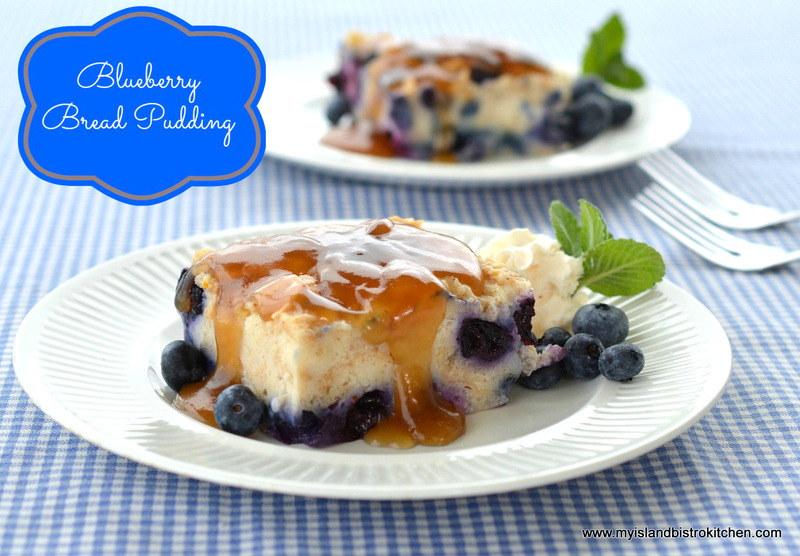 But, with a bit of extra flavoring, yummy blueberries, and a Grand Marnier sauce, this makes one luscious, decadent dessert! 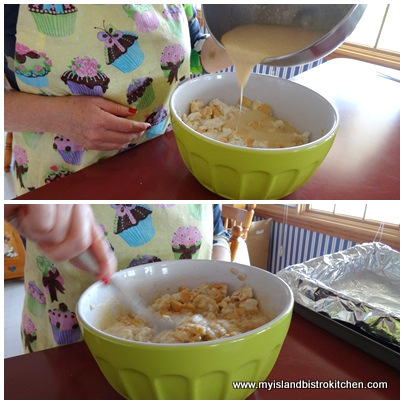 Some cube the bread, place it in a pan, and then pour the custard sauce over top. 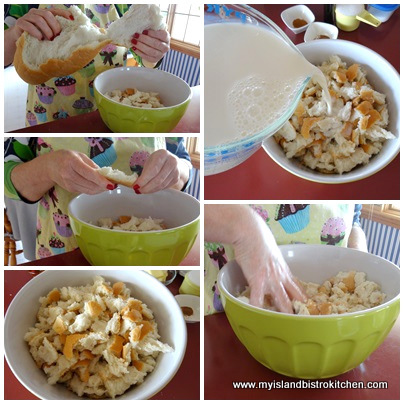 The method I use is different in that I tear up the bread into bite-size pieces, put it into a bowl, pour the milk over it and let it sit for about 15 minutes before hand-crushing the mixture. I find this technique makes for a smoother textured pudding. 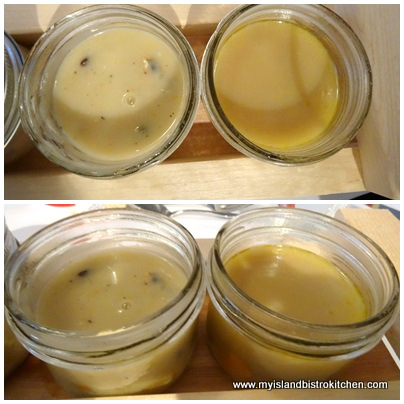 I have baked bread pudding both in a water bath and without. I find baking it in the hot water bath makes for a more moist pudding and the edges don’t tend to dry out. To bake a pudding in a water bath, you will need two sizes of pans – one to bake the pudding in and another larger pan that will accommodate the pudding pan. Fill the exterior pan with enough hot water that it comes up to about 1/2 way on the pan which holds the pudding. This is an easy pudding to make and does not take a lot of ingredients or complicated methods. It also freezes well so, if there happens to be leftovers, they can be stowed away for a later treat. I like to serve a warm brown sugar sauce (or a variation thereof, such as Grand Marnier sauce) with this pudding. However, it would also be tasty with a dollop of lemon curd, crème fraiche, or ice cream. Grease or line 9”x13” pan with greased tin foil. In large bowl, break the French bread into small pieces, crusts and all. Pour 4 cups of milk over the bread. 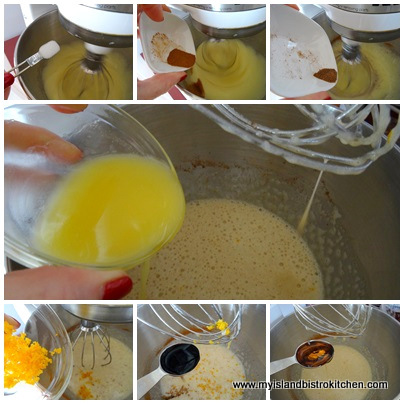 Cover and let sit for 15 minutes then hand-crush mixture until well blended. In a separate bowl, beat the eggs well. Add the sugar and beat again. Add the salt, vanilla, grated orange rind, cinnamon, nutmeg, maple syrup, and butter. Blend well. Pour over bread-milk mixture and mix well. 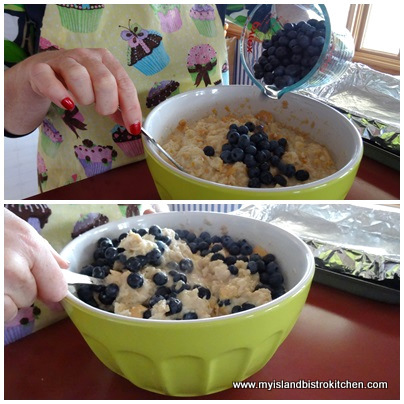 Lastly, gently fold in the blueberries being careful not to break the berries. Pour into prepared pan. Smooth batter evenly in pan. Place pan inside a larger pan. Place on oven rack in upper part of oven. Carefully pour hot water into the exterior pan until the water reaches about ½ way up the sides of the pudding pan. Bake for about 45-50 minutes or until top of pudding is nicely tanned and it springs back to a light touch and a cake tester (or toothpick) inserted into 2-3 places in the pudding comes out clean. 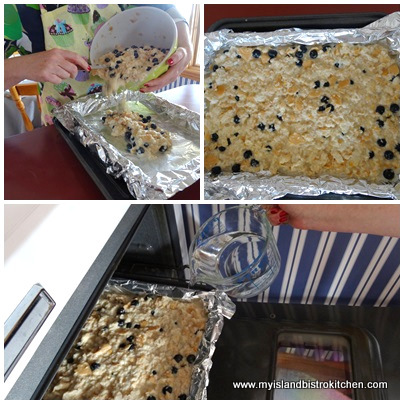 Remove from oven and water bath and transfer pudding pan to a rack to rest for 20 minutes. Slice into 12 pieces and serve warm with a brown sugar sauce (or my Grand Marnier sauce below), lemon curd, crème anglaise, or ice cream. In microwave safe bowl, mix the brown sugar, cornstarch, and salt together well. Add the boiling water, corn syrup, Grand Marnier, and vanilla together. Mix well. Add butter. Microwave until sauce boils and reaches desired consistency. 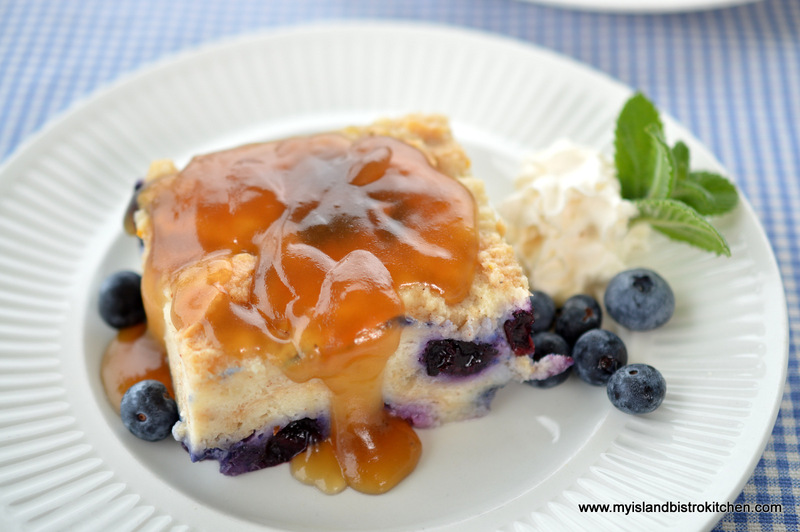 Serve over blueberry bread pudding. 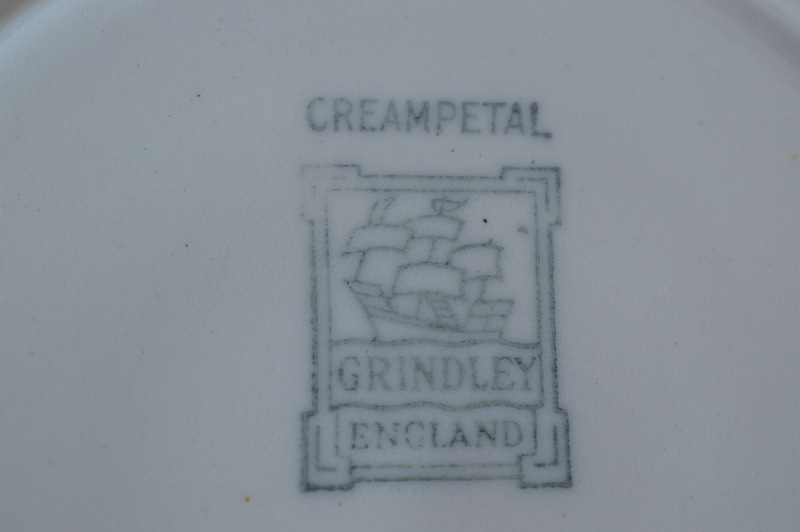 Both my mother and grandmother had the Grindley Creampetal “Apple Blossom” gold-gilded pattern of china. It was a fairly common pattern, particularly in the 1950s and 1960s. 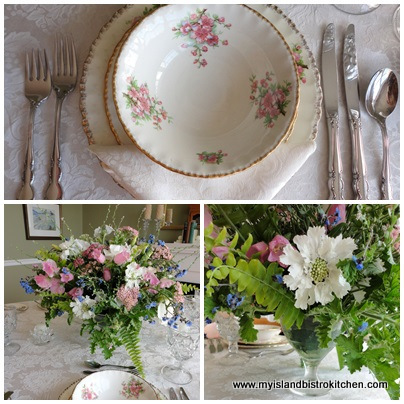 With its cream colored background and small pink and blue flowers with green leaves, it looked very stylish on the table for special occasions. 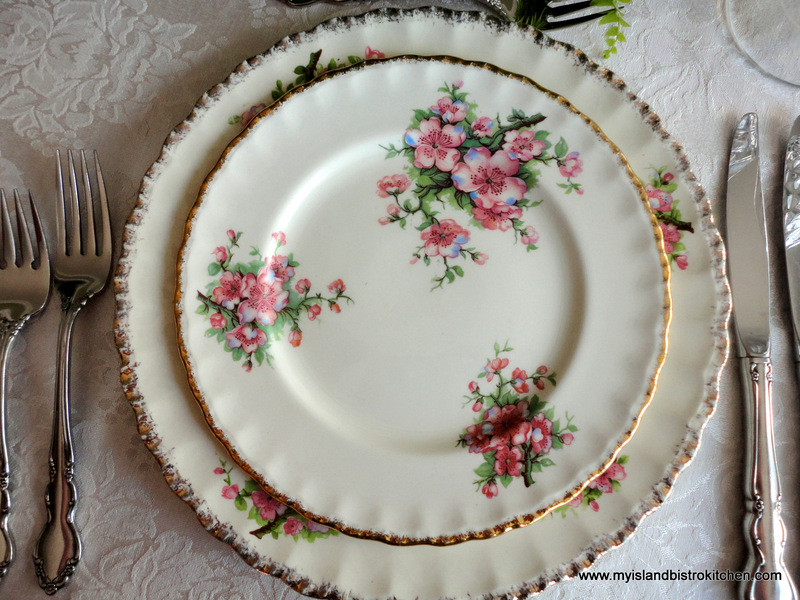 When this china came out, I knew it was for something very special! 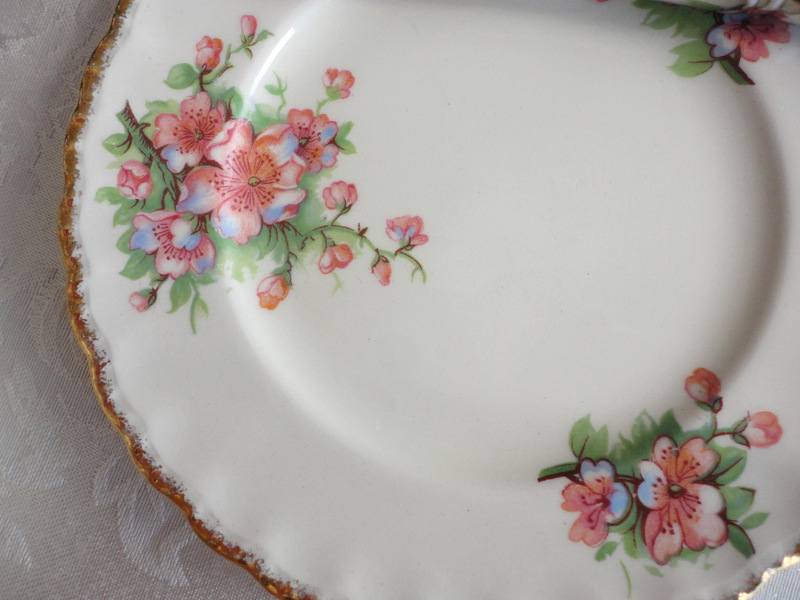 Today, this would be considered to be vintage tableware. I still like to use this dinnerware on occasion. 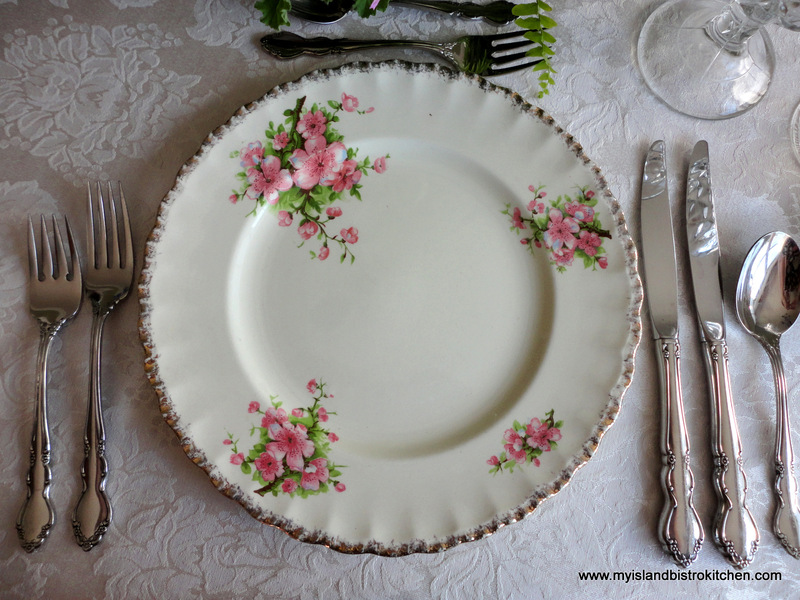 I think vintage tableware such as this calls for a romantic centerpiece. 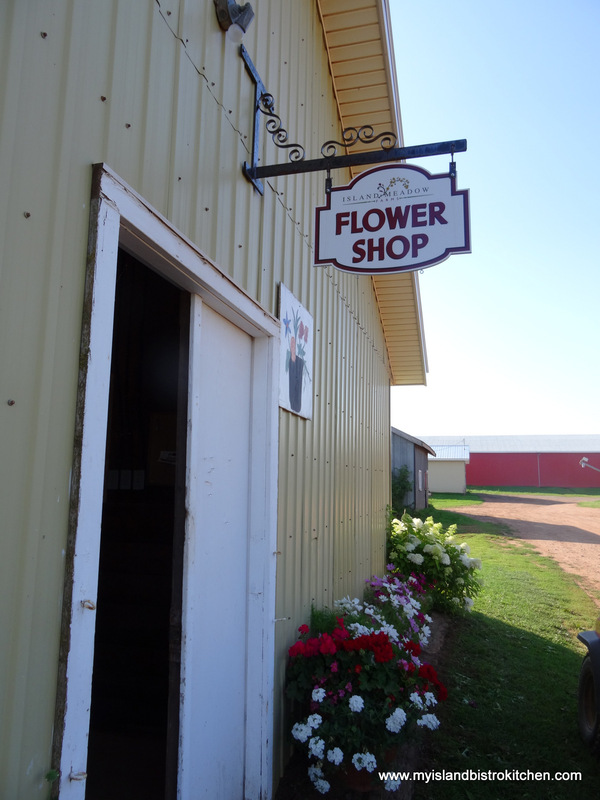 To find just the right flowers, I visited Island Meadow Farms in York, just minutes outside of Charlottetown. 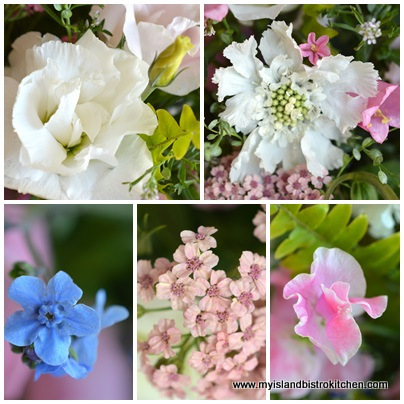 I am totally amazed at the array of beautiful flowers grown at Island Meadow Farms. Owner and floral designer, Barb Jewell, prepares dozens of stunning and romantic wedding bouquets over the summer and fall seasons. 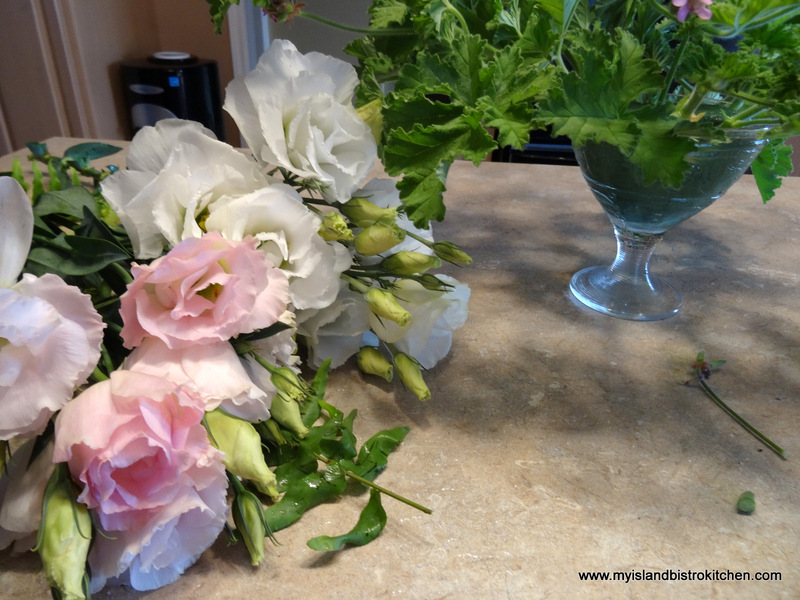 It’s not hard to understand why she is the choice of many Island brides for their wedding bouquets and floral arrangements. 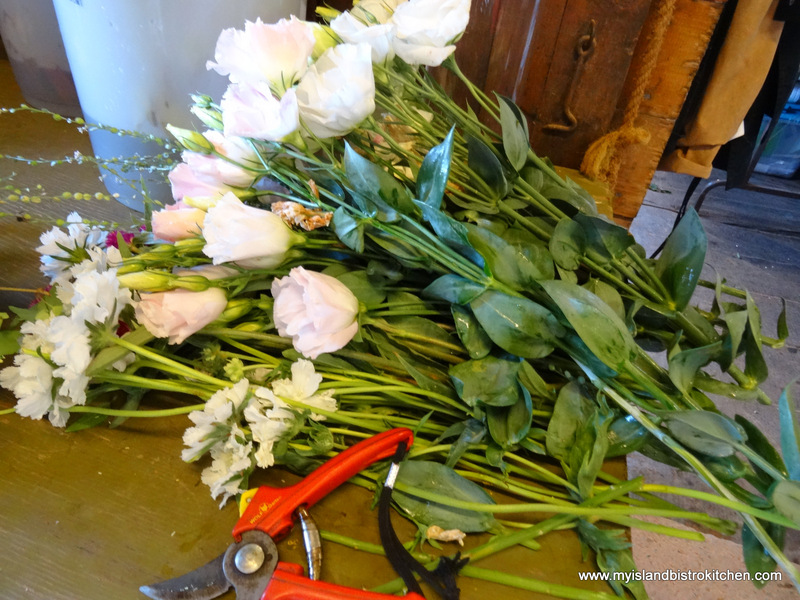 In addition, Island Meadow Farms also sells bouquets of cut flowers and makes floral arrangements for all occasions. I was looking for a romantic-style centerpiece that would compliment the dishes. In particular, I wanted old-fashioned flowers like the ones that would have been grown in flower gardens many years ago. 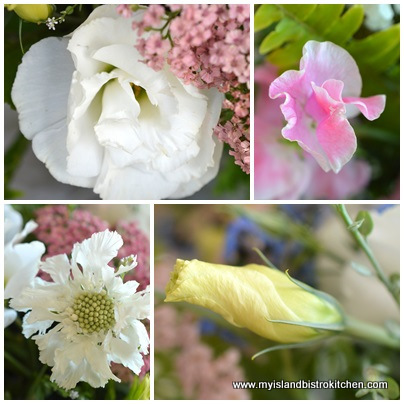 So, with one of my plates in hand for color-matching, I traveled to York and met with Barb Jewell to pick out the flowers and I was not disappointed in her recommendations. Home I came with a couple of buckets of fresh flowers. And, then the floral arranging began. And, here is my finished product…. 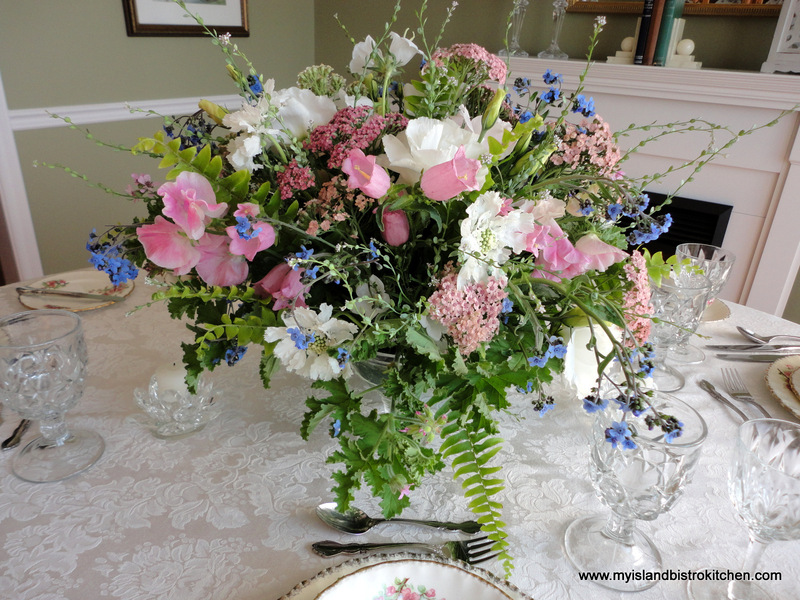 There are a number of flowers in this arrangement that include Estoma Lisianthia, Forget-me-Nots, Canterbury Bells, Campanula, Scabiosa, Sweet Peas, Yarrow, Cress, Boston Fern, and Scented Geranium. With an arrangement this bountiful and beautiful, there is little need for anything else to adorn the center of the table. I used a couple of little crystal votives on either side of the arrangement and that was it. Doesn’t it look summery and romantic! 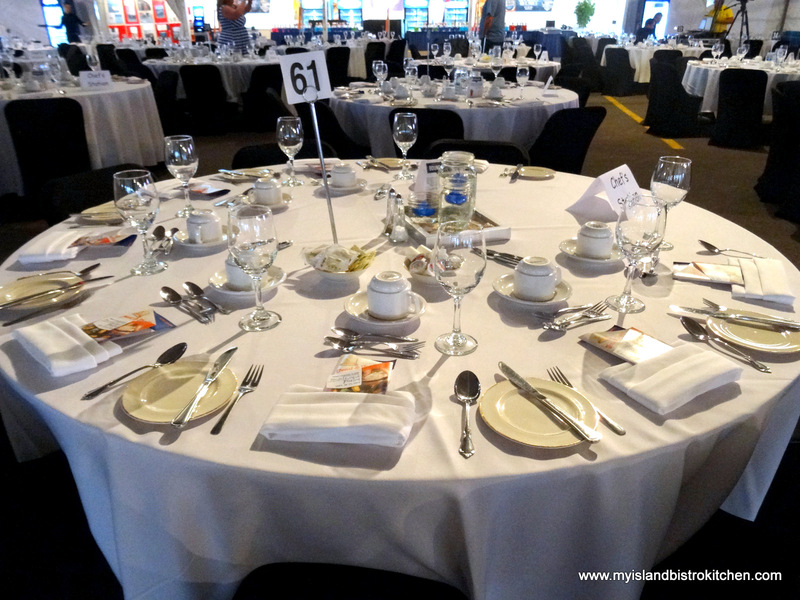 As you can see from the photo below, I started with a soft ivory tablecloth and matching napkins. 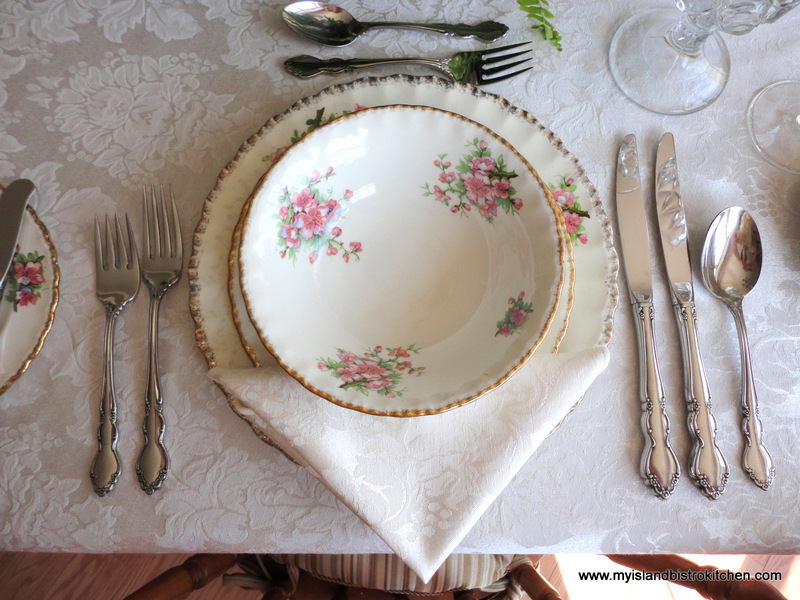 Tableware is presented in the order in which the meal will be served starting with the soup course. This was followed by the salad course. And, the plate for the entrée. 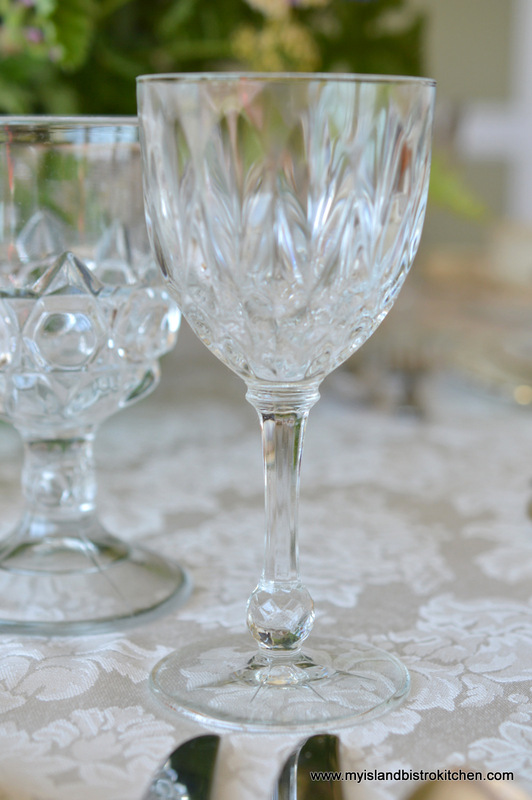 When using vintage dinnerware, I recommend keeping the glasswear of similar or complimentary style (as opposed to using contemporary water and wine glasses). This means the glasses can have lots of cuts and design in them. 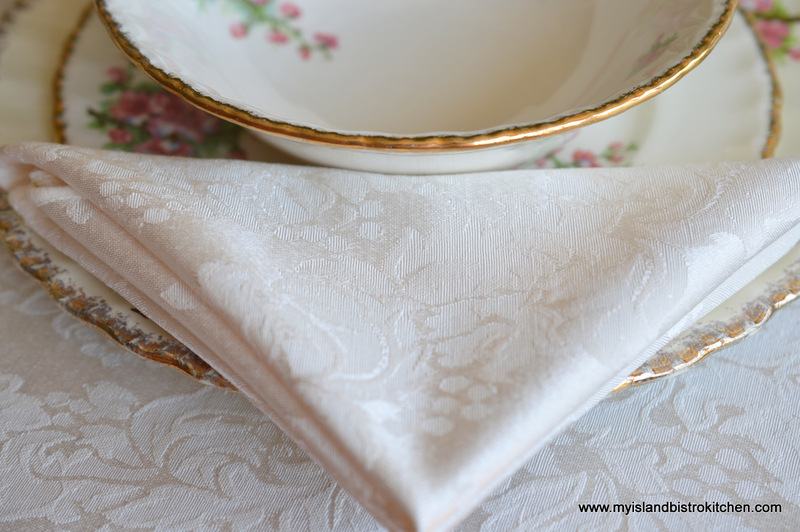 I used a very basic, simple fold for the napkin so it would not compete with, or detract from, both the dinnerware and the floral centerpiece. 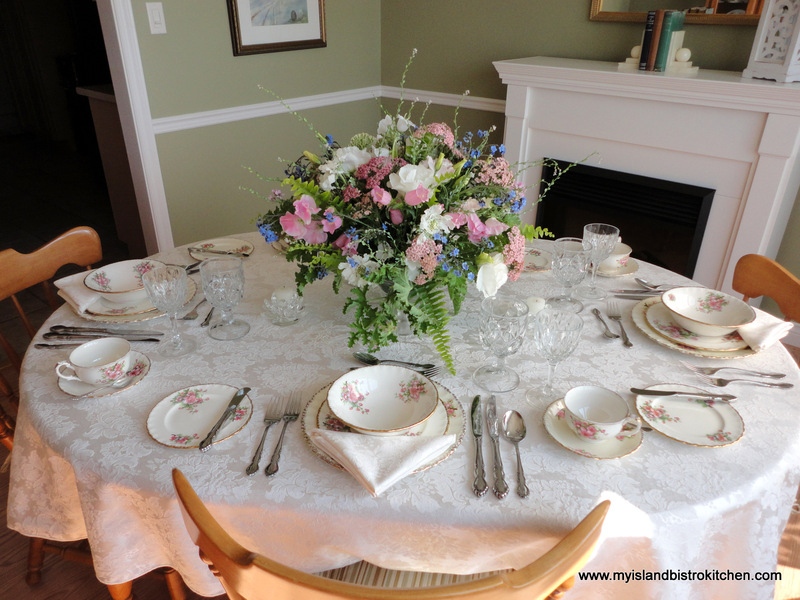 And, the table is set, ready for dinner guests. 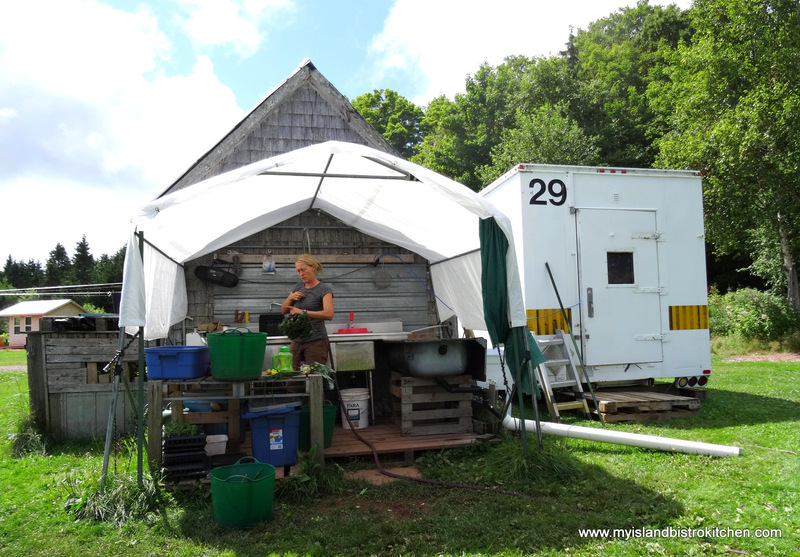 For more information on Island Meadow Farms, visit their website at http://www.islandmeadowfarms.ca/. 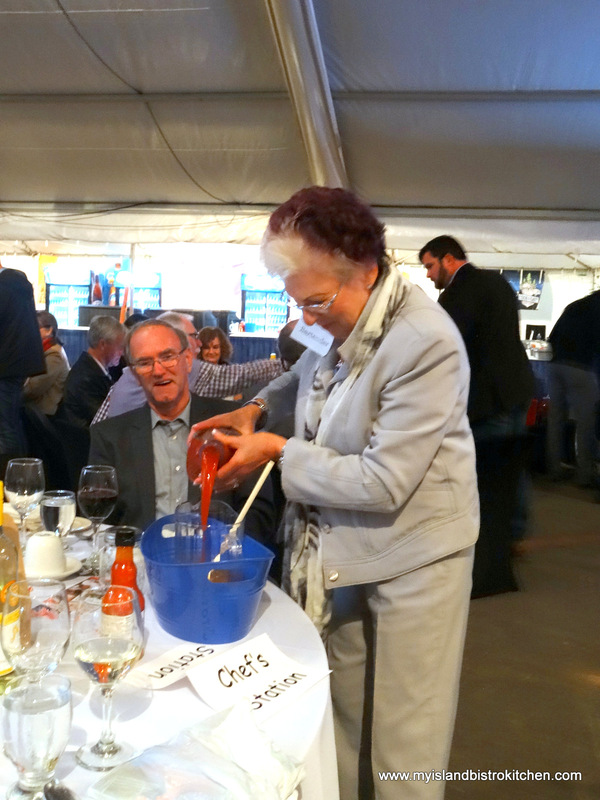 I thoroughly enjoy September on Prince Edward Island for many reasons but, topping the list, has to be the array of culinary events that form the Fall Flavours Festival, a month-long celebration of all things food on the Island. 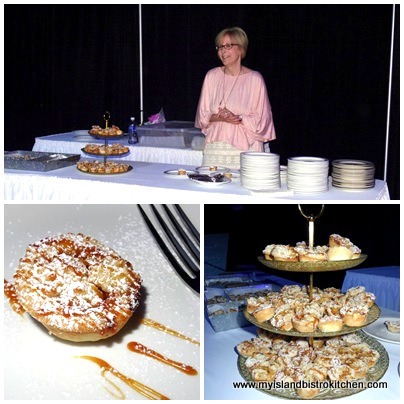 If you are a regular follower of my blog, you will recall postings from 2012 and 2013 about previous Fall Flavours events I attended and one in August 2014 about the Fall Flavours Festival in general. 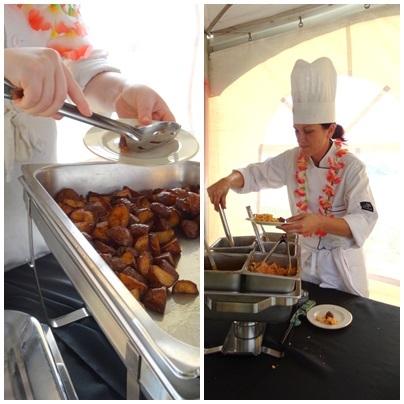 The 2014 Fall Flavours Festival kicked off on September 6, 2014, with an event to celebrate the creation of Canada. 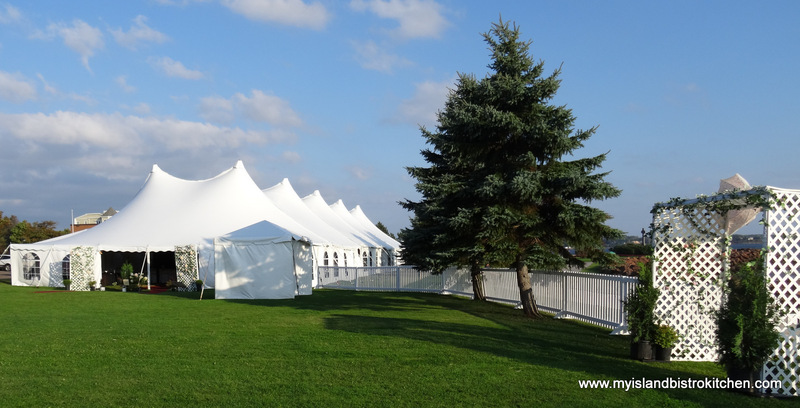 This signature event was held on the grounds of the Culinary Institute of Canada, in Charlottetown, PEI. But, before I tell you about the evening, just a short lesson on Canadian history to help explain the significance of the grand Feast of the Fathers event. This year (2014) marks the 150th anniversary of the 1864 Charlottetown Conference that set off a chain of events that eventually led to the forming of Canada. Prince Edward Island, Nova Scotia, and New Brunswick delegates were meeting in Charlottetown in early September, 1864, to discuss the possibility of a Maritime Union. When political leaders from what, today, are the provinces of Quebec and Ontario, heard of the meeting, they asked to attend. 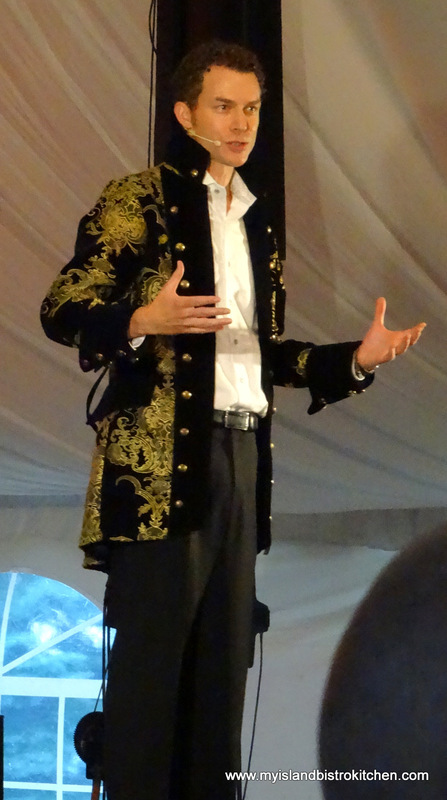 One of the delegates was Sir John A. Macdonald who would later go on to become Canada’s first prime minister. The delegates journeyed down the St. Lawrence to Charlottetown and discussions began about a much larger union than that of the three Maritime Provinces. The delegates arriving at the foot of Great George Street and making their way up to Province House weren’t, however, the only show in town. 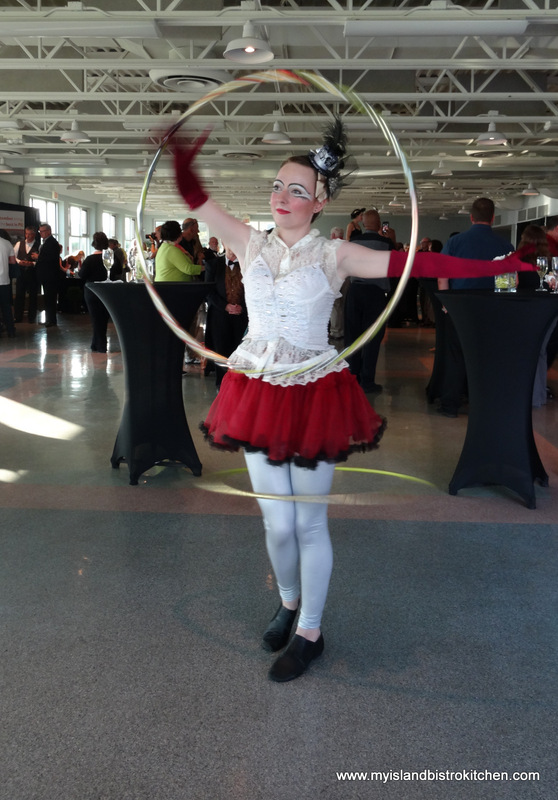 A circus had rolled into Charlottetown and, as a result, there were few on hand at the dock to greet the now-famous Fathers of Confederation who would be instrumental in forming a nation. The delegates met for several days and amidst formal meetings, elegant balls, and banquets, approval for Confederation was achieved with plans made for further conferences to be held in Quebec and London. Eventually, on July 1, 1867, the Dominion of Canada was formed with the proclamation of the British North America Act. 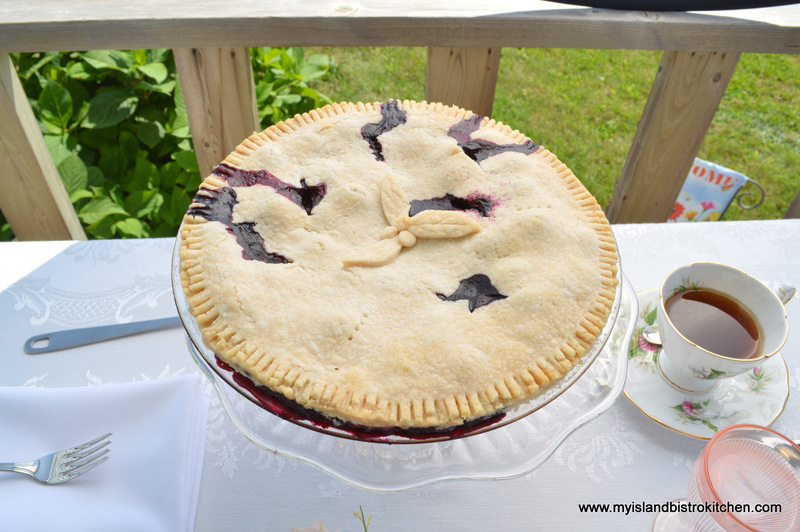 Now, you might wonder what this brief Canadian history lesson has to do with a food blog. Well, this summer, there have been a tremendous number of events on PEI to commemorate and celebrate the 150th anniversary of the first meeting of the Fathers of Confederation who worked to form the nation. 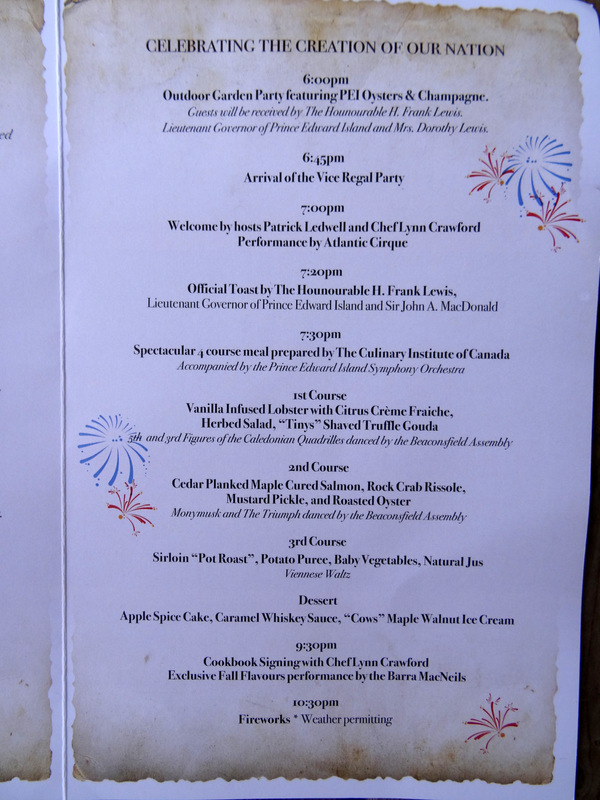 The Feast of the Fathers culinary event set out to recreate an evening and menu much like the Fathers of Confederation might have experienced during their stay on PEI in 1864. And, this event did not disappoint. It was beautifully and artfully executed in every way. 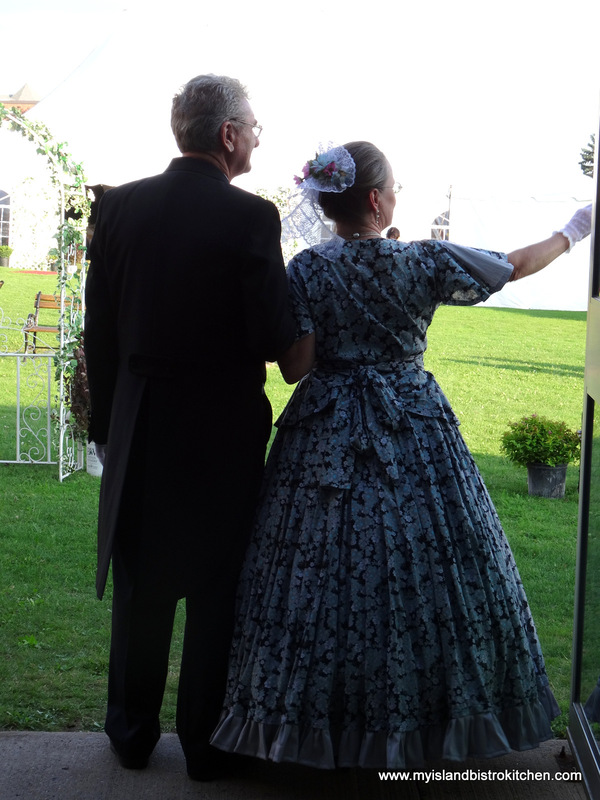 Guests to the Feast of the Fathers dinner were met by the Fathers and Mothers of Confederation who, in period costume, stroll the streets of Charlottetown in the summer months. 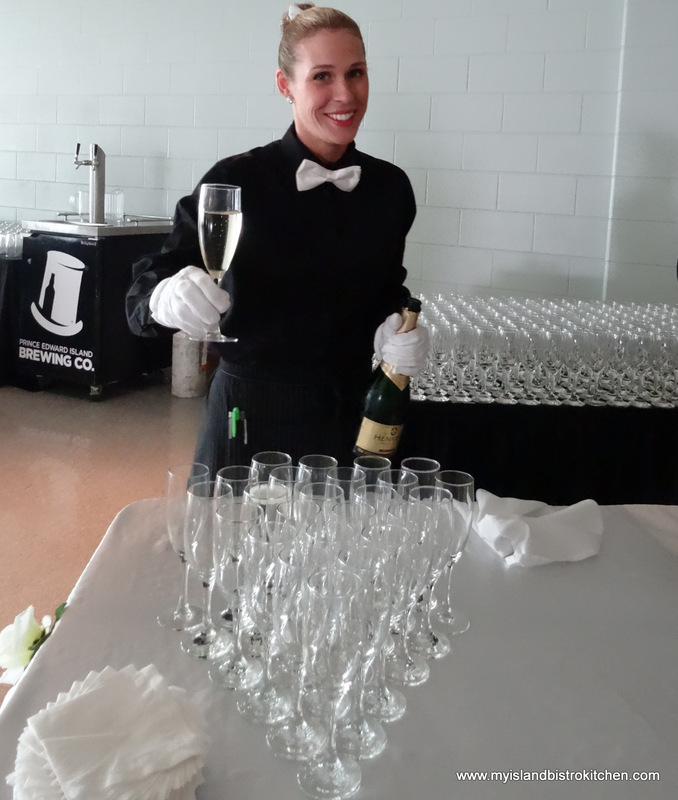 The evening began at 6:00pm with a champagne and oyster bar reception. 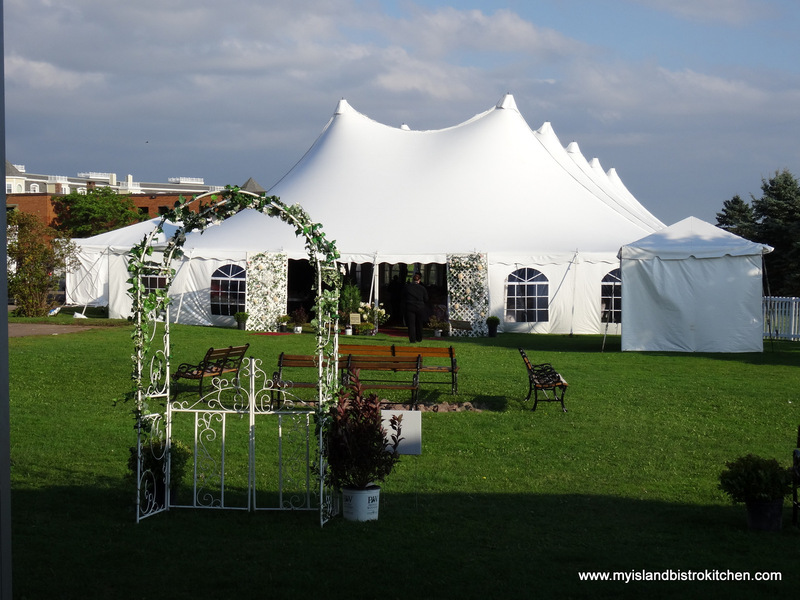 Plans were for the reception to take place outside on the grounds of the Culinary Institute which overlooks the water. 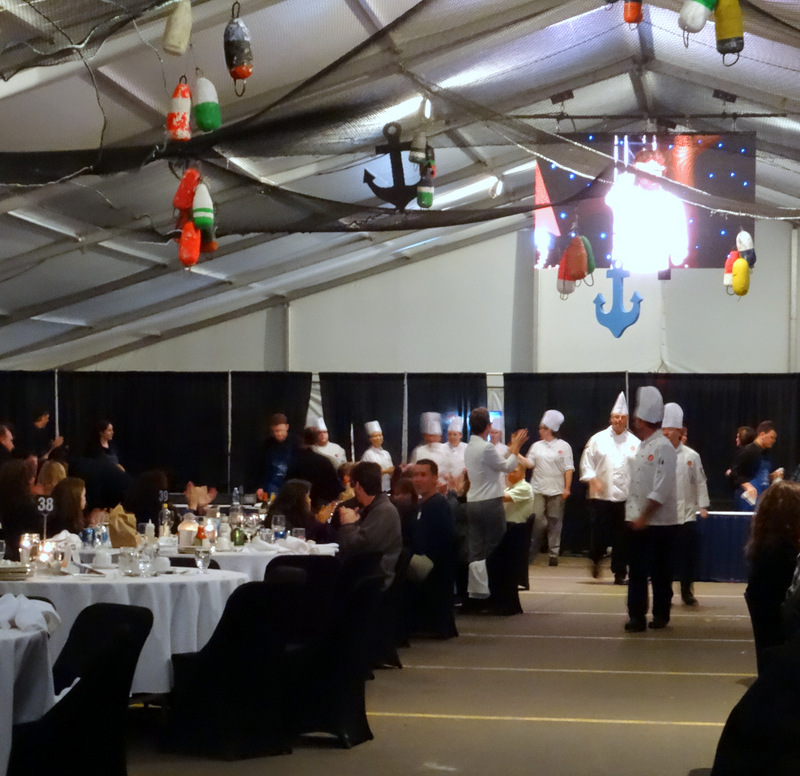 However, winds were a little too strong so the event was moved inside to the lower level of the Culinary Institute. 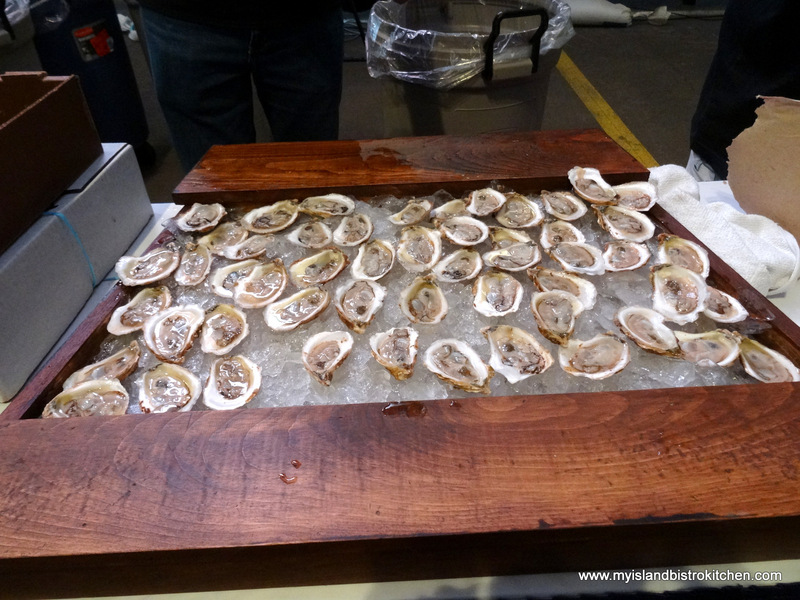 Guests were greeted with a glass of champagne and then they made their way to one of two oyster bars. 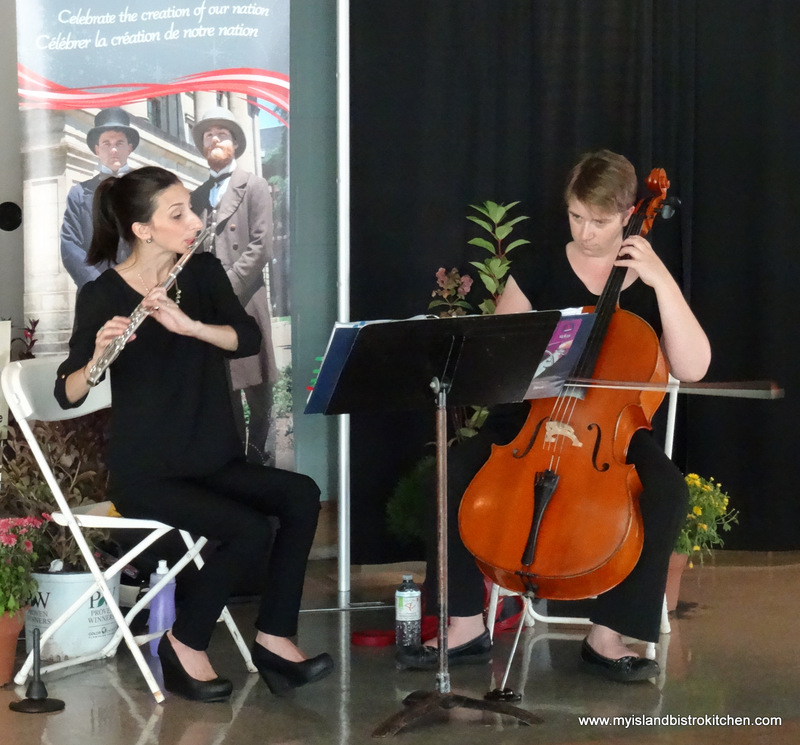 Talented musicians provided beautiful music during the reception. 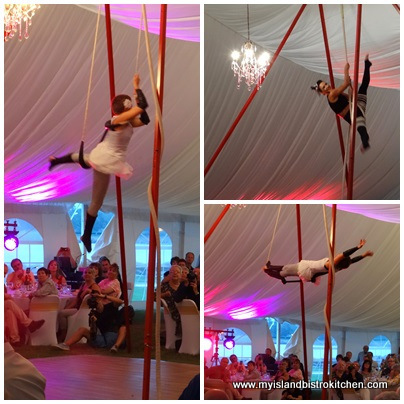 Circus performers from Atlantic Cirque entertained guests. 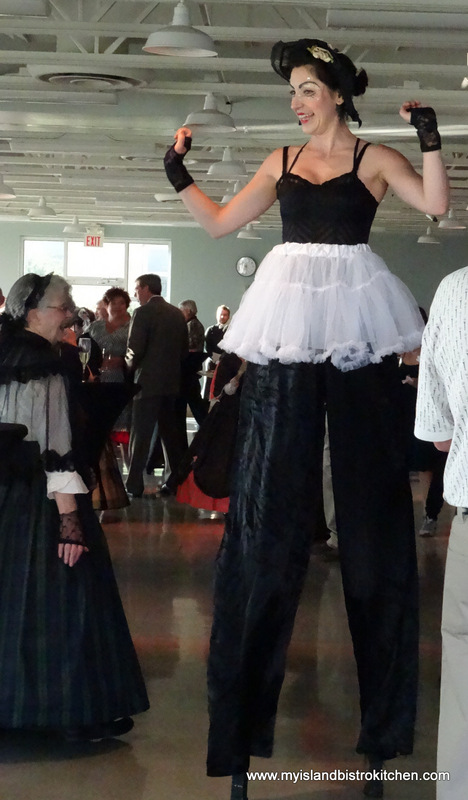 This gal could really navigate on stilts! 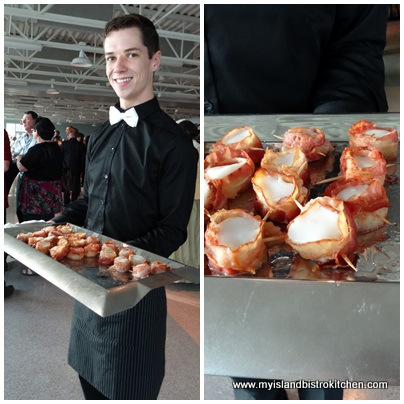 Waiters circulated with trays of tasty hors d’oeuvres – a bacon-wrapped scallop, anyone? 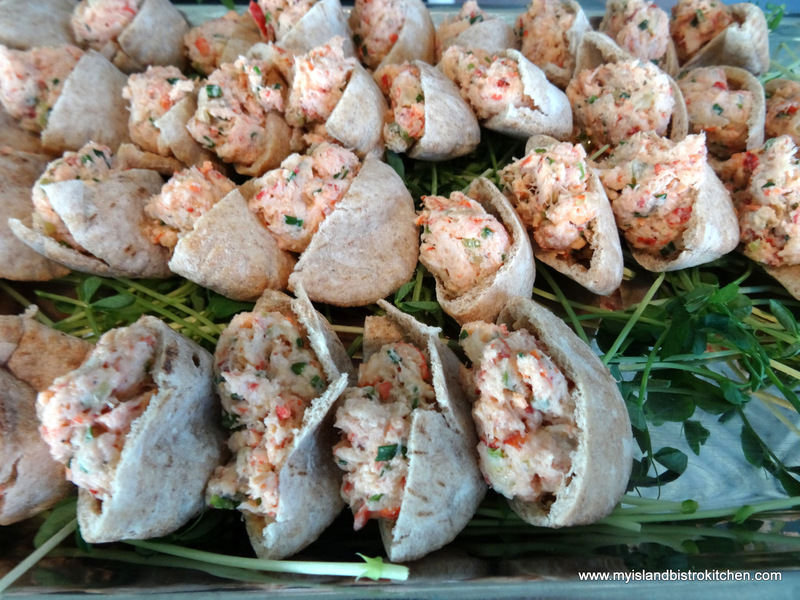 But, wait, there’s more – lobster salad in mini pitas. Now, these were divine morsels! 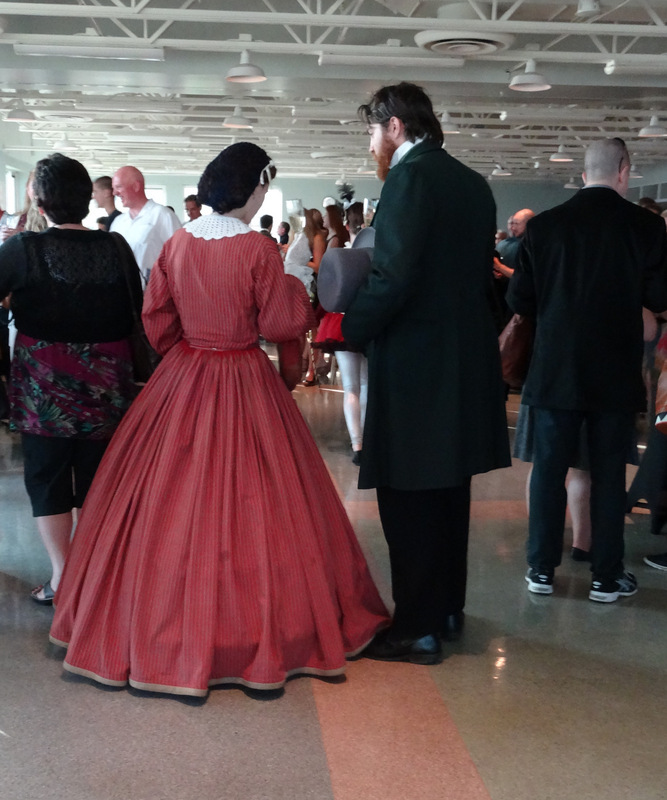 Several people arrived in clothing representative of 1864 fashion. 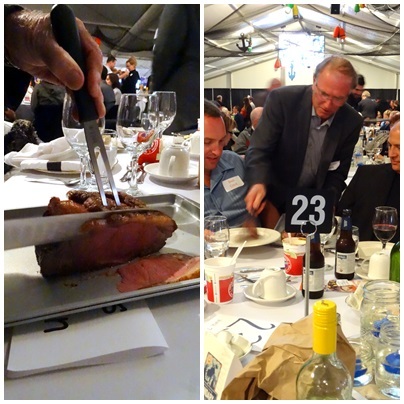 Dinner was to be served in a huge tent on the Culinary Institute grounds. 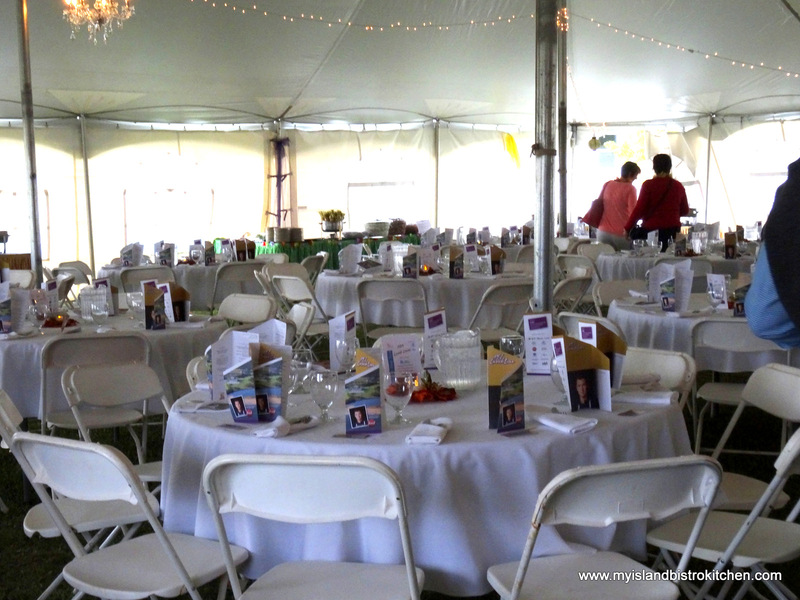 I made my way into the tent before guests arrived so I could photograph the beautifully set tables. The color theme was white and gold. Well-set tables always take my eye. 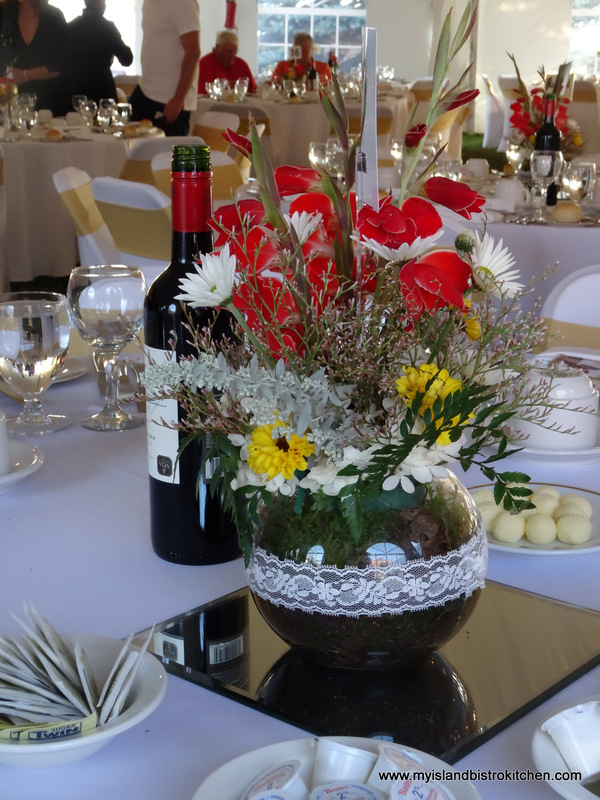 Lovely late summer table centerpieces adorned each table. 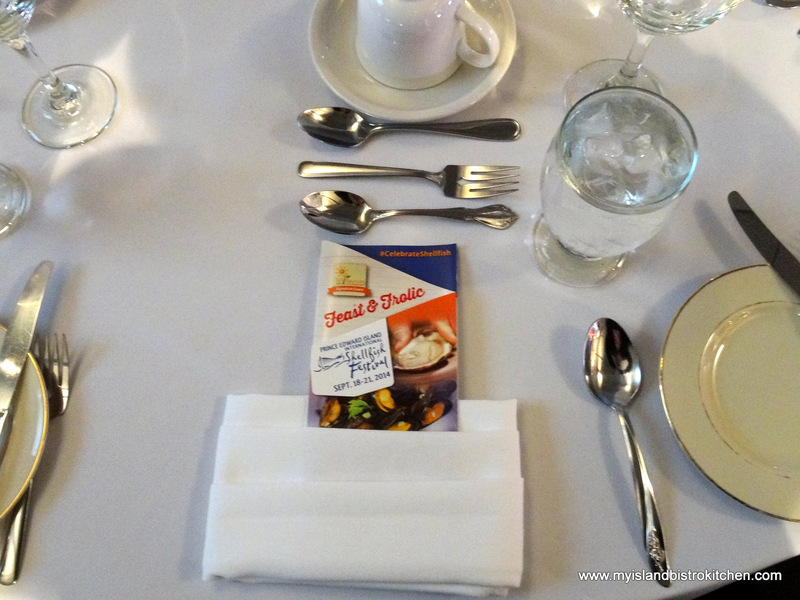 Each place setting had the evening’s program and menu tucked inside the napkin fold. 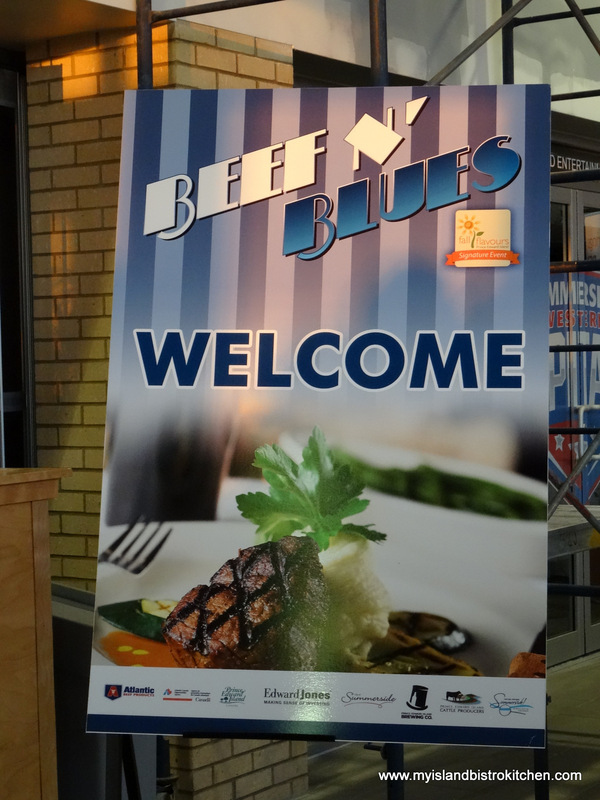 Take a look at the evening’s program and menu….. 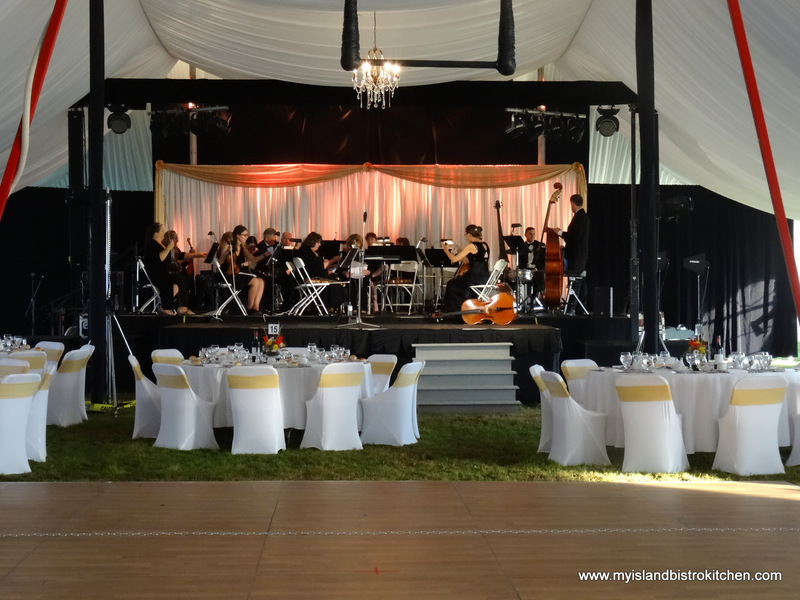 The PEI Symphony was setting up and tuning the strings. 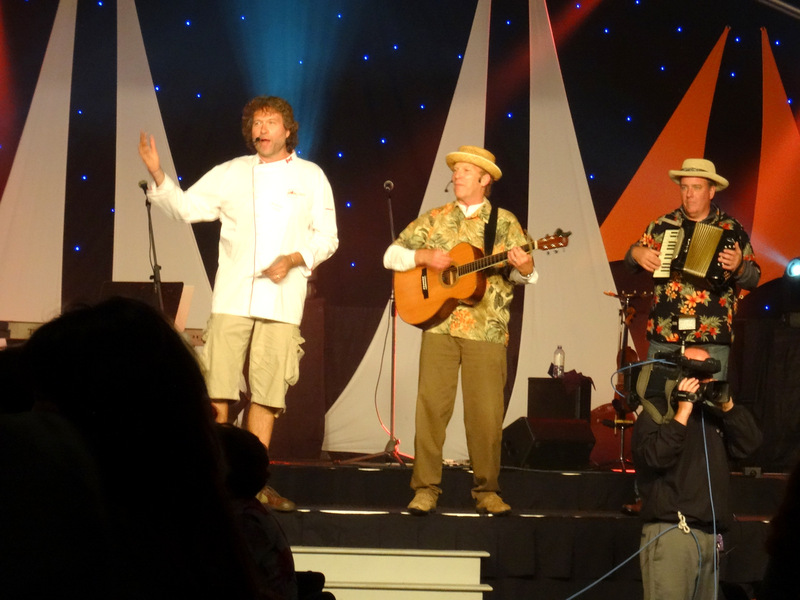 The evening was co-hosted by local comedian Patrick Ledwell and celebrity chef, Lynn Crawford. These two proved to be a great combo. 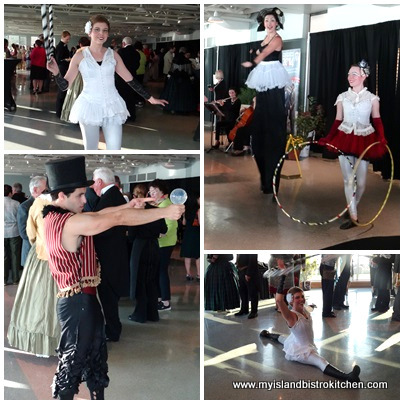 A pre-dinner performance by the Atlantic Cirque thrilled guests. 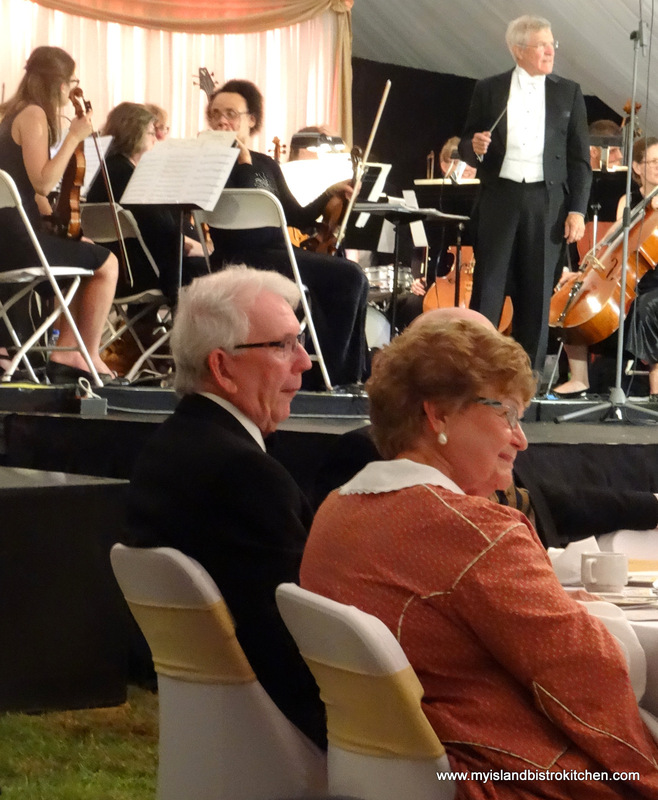 The event was also attended by PEI’s Lieutenant-Governor, The Honourable H. Frank Lewis, and Mrs. Dorothy Lewis. 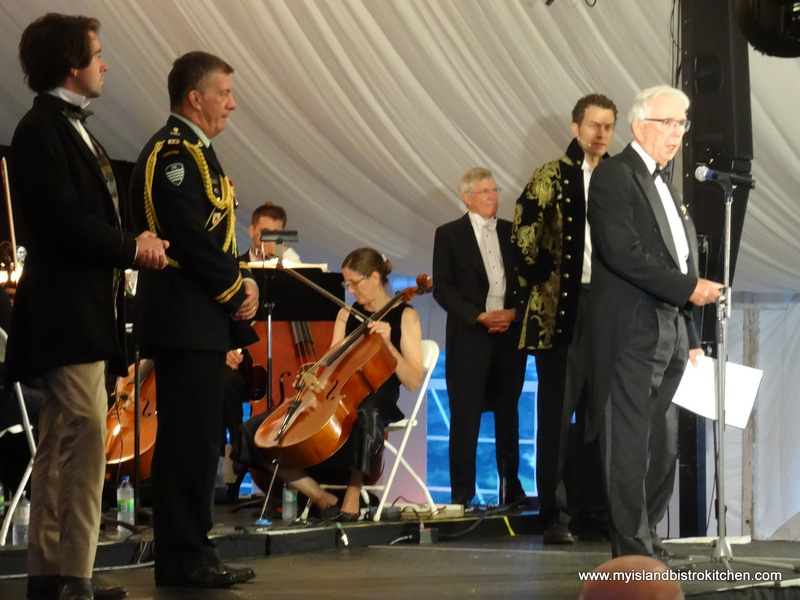 The Lieutenant Governor, with Sir John A. MacDonald (on the far left of photo below) looking on, made the Official Toast and then the scrumptuous meal commenced. 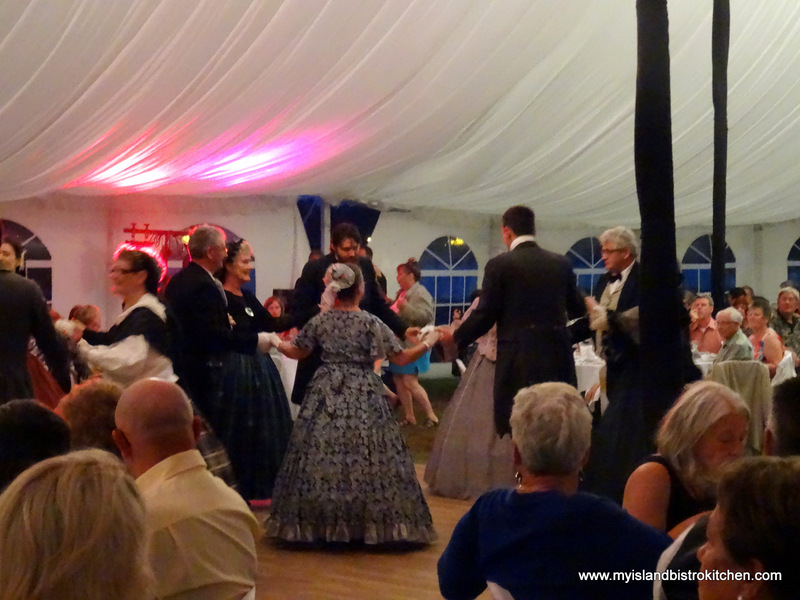 Each course was accompanied by an element of entertainment reminiscent of events around the 1864 Conference. 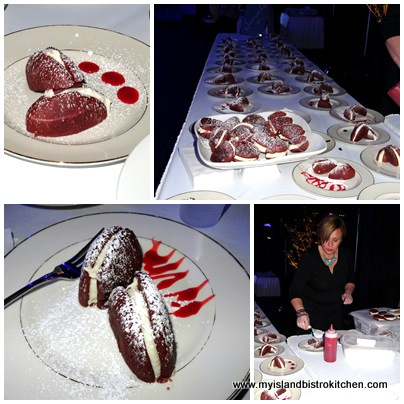 At the beginning of each course, Chef Lynn described the meal to whet everyone’s appetite. 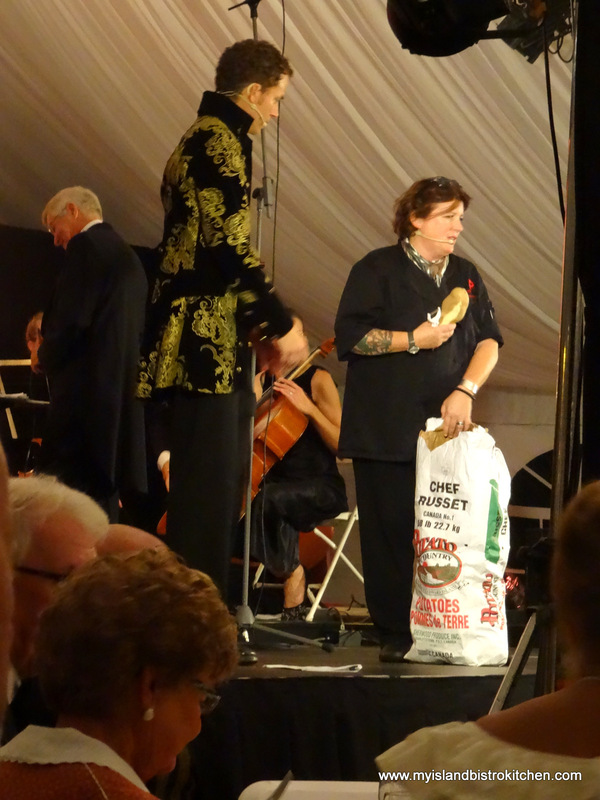 The PEI Symphony provided the musical accompaniment throughout the evening. 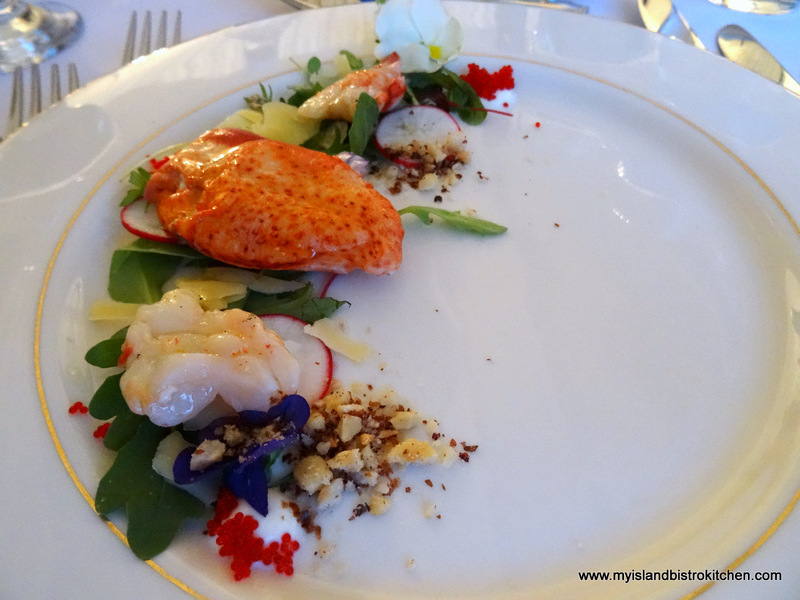 Vanilla Infused Lobster with Citrus Crème Fraiche, Herbed Salad, “Tinys” Shaved Truffle Gouda. This was so tastefully and artfully presented (and it tasted every bit as good as it looked!). The Beaconsfield Assembly Scottish dance group danced the 5th and 3rd figures of the Caledonian Quadrilles. 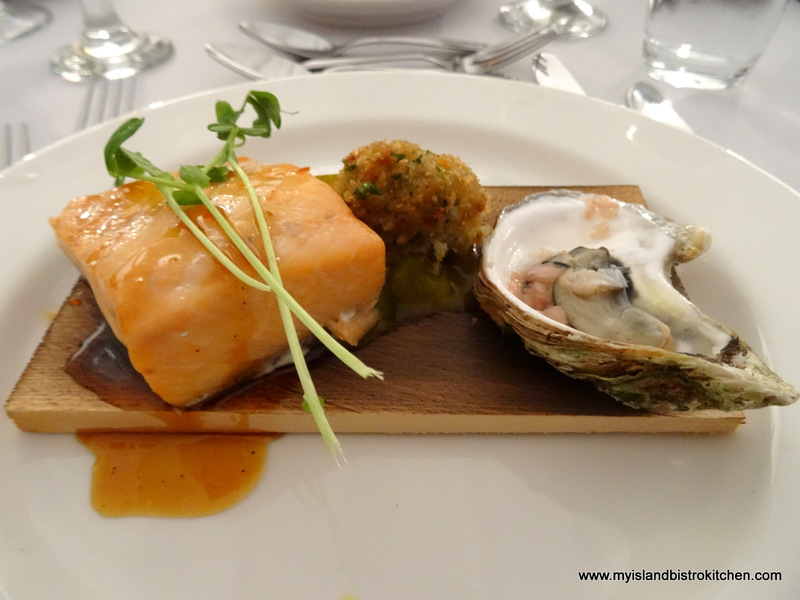 Cedar Planked Maple Cured Salmon, Rock Crab Rissole, Mustard Pickle, and Roasted Oyster. Absolutely divine. The Beaconsfield Assembly danced the Monymusk and The Triumph during this course of the meal. 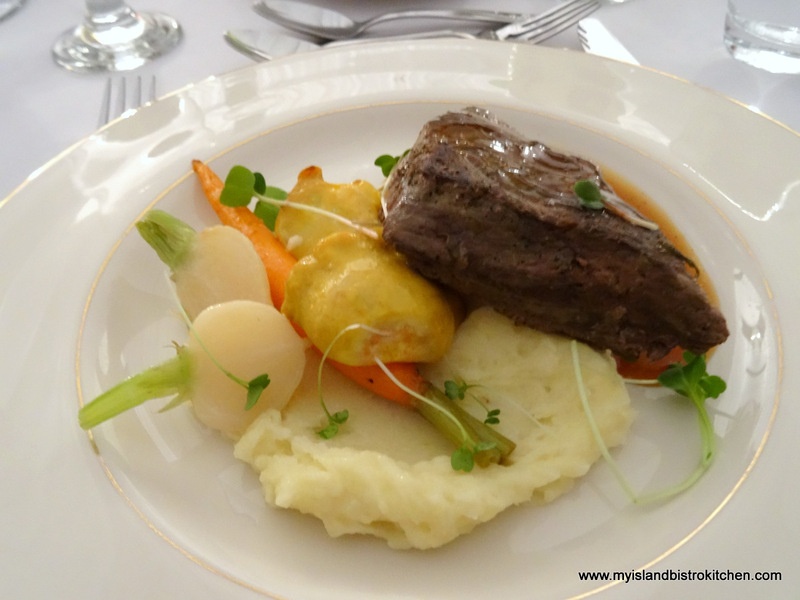 Sirloin “Pot Roast”, Potato Purée, Baby Vegetables, Natural Jus. Beautiful presentation! 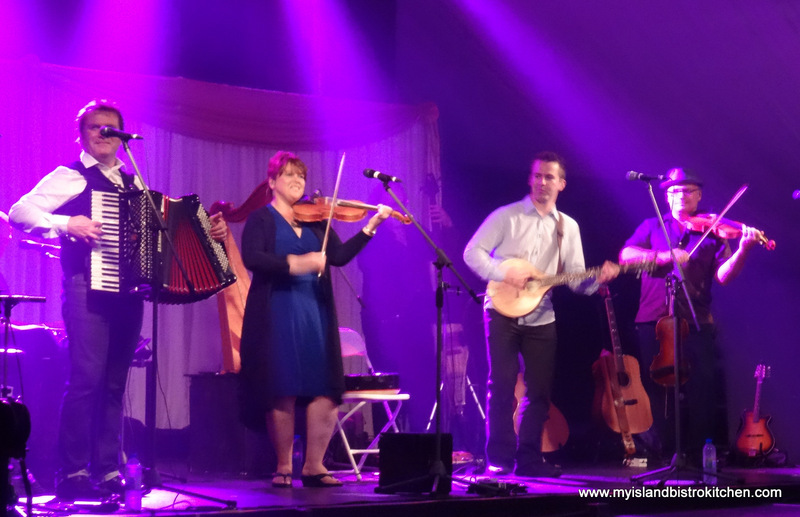 The Beaconsfield Assembly, joined by the Fathers and Mothers of Confederation, danced the Viennese Waltz and invited guests to join in. 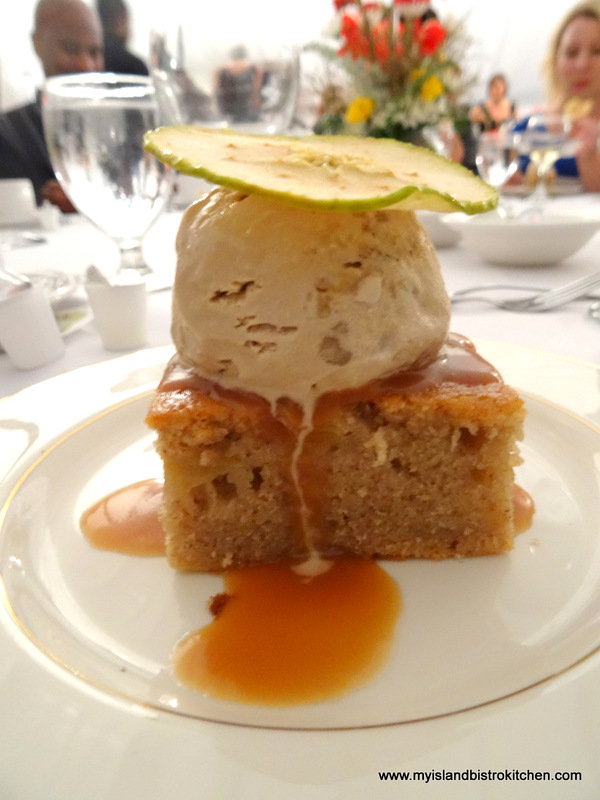 Apple Spice Cake, Caramel Whiskey Sauce, “COWS” Maple Walnut Ice Cream. What’s not to love about this yummy combo? 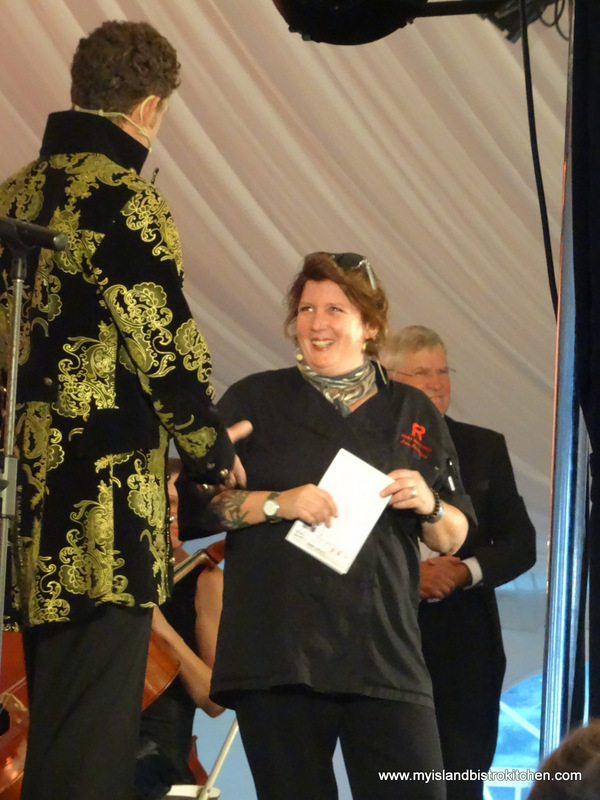 To top the evening off, a late evening concert was provided by the Barra MacNeils while Chef Lynn signed her cookbooks which were available for sale throughout the evening. 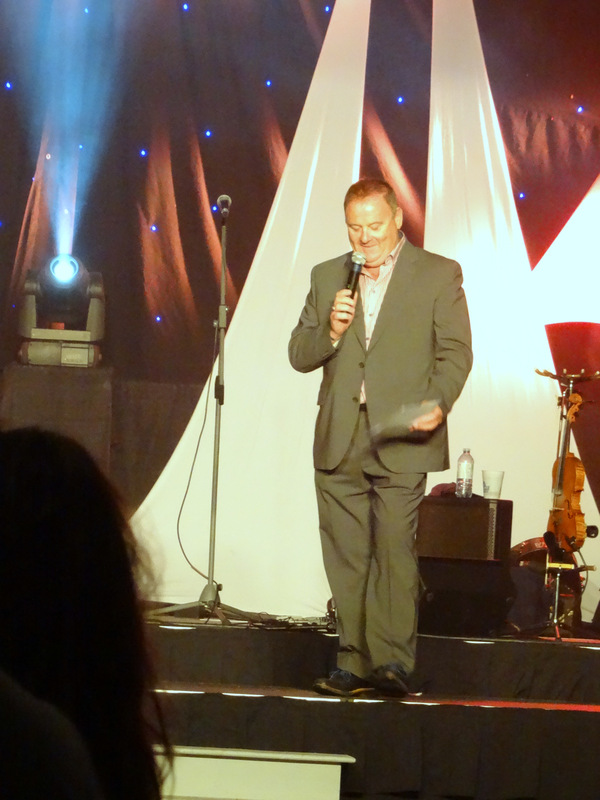 This was a full and entertaining evening – a sold out event. The best way I can describe the experience is first class all the way, from the food to the service to the entertainment. This event personified the “WOW” factor in every way. It was a perfect way to celebrate the creation of our nation. 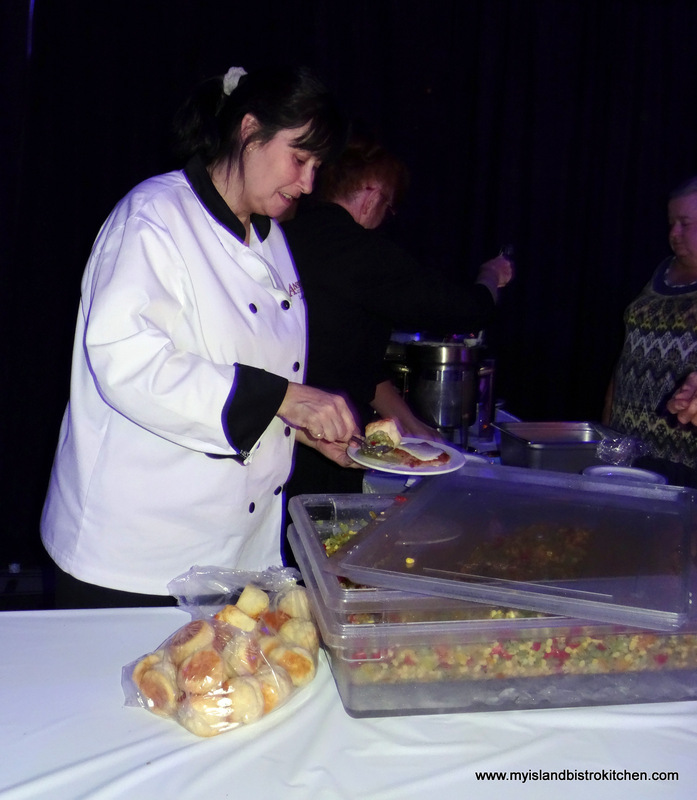 Hats off to the organizers, chefs, wait staff, and entertainers who wowed me yet again at a fine PEI Fall Flavours event. 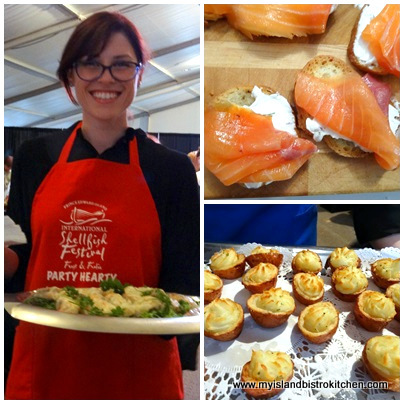 If you have never been to a PEI Fall Flavours signature event, I highly recommend them. 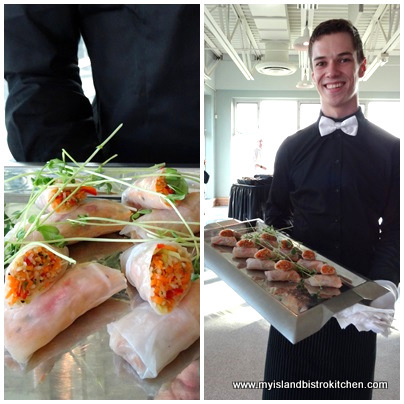 They are well-done and feature Island foods in many different ways. Today, I’m taking you with me to visit a new bakery in Cape Traverse, PEI, just a stone’s throw from the Confederation Bridge in Borden-Carleton. Artisan bakers Rémi Boucher and Stéphanie St-Aubin have been regular vendors at the Summerside Farmers’ Market for the past year. They’ve now taken the leap of constructing an extension on to their home on the Wharf Road. But, it’s not just an ordinary extension to house a bakery. Rather, it takes “bricks and mortar” to a whole new level as this bakery features a wood-fired brick oven. So, let’s meet Rémi and Stéphanie and find out about their bakery. Rémi was born in Summerside when his father was stationed at the now closed military base. While the family moved away when Rémi was about two years old and he grew up in Southern Ontario, Rémi has visited the Island over the years. Recently, the call of his birthplace drew him, his wife, Stéphanie, and their three children ages 15, 12, and 7, to the Island to live. Rémi, who has a degree in aircraft mechanics and a Masters in English literature has worked in various jobs throughout his varied career but says his passion is baking, a passion he has held since childhood. As Rémi says, he’s good at several things but passionate about only a few, one of which is his love of artisan baking. This is a passion shared by Stéphanie who grew up in Quebec and who has a bachelor’s degree in French literature. She, too, has had a passion for baking since early childhood. Six years ago, after losing close family members to cancer, the couple began questioning ingredient content in foods and started taking a closer look at the relationship between food and health. As they looked at lists of ingredients in commercially-produced breads, they decided it was time to start making their own bread. Their bread making began with a cookbook, La leçon de boulangerie, written by French chef and baker Richard Bertinet who runs a cookery school in Bath, England. The couple started making bread using Bertinet’s method. To see if there was interest in their bread, they started first by baking and giving the bread away. Then they started selling it via taking orders for home delivery as a way to test out baking on a high volume basis. Three years ago, realizing they were on to something with their artisan bread, the family travelled across Canada from one coast to the other looking for a new place to call home and for the perfect place to start a bakery business. The lure of PEI was strong so one and half years later they embarked on a house-hunting trip to PEI which led them to the property in Cape Traverse. Rémi says the nearby beach was a selling point but so too was the convenient location between Charlottetown and Summerside and its close proximity to the weekly Farmers’ Market which would be their first place at which to sell their bread and other baked goods on PEI. 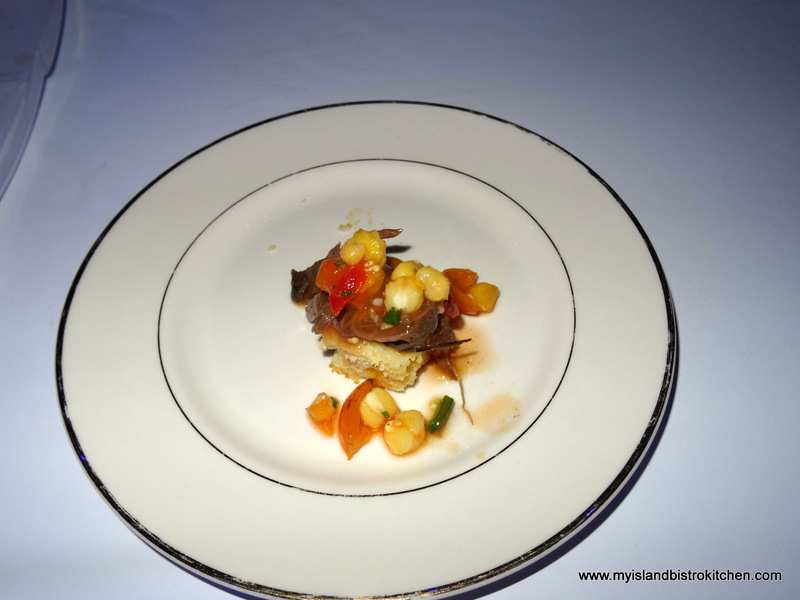 In addition, Rémi says there is a year-round market of local clientele in proximity to Cape Traverse which is located in the middle of the Island along the South shore. From the outset, the couple set up their bakery to be a family-run business. While Rémi is the bread maker, Stéphanie makes some amazing French pastries and other sweet treats! Working out of their own home property allows the couple to home school their three children who also get to see, first hand, how a bakery and business operates. Rémi is an artisan bread baker which means three things. First, his products are all hand made – there is no electric mixer involved. 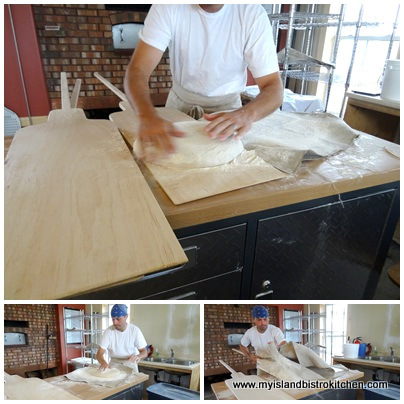 All breads are made by hand. Second, the breads are traditional European hearth style which means no bread pans are used. Loaves are either round or oval-shaped. Third, the oven used to bake the products is a wood-fired brick oven. The oven was specially built for the bakery by Red Clay Construction from Mt Vernon, near Murray River, PEI. The oven heats to very high temperatures and holds its heat. I visited the bakery on an afternoon when Rémi lit the wood fire (using 3’ to 4’ lengths of spruce) in the oven to use for his next day’s baking. As he says, “today’s four-hour fire is tomorrow’s full day of baking”. When I arrived early the next morning, Rémi had cleaned out any remaining ash left from the wood fire. He then filled two pans with water to place in the oven to create steam for the bread baking. The oven temperature was about 500°F by this time and was producing a strong mellow heat. This five-foot deep oven has the capacity to bake about 20 loaves of bread at a time. Rémi makes several kinds of artisan bread (sourdough based) that include Acadia Sourdough, Chili-Cheddar, Olive-Rosemary, Spelt Sourdough, Coffee Raisin Rye, Island Red (made with Gahan Island Red Beer), and Sourdough Baguettes. According to Rémi, the sourdough bread he makes is a more airy bread than traditional loaf bread and, because it is a more wet dough that is hand-mixed, it has more open crumb with uneven bubbles (or what I would refer to as “air holes”) in the bread’s texture. This type of bread falls into the slow food movement category because it takes more time to produce it as it must have significant rest time for its enzymes to break down. Rémi says that sourdough breads are very filling and, after consuming them, one is not left feeling hungry. Rémi explains that, apart from the texture, sourdough bread has different characteristics from other types of bread and should be treated differently. First, is the absence of fat, milk, and sugar. He claims fat content in bread shortens its shelf life, causing it to dry out faster. Second, with artisan breads, Rémi advises against storing them in plastic bags because that can cause breads to become moldy. Instead, he recommends they be stored in paper bags or simply wrapped in a cloth. Third, the bread is suitable for different uses as it ages. For example, on the day it is baked, the bread can be eaten fresh. On day two, it is best toasted, and on the third day (assuming there is any left over), it is suitable for French toast. But, this bakery is not just about bread. The couple also make croissants, pies, sticky buns, various French pastries, éclairs, and old-world style artisan pizzas. 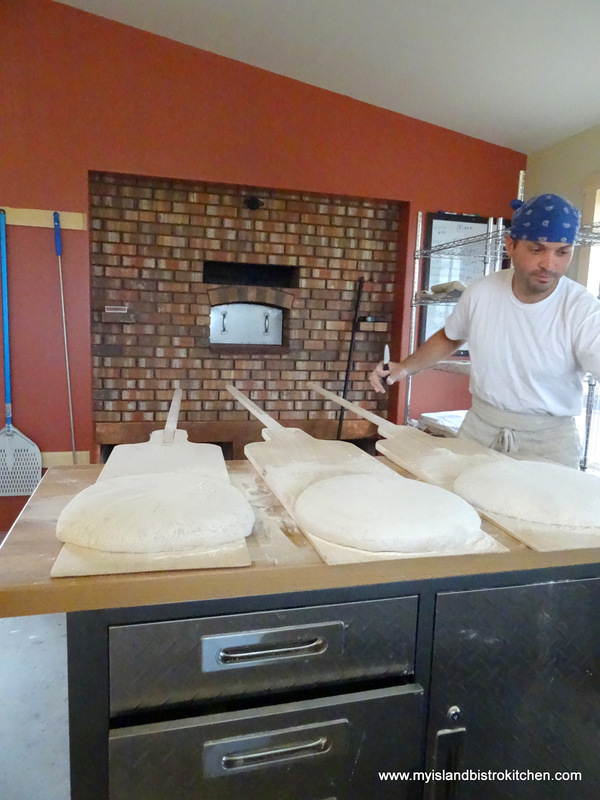 The sourdough and olive oil-based pizzas are baked in an 800°F to 900°F oven fueled by a hardwood fire. This is what is called live fire cooking because the oven can bake a pizza in less than 2 minutes! These are not your typical meat, tomato sauce, and mozzarella cheese type pizzas. Look for new and unique flavour combinations that include, for example, pesto and walnut; crimini; roasted pepper and feta; pear and camembert; and fig and black garlic. Rémi says his Italian-style pizzas follow the “Rule of Three” – three ingredients only – i.e., each pizza should have sauce, cheese, and one other ingredient. When possible, the bakery uses local and organic products. For example, the majority of the raw product for the stone ground organic flour used in their products is grown by Barnyard Organics in Freetown, PEI, and milled at Speerville Four Mill in New Brunswick. The pork products for the pizzas come from Ranald MacFarlane’s farm in nearby Fernwood. The black garlic comes from Eureka Garlic near Kensington. The tomatoes for the homemade tomato sauce for pizzas come from Atlantic Organics in Kensington. The bakery is currently using between 80-100 kilos of flour a week to meet demand which continues to grow. 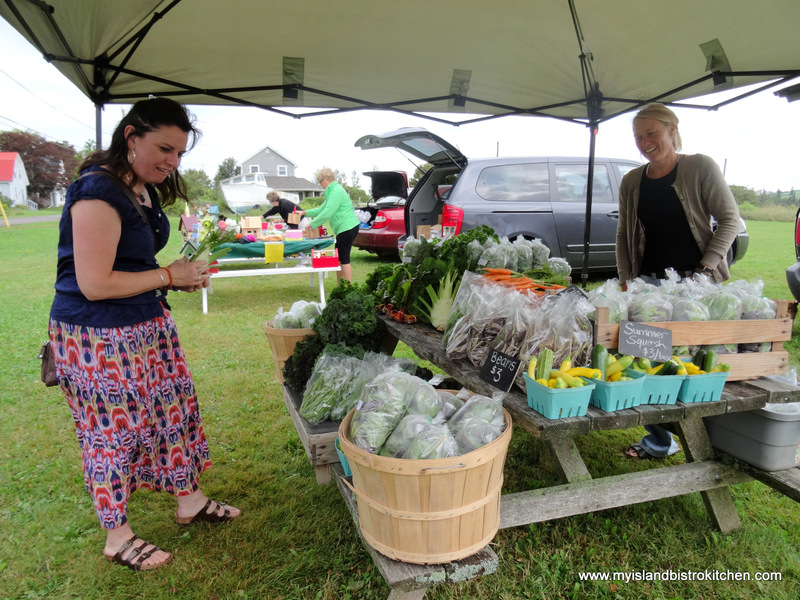 This summer, in addition to the Saturday morning Summerside Farmers’ Market, the couple also sold their products at the Farmers’ Market in Stanley Bridge and in a couple of nearby local stores. As well, Rémi also fills special orders like, for example, an order for 100 croissants on the day I visited the bakery. In addition, the bakery also has arrangements to supply some Island restaurants and food vendors with breads. When asked what the greatest challenge is to running the bakery, Rémi says his challenge is in achieving an acceptable work/life balance between filling orders and raising a family. He says he gets great satisfaction each time a perfect croissant or loaf of bread comes out of the oven or when he hears positive feedback on his pizzas. The couple say that their greatest satisfaction is knowing they are preparing good organic food to nourish the body and soul and they enjoy bringing good food to people. Wondering what the “fifth ingredient” stands for in the bakery’s name? 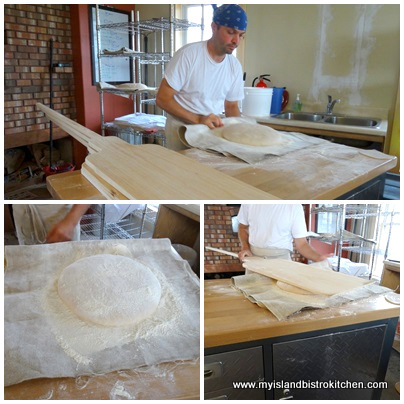 Rémi says there are four basic ingredients in his bread – flour, water, yeast, and salt. The fifth ingredient is love. That’s the ingredient that can only come from someone who has found his true passion and calling. Spend time with Rémi and Stéphanie and it is evident they have a true passion for their artisan baking.